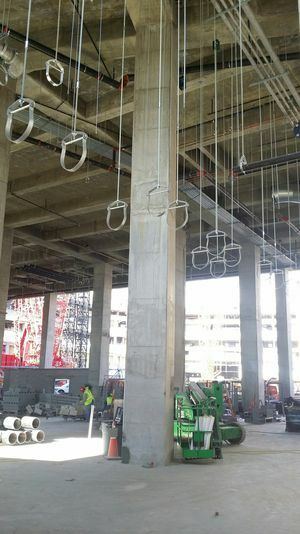 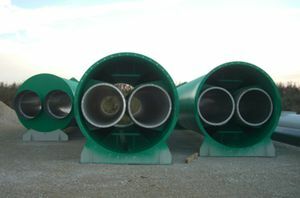 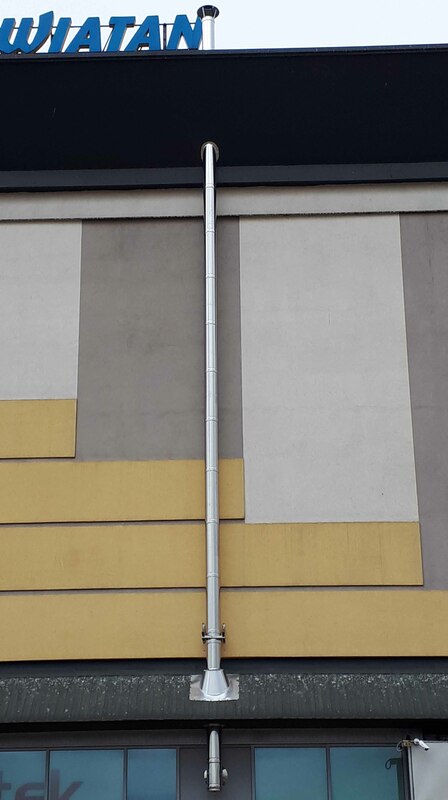 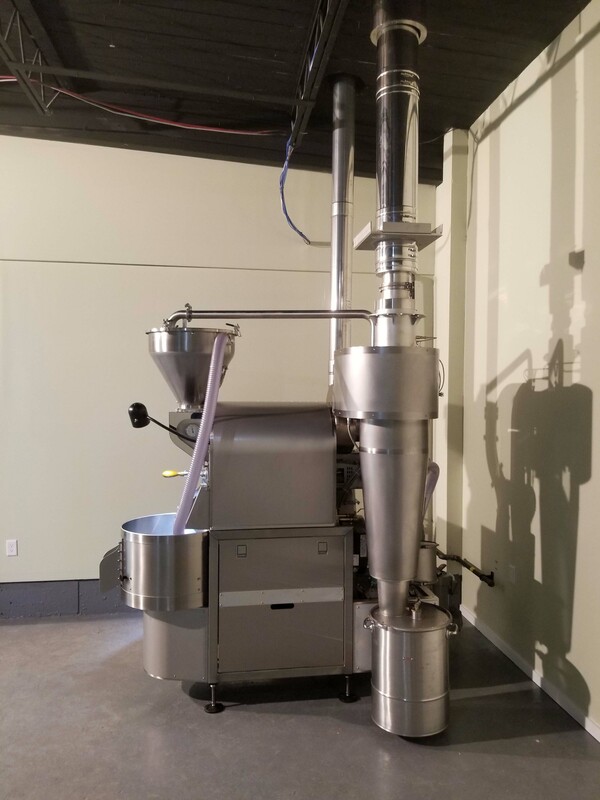 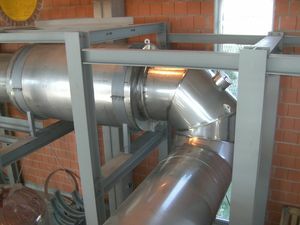 Connection piece with two 90° elbows and length of 13.1'. 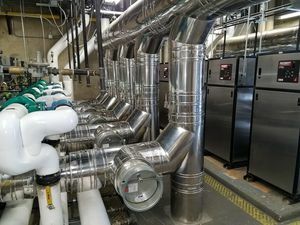 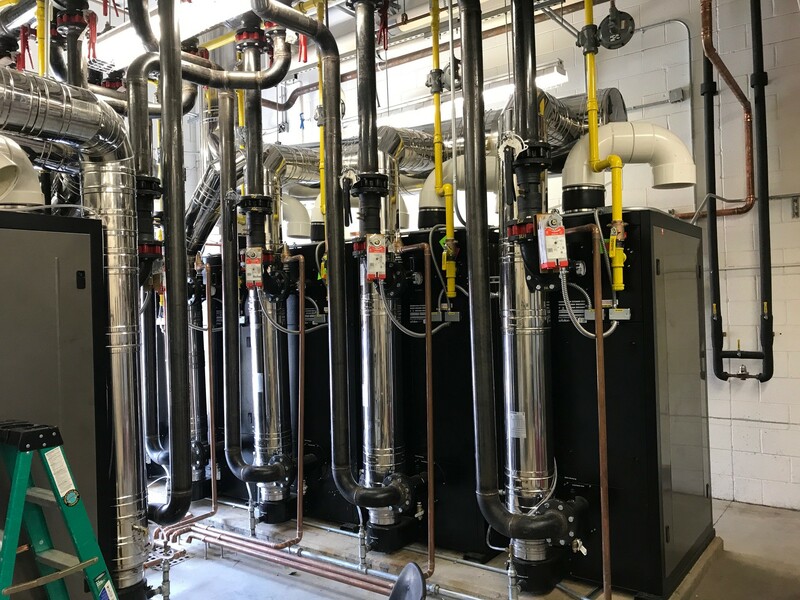 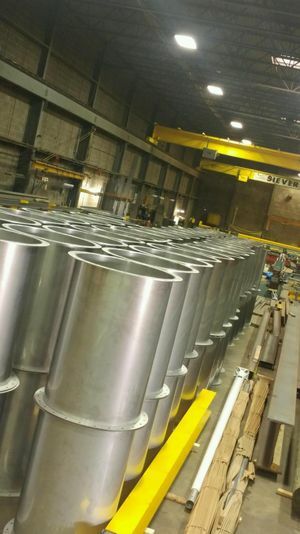 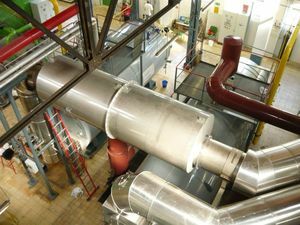 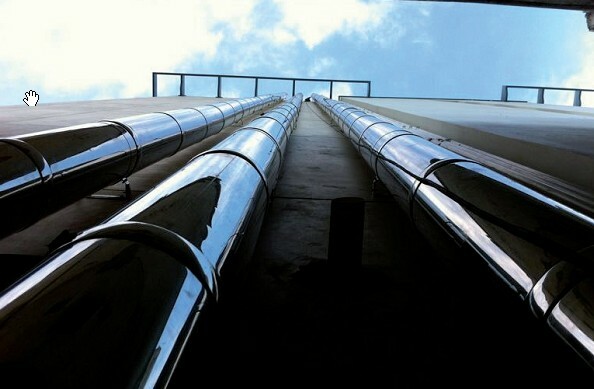 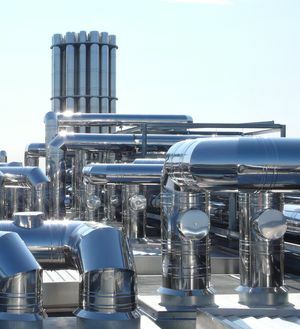 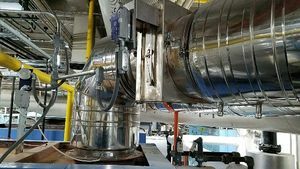 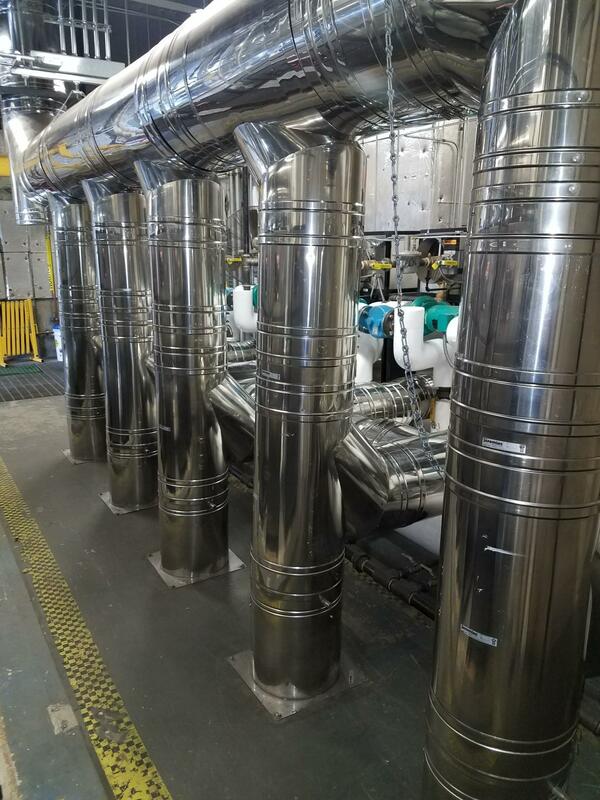 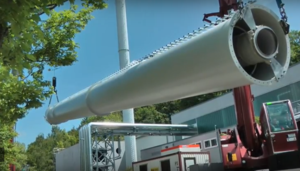 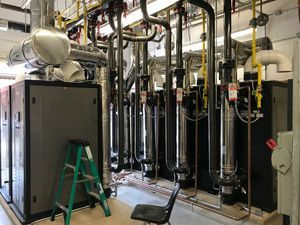 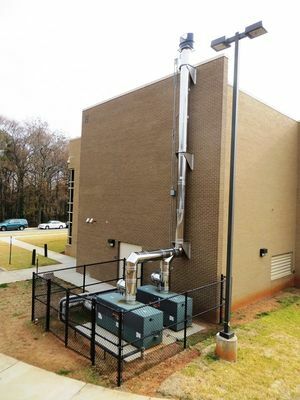 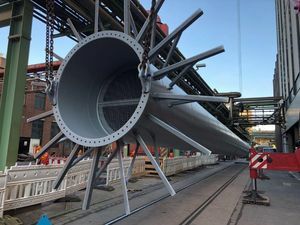 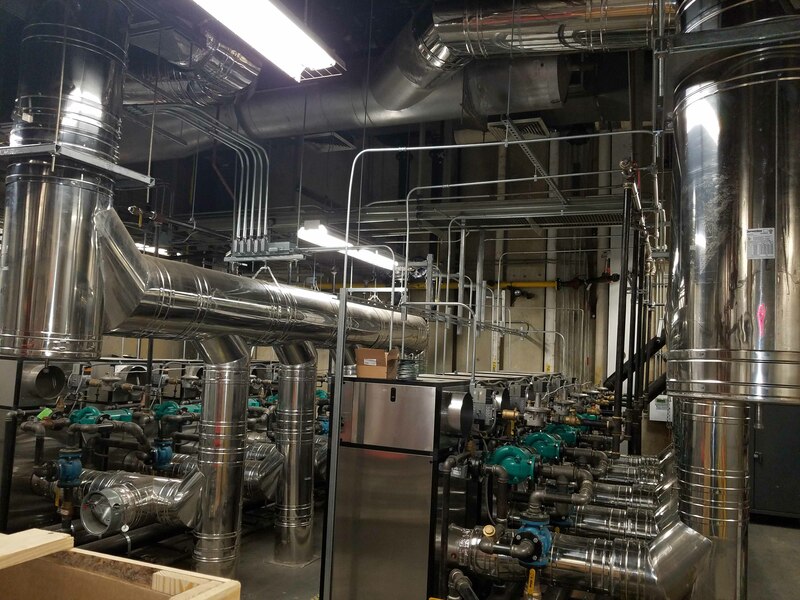 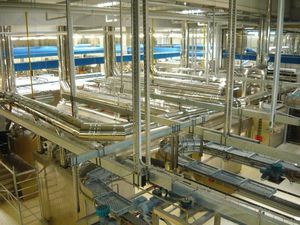 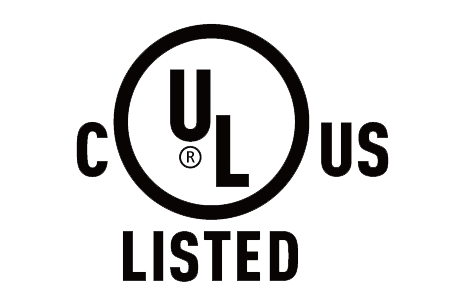 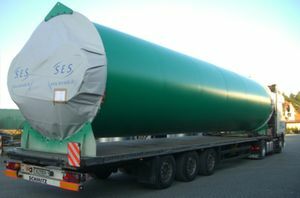 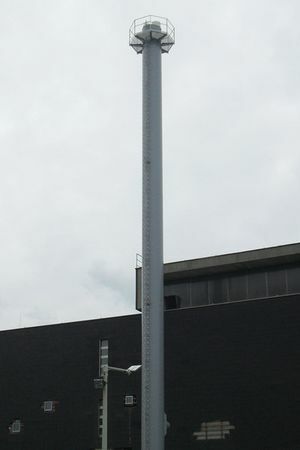 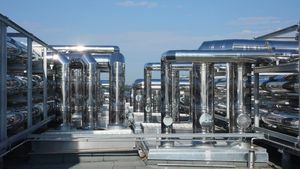 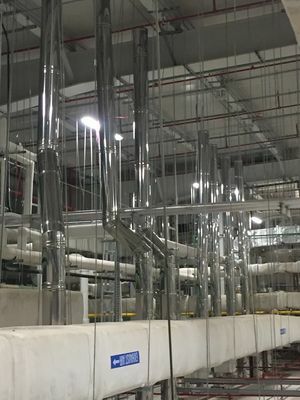 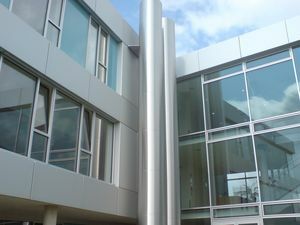 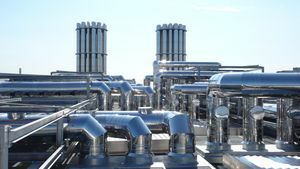 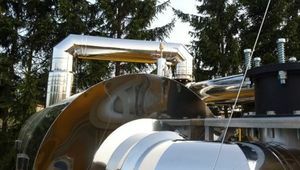 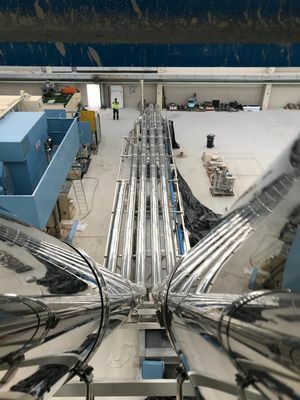 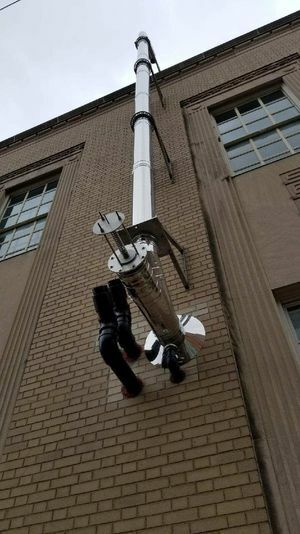 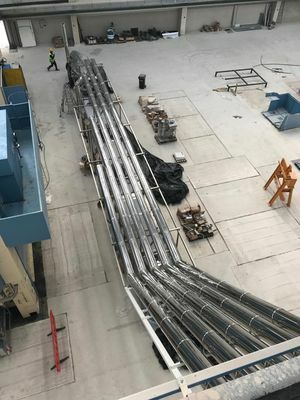 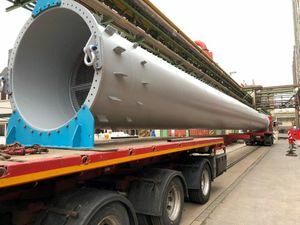 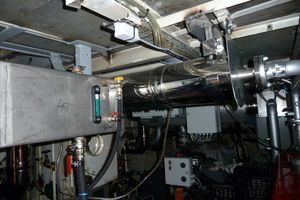 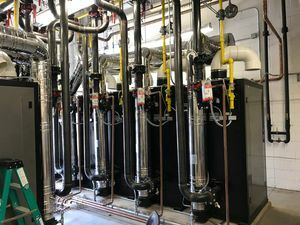 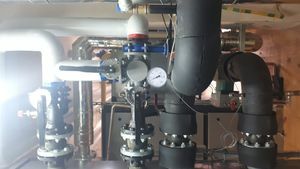 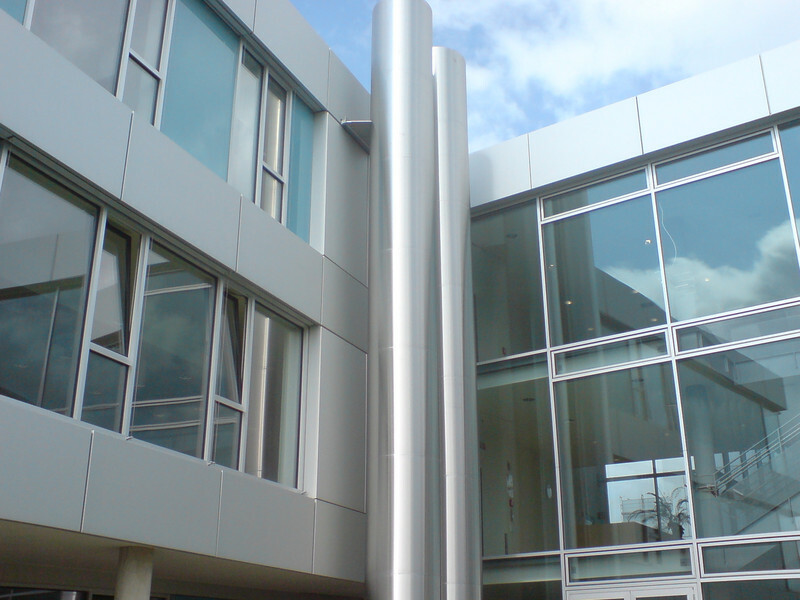 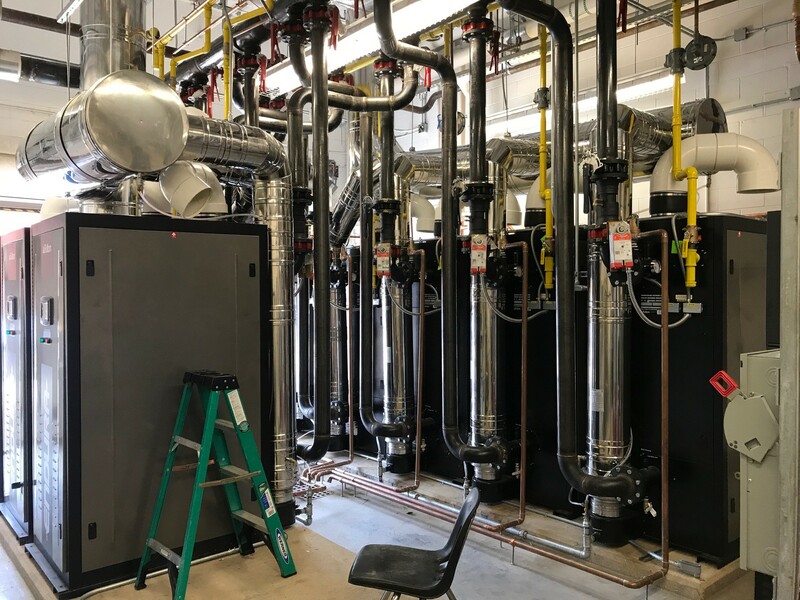 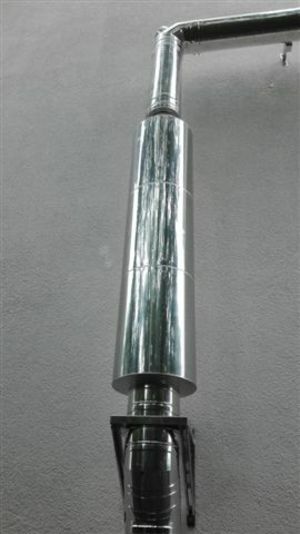 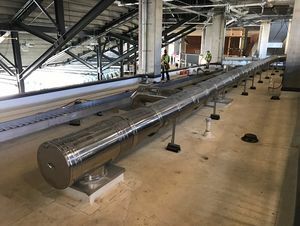 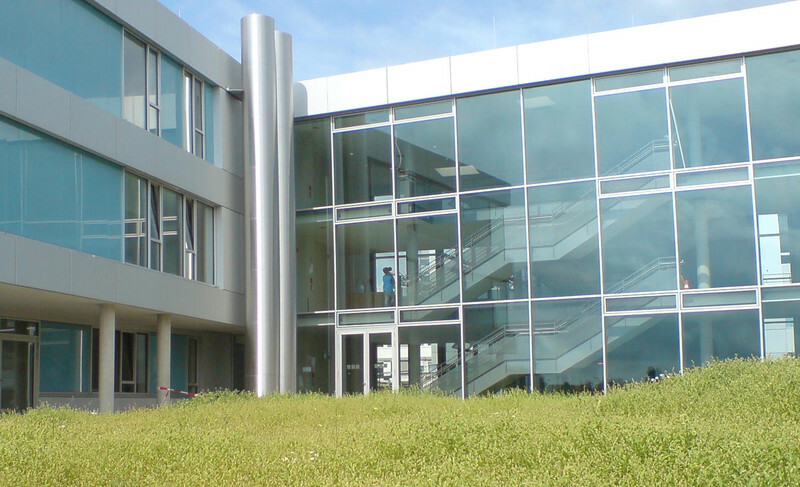 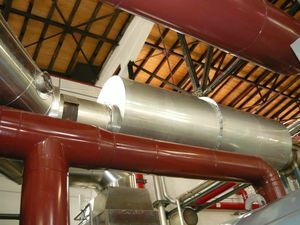 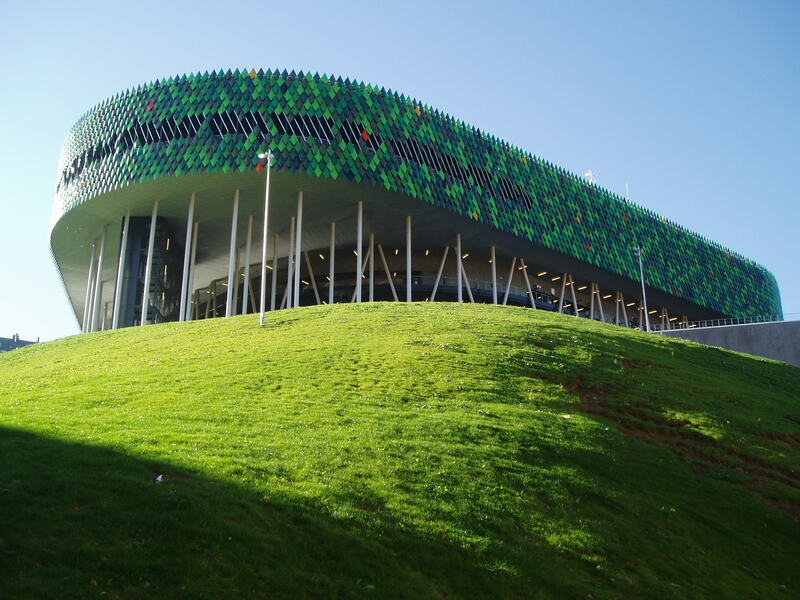 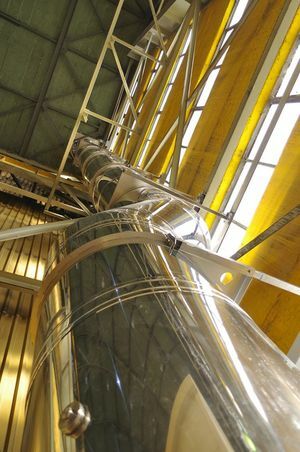 The complete length of the flue pipe of fuel cells and combined heat and power plants is about 492.1 feet. 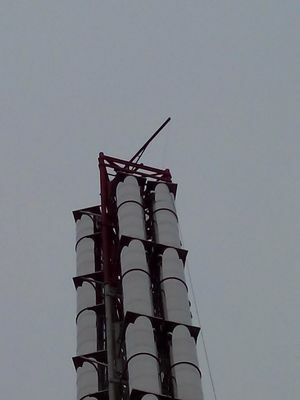 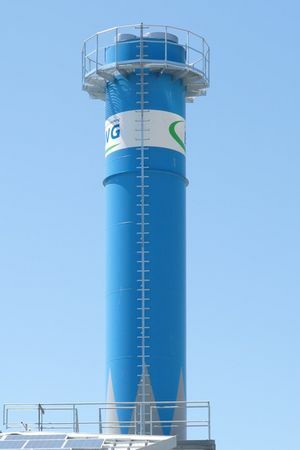 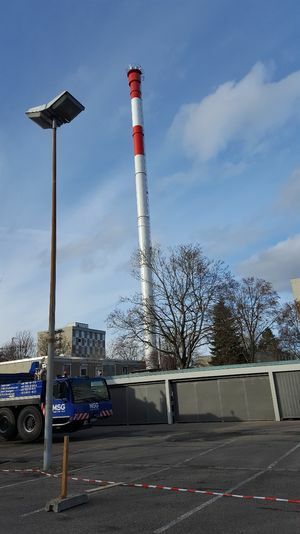 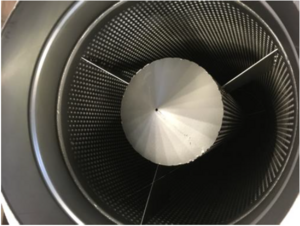 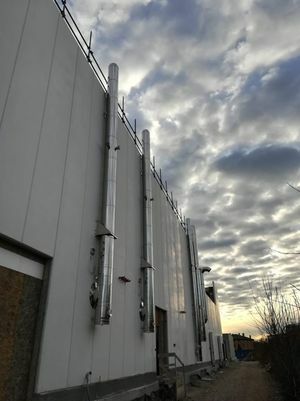 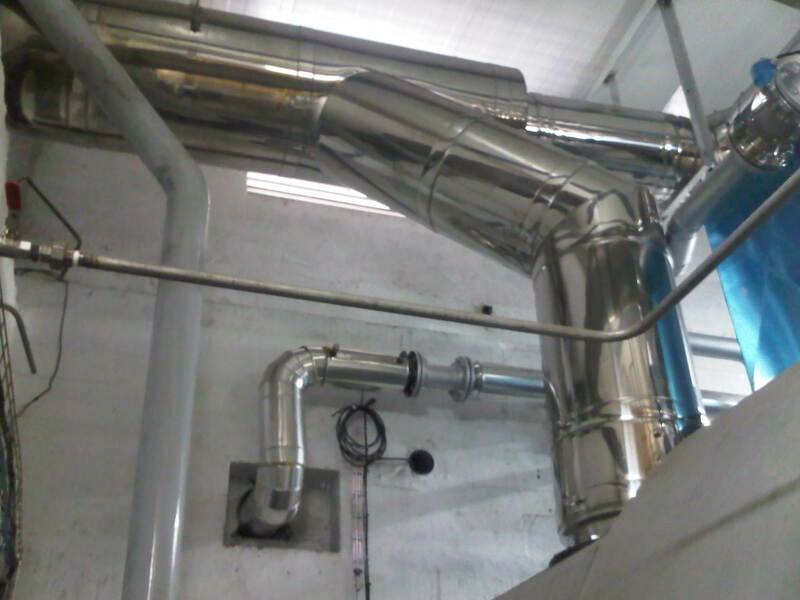 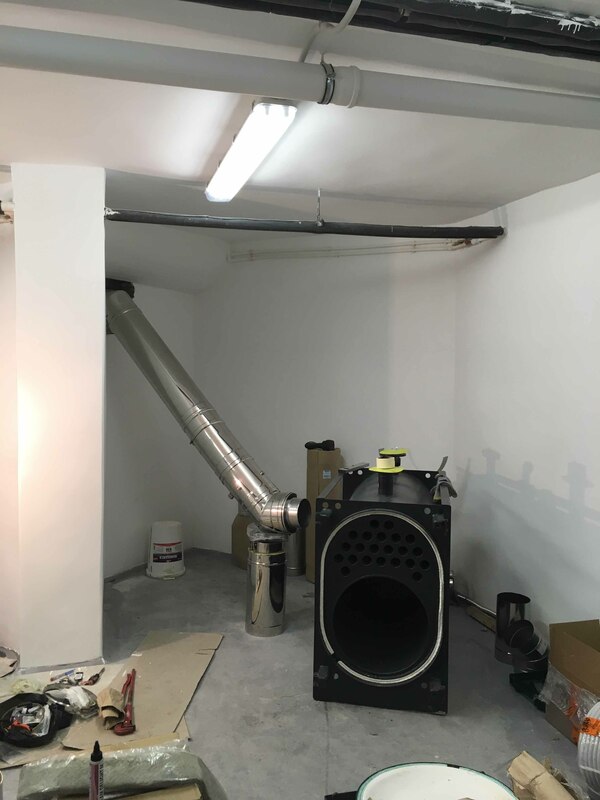 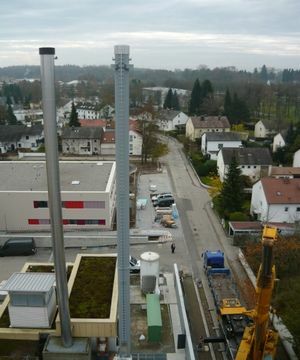 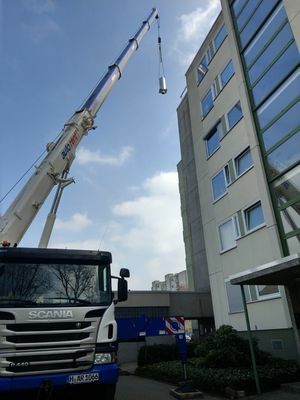 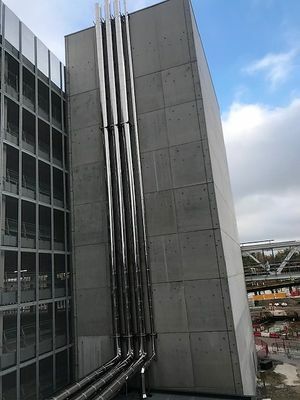 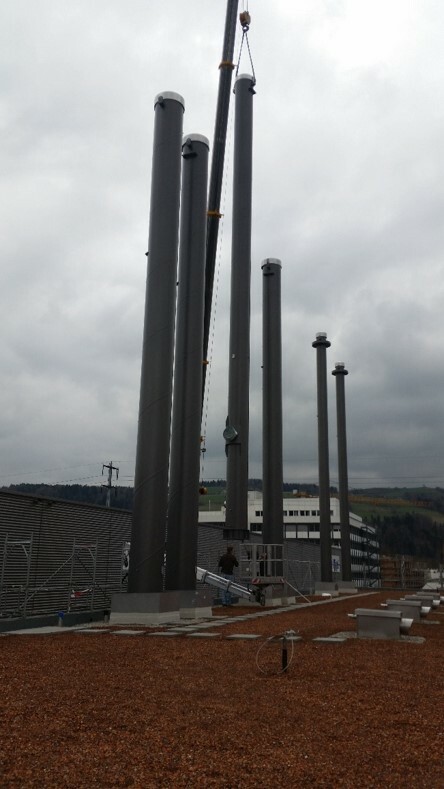 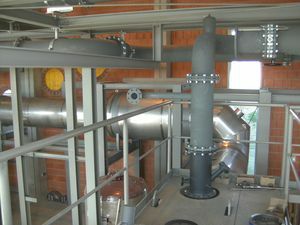 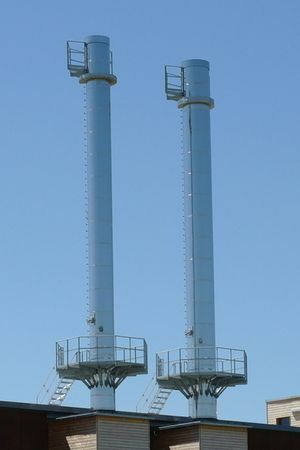 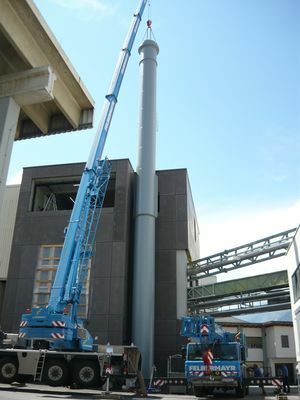 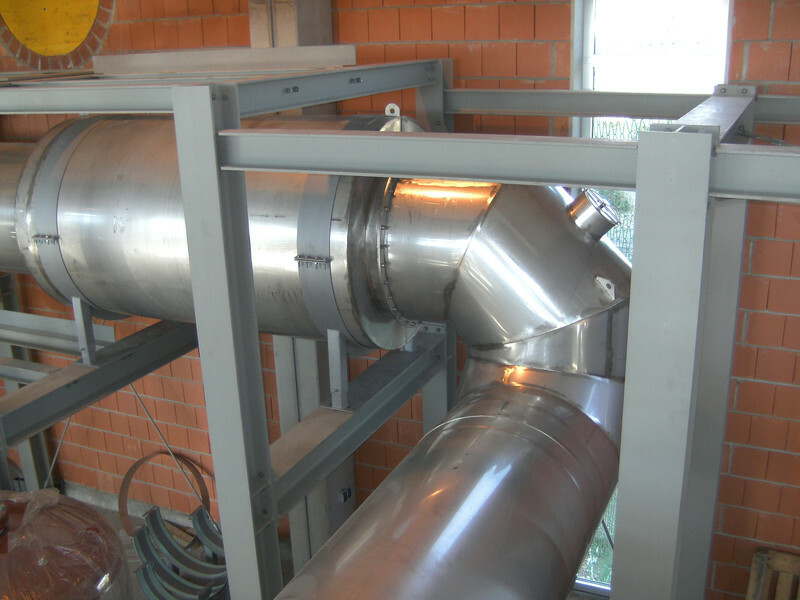 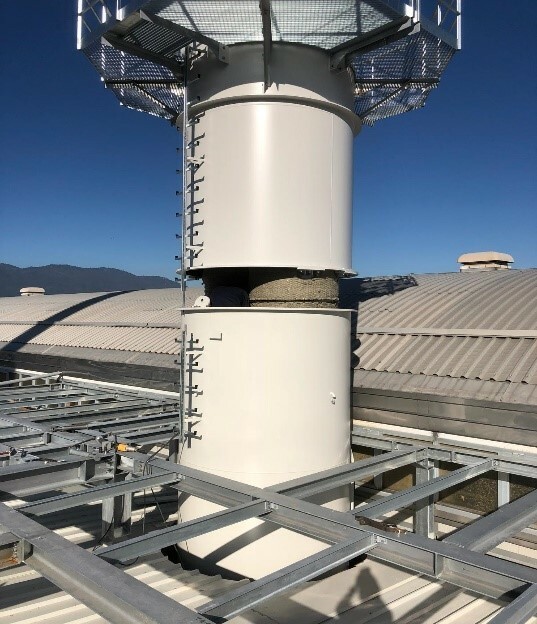 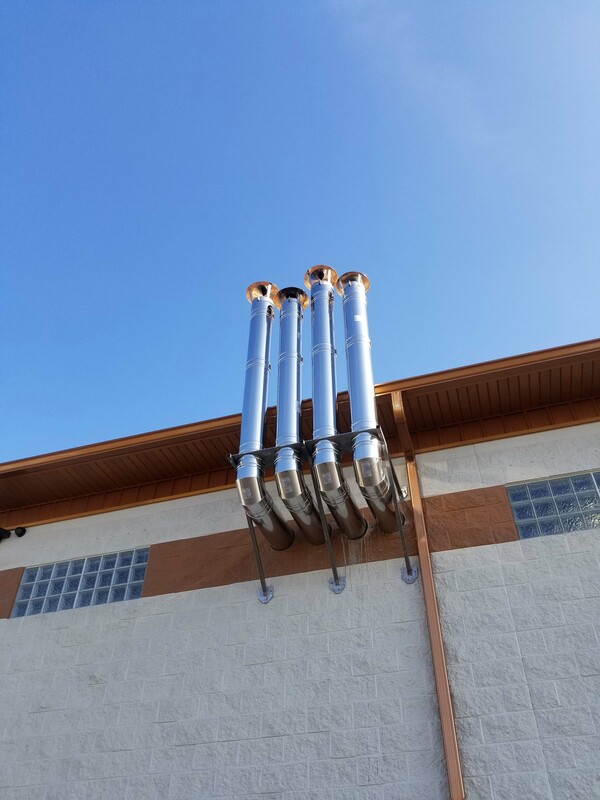 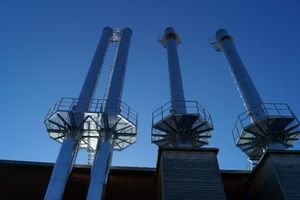 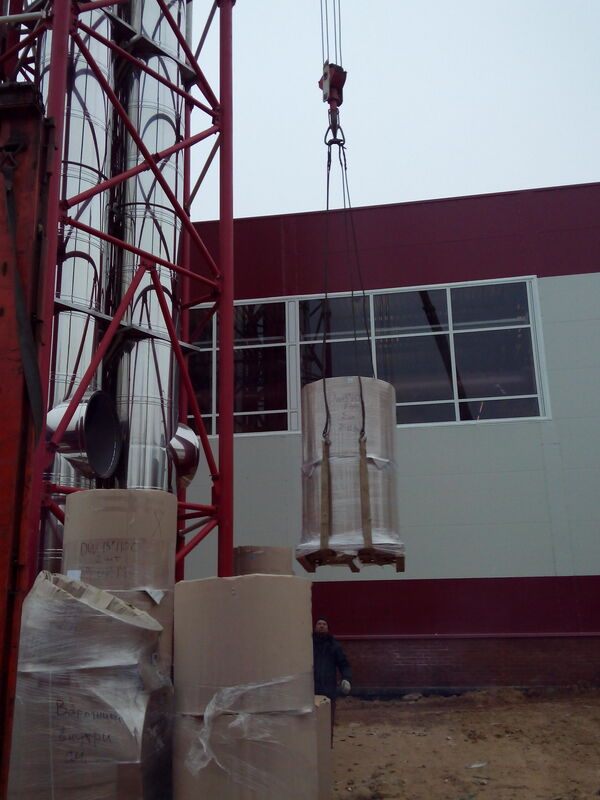 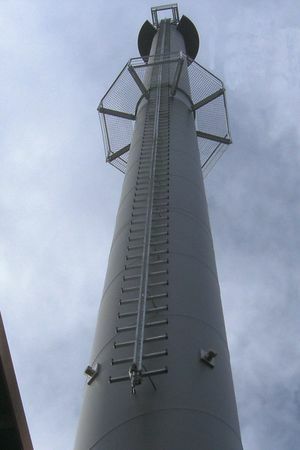 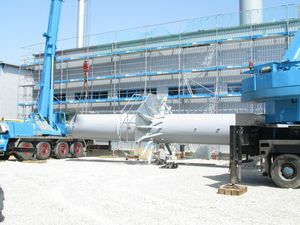 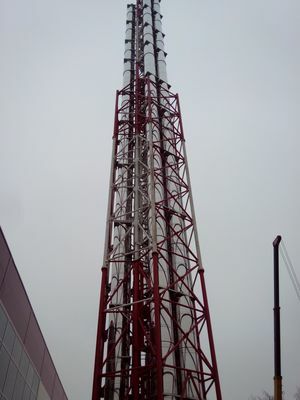 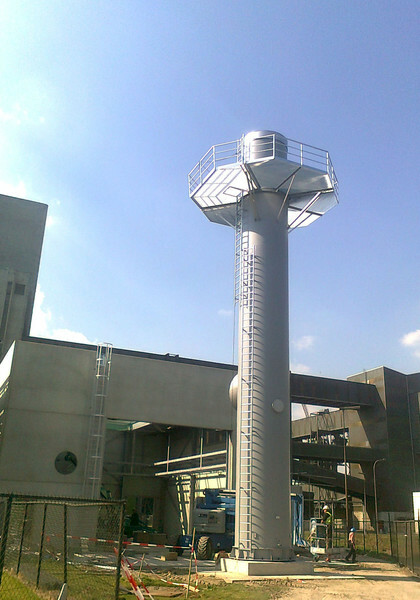 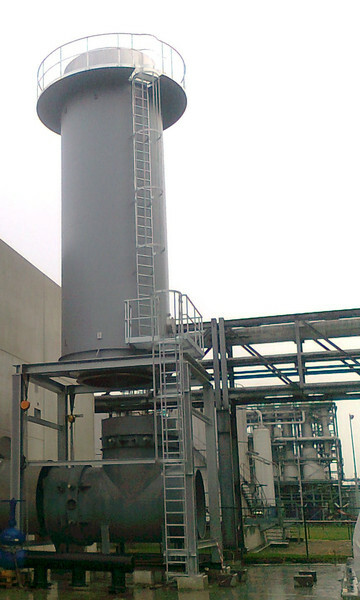 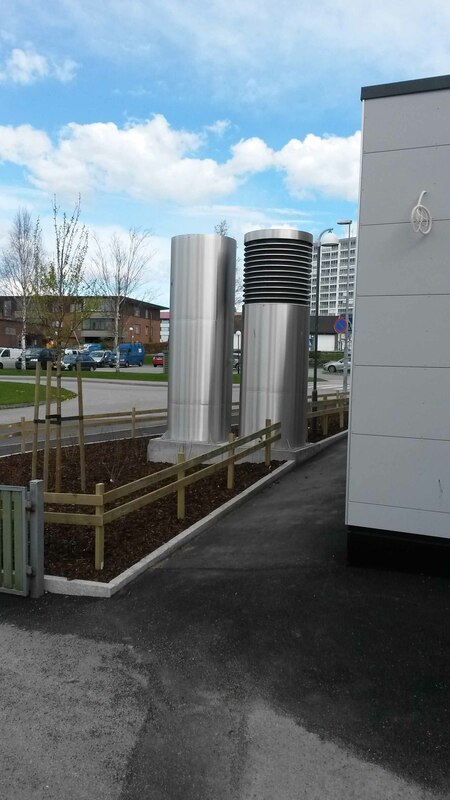 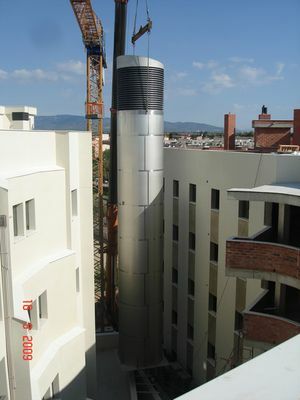 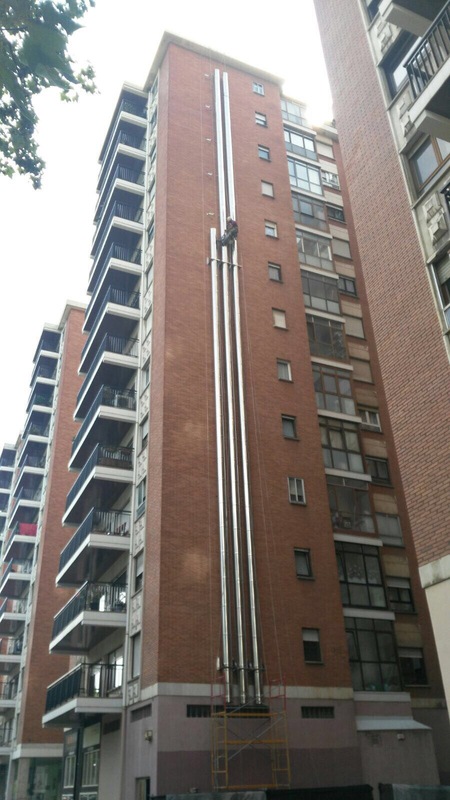 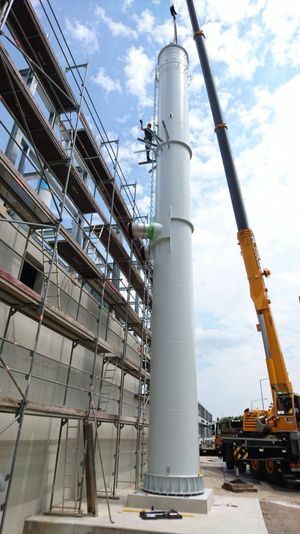 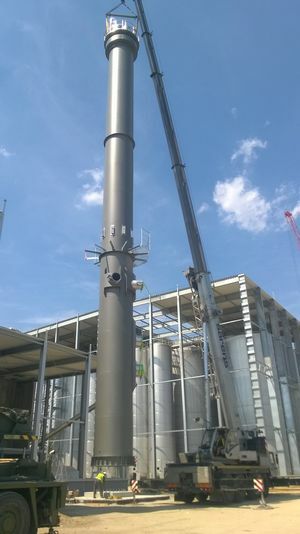 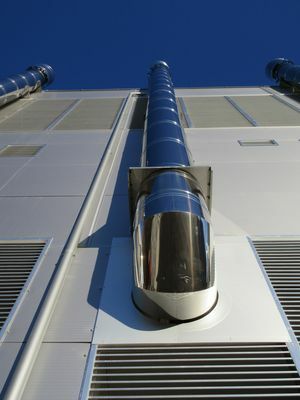 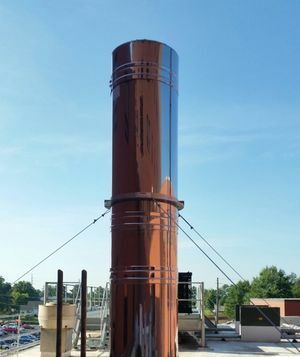 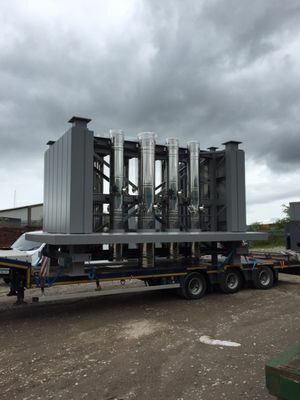 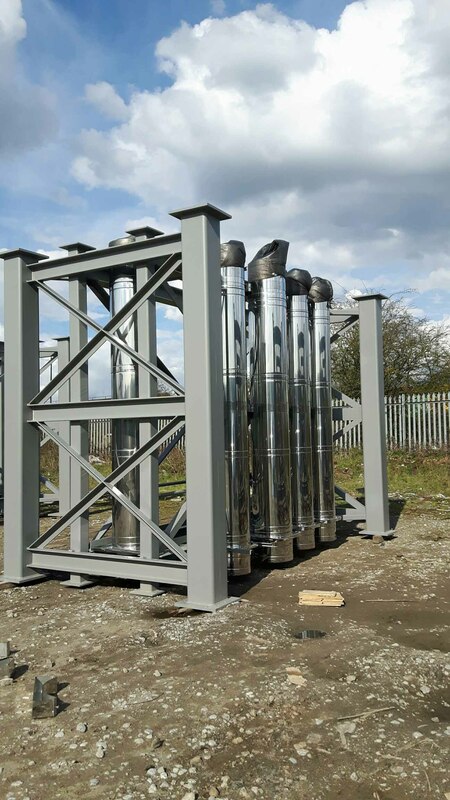 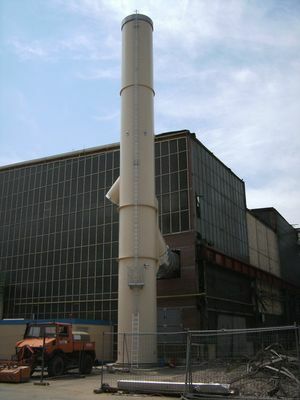 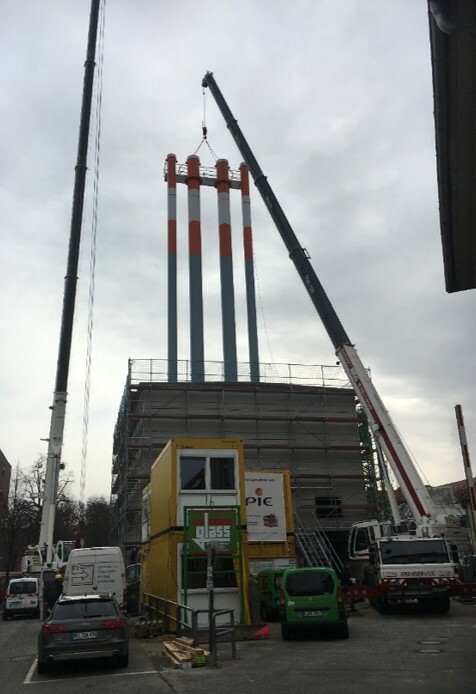 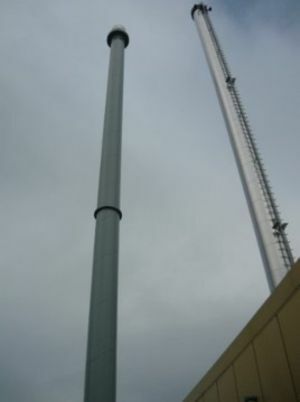 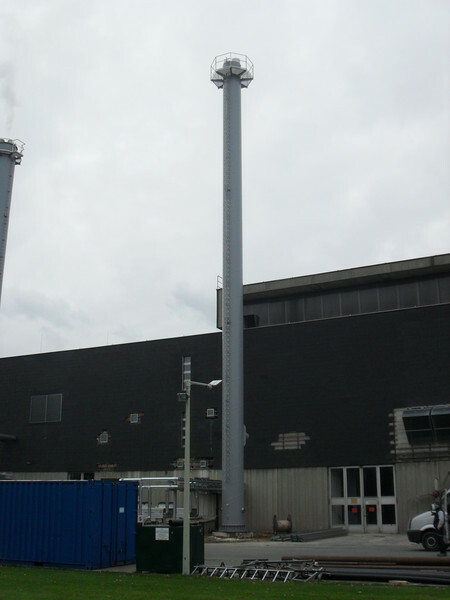 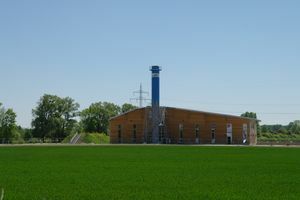 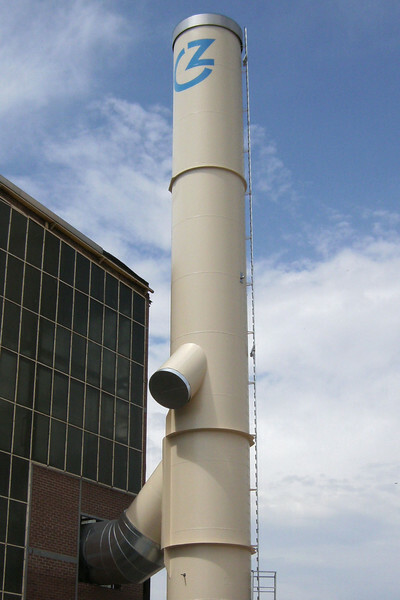 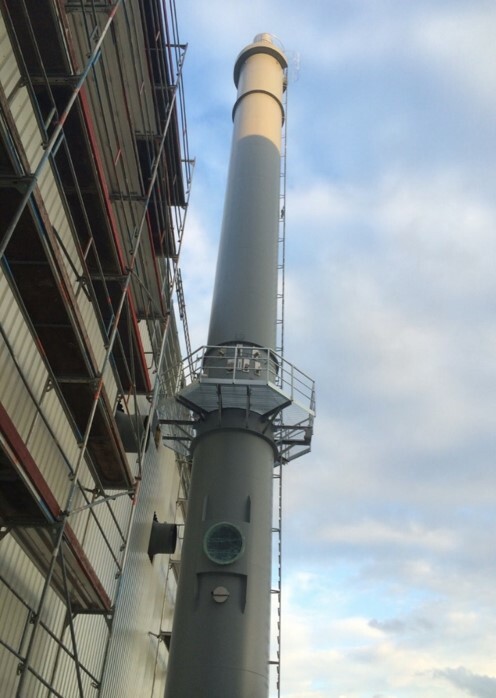 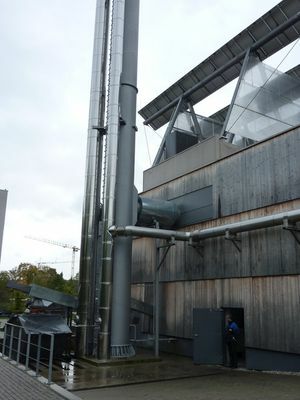 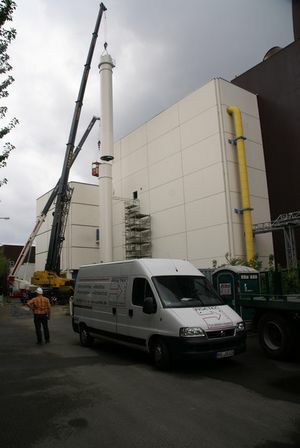 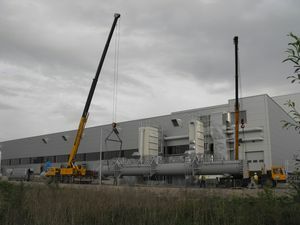 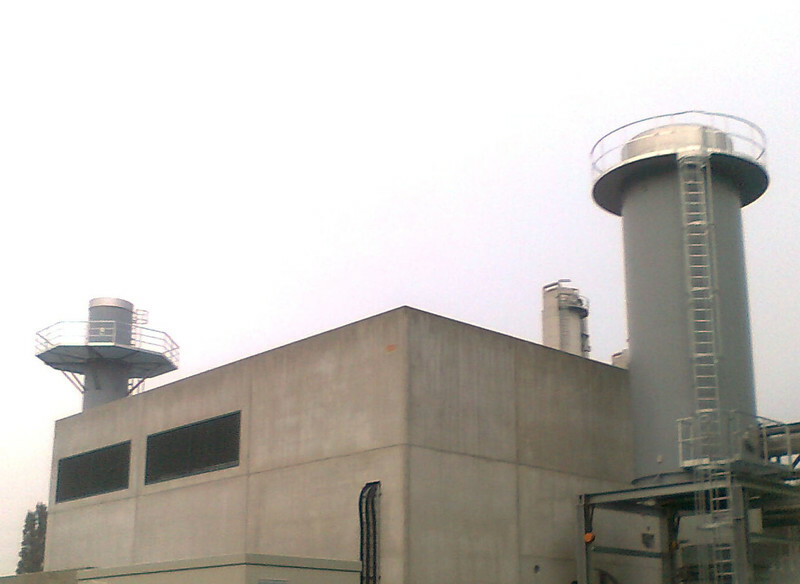 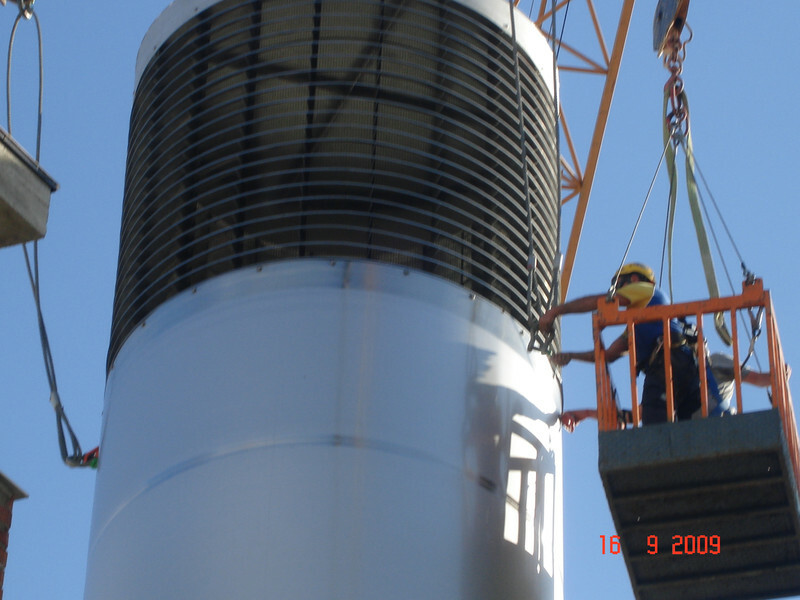 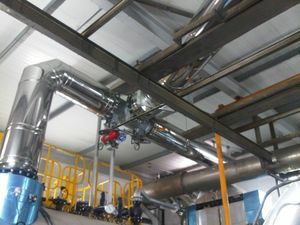 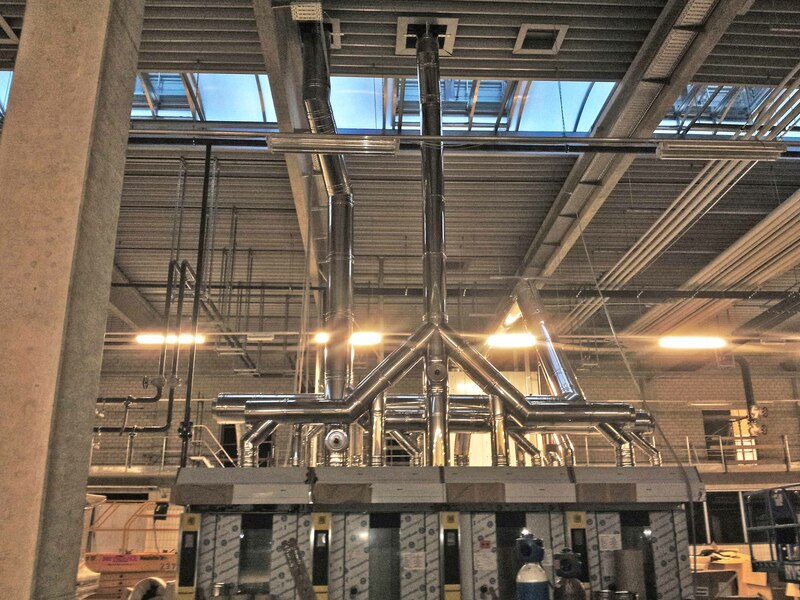 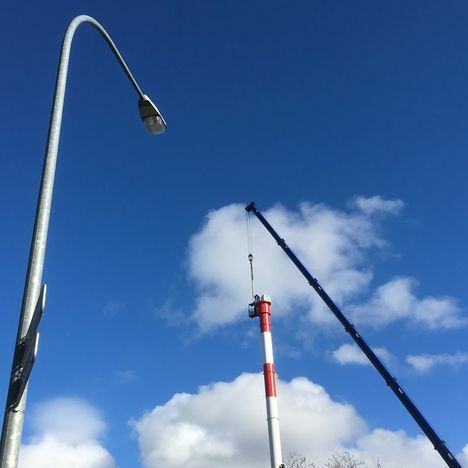 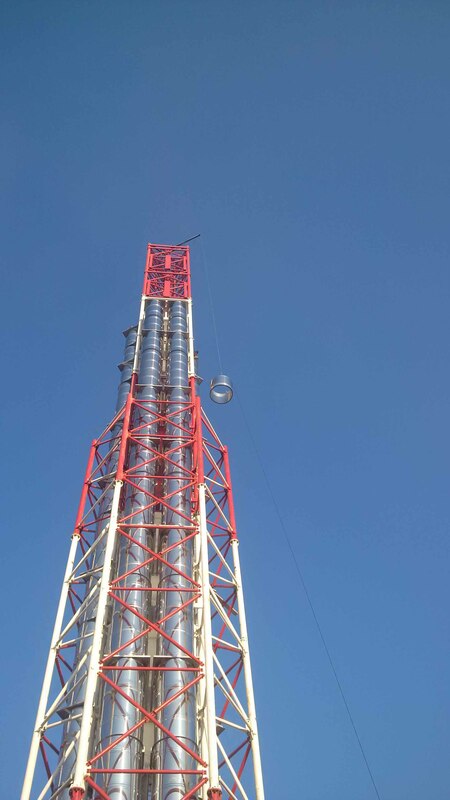 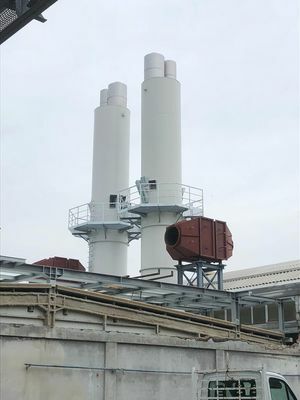 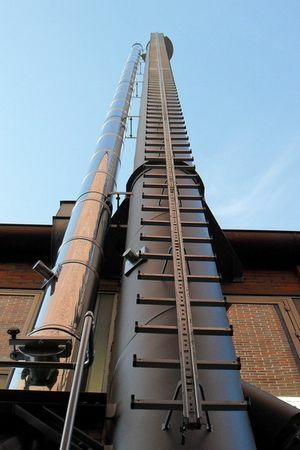 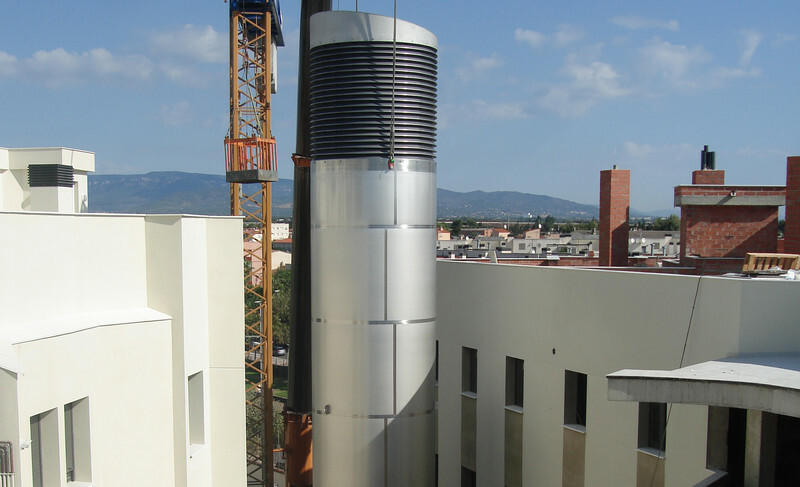 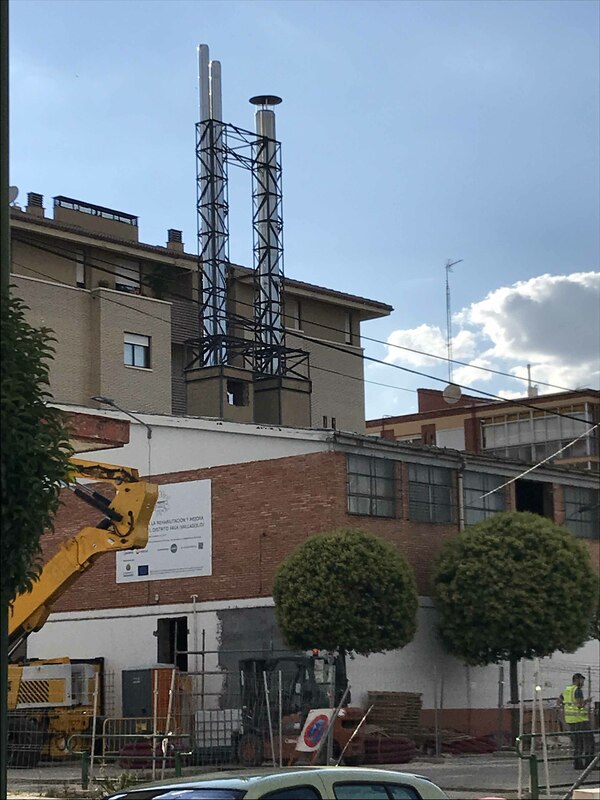 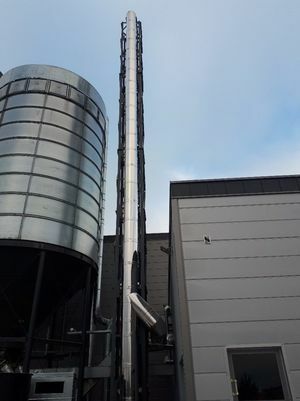 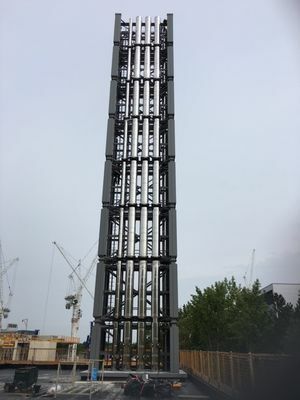 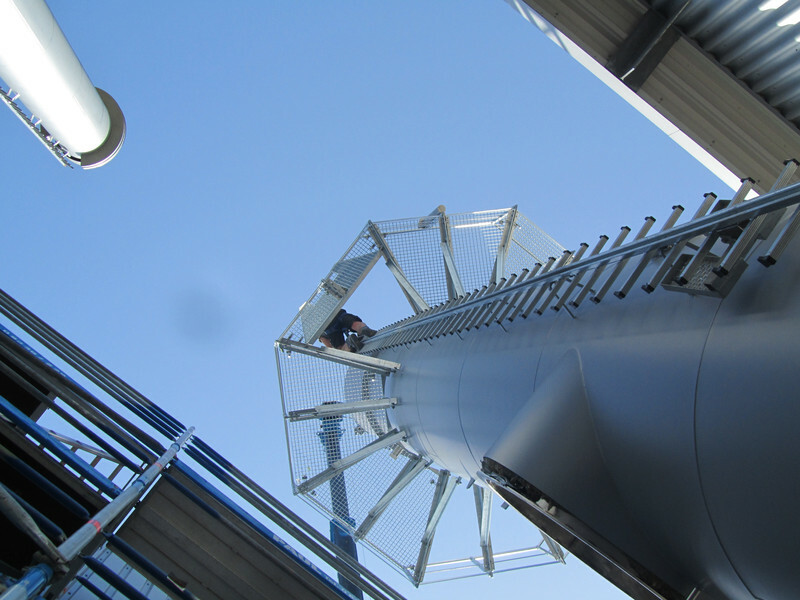 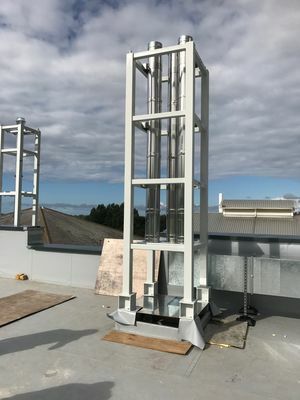 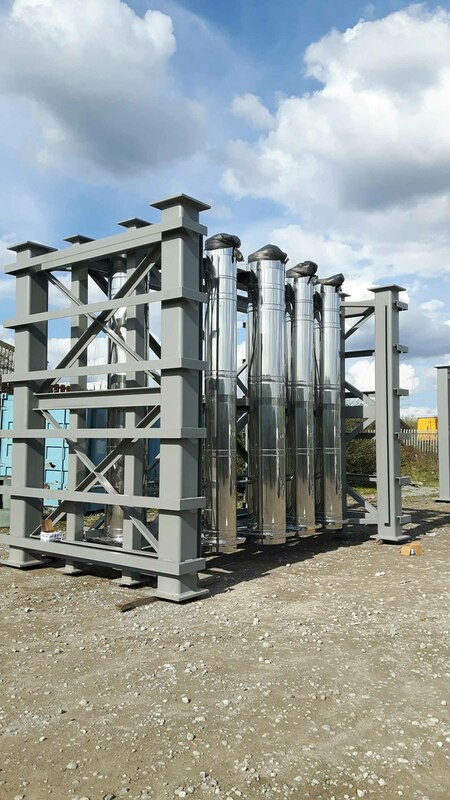 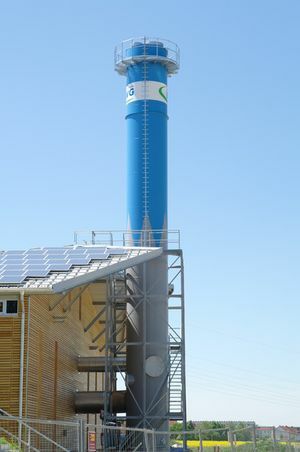 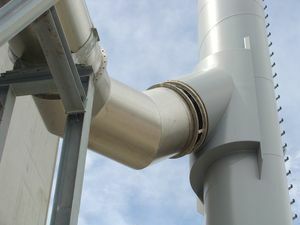 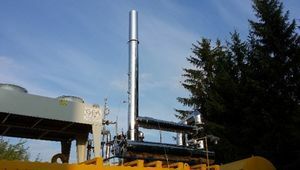 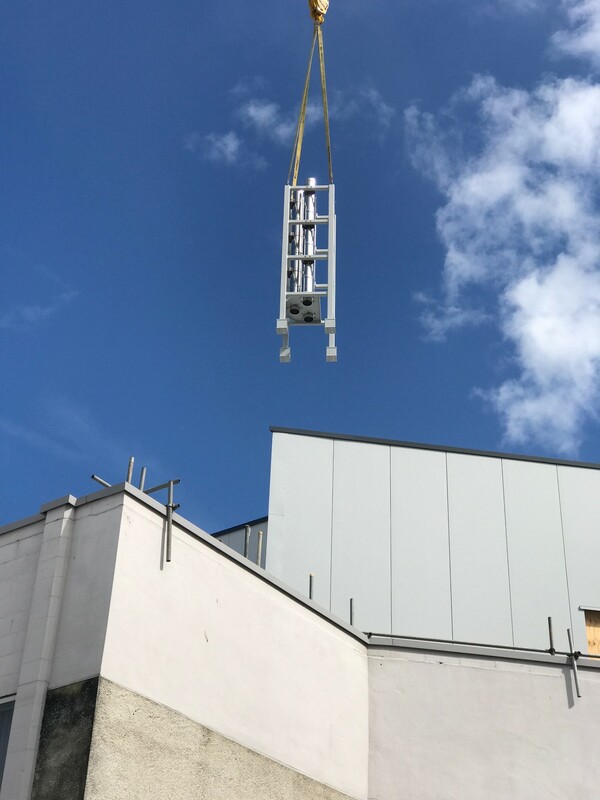 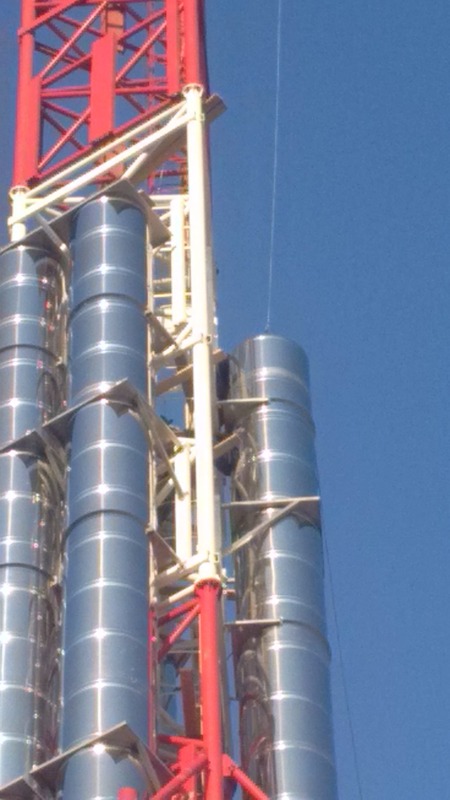 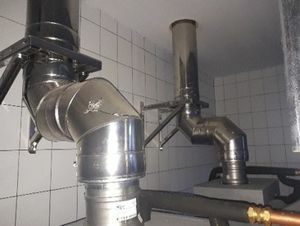 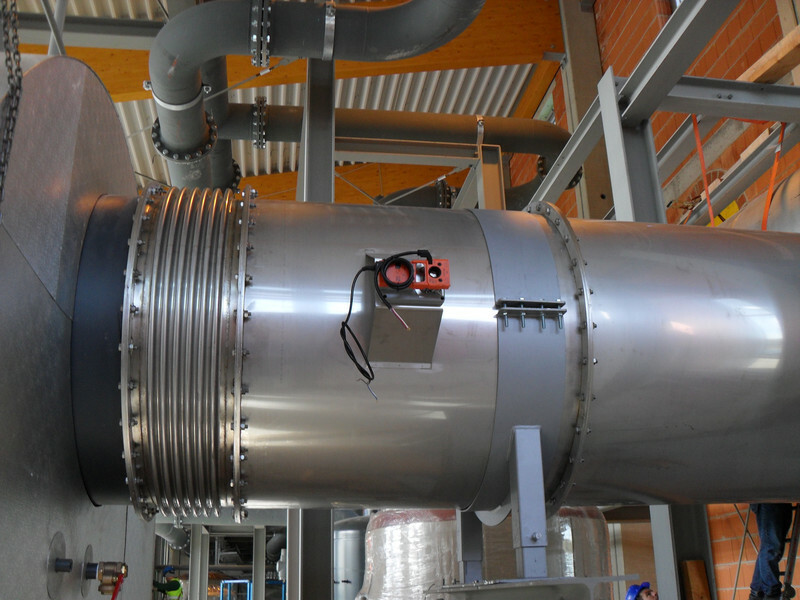 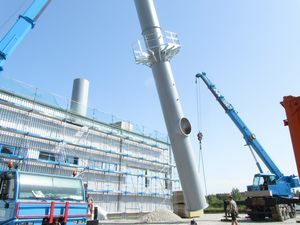 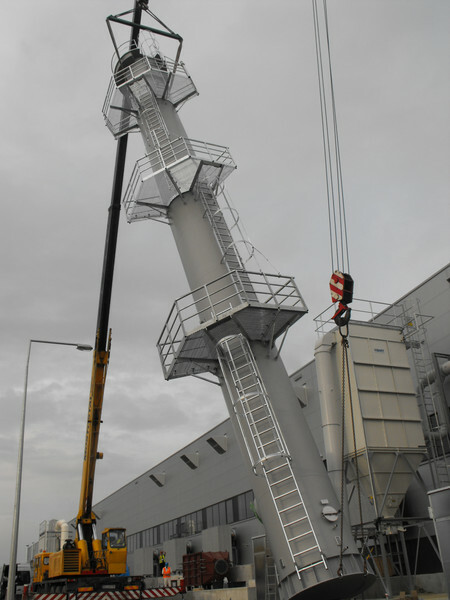 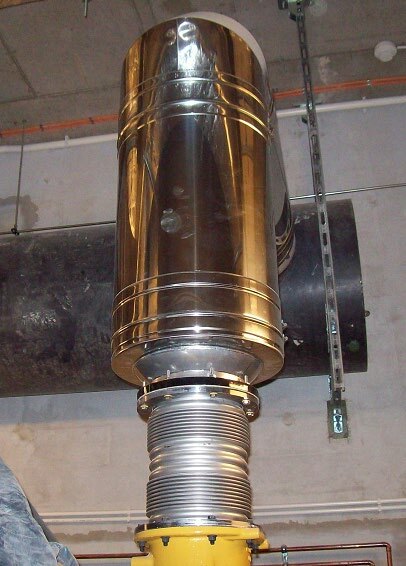 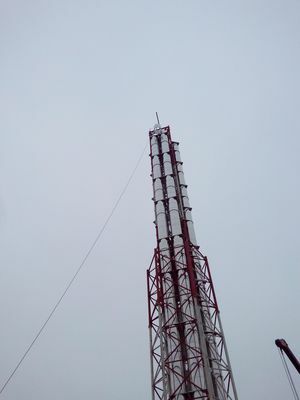 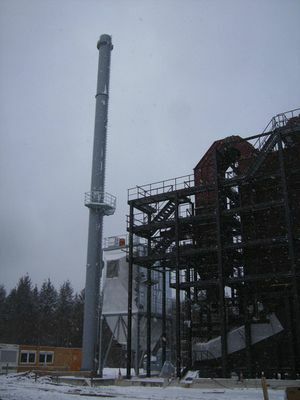 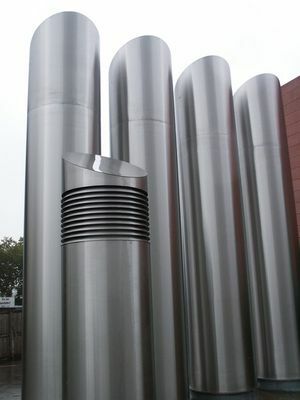 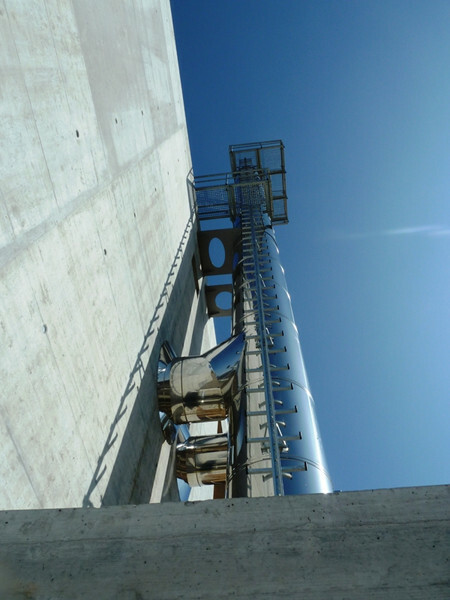 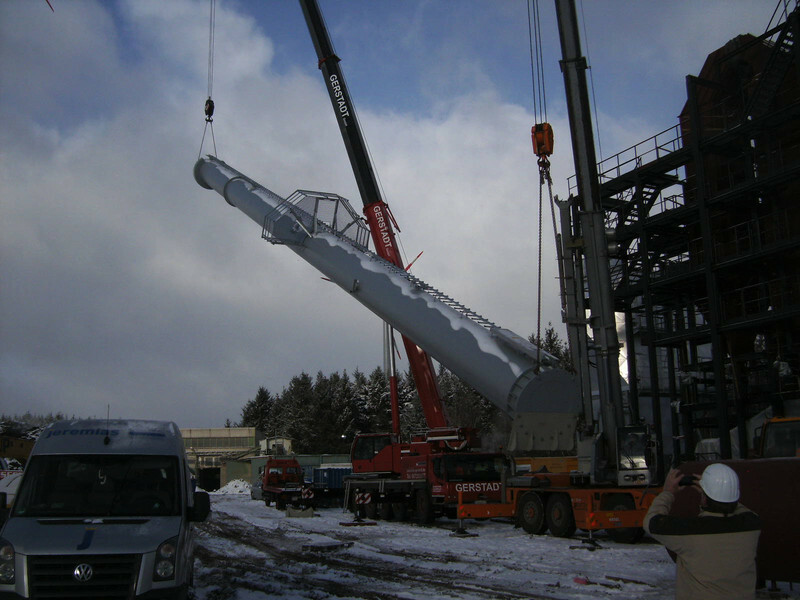 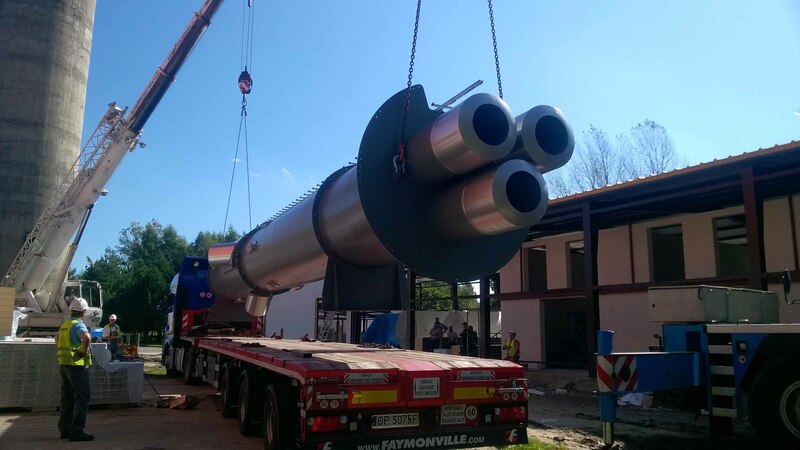 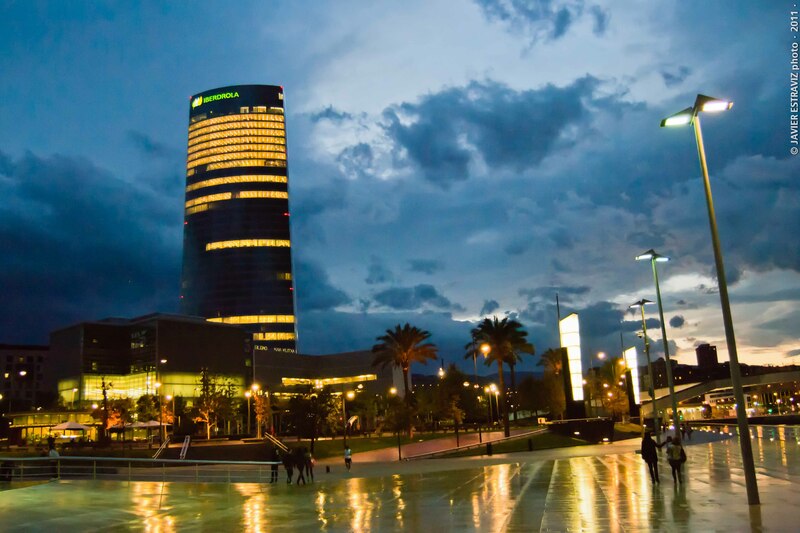 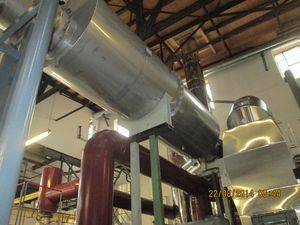 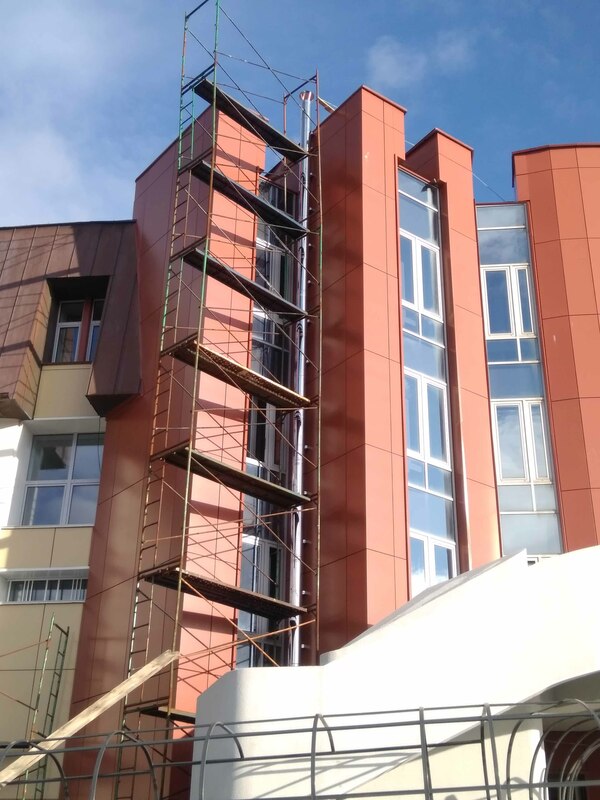 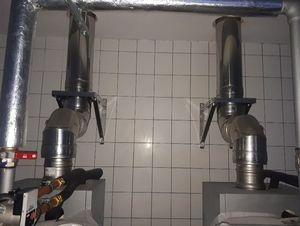 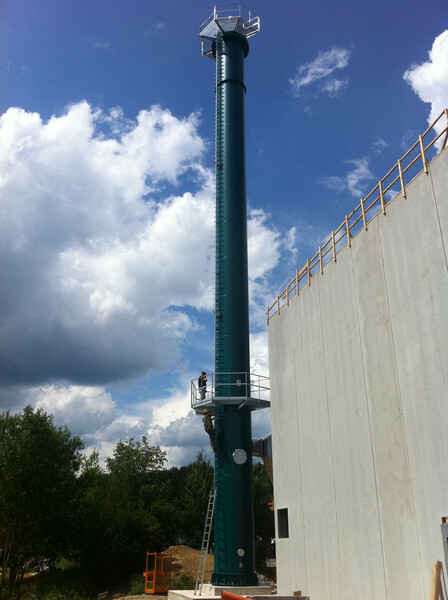 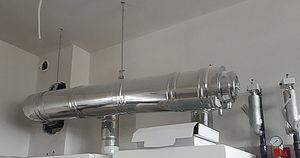 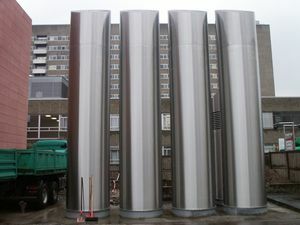 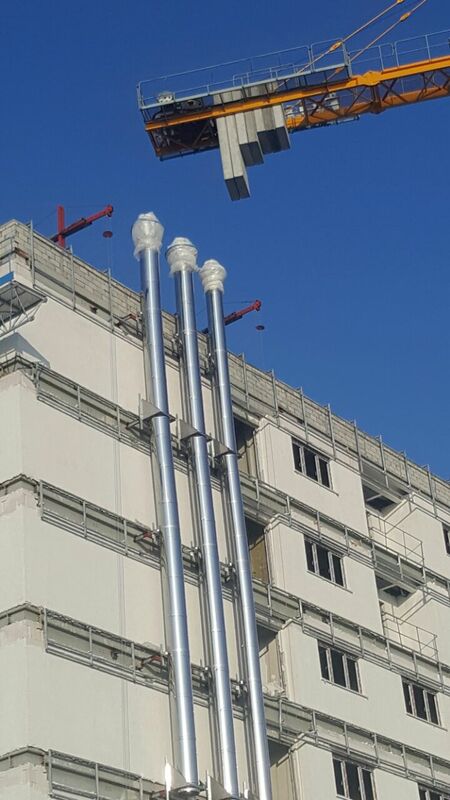 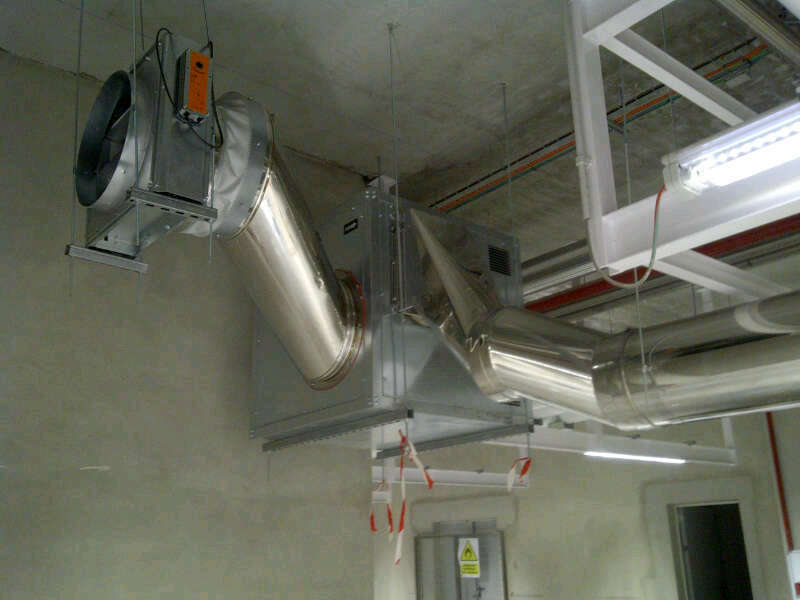 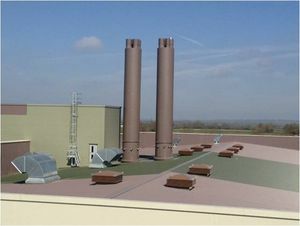 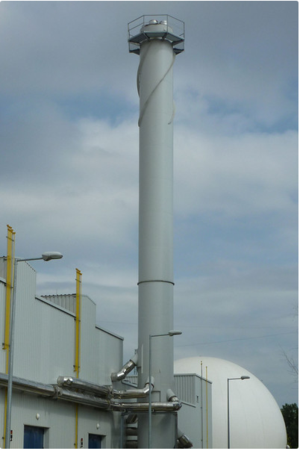 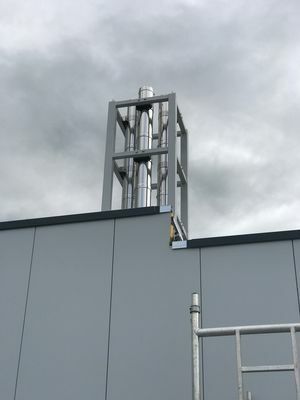 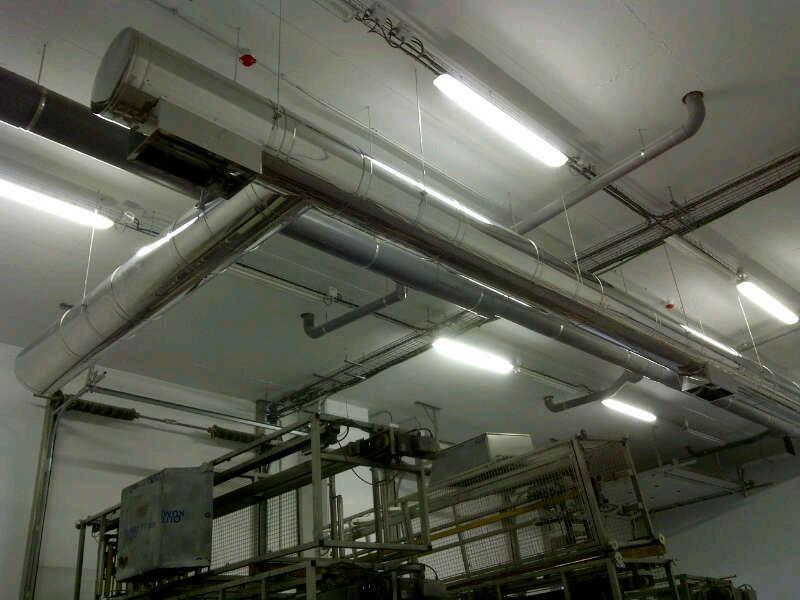 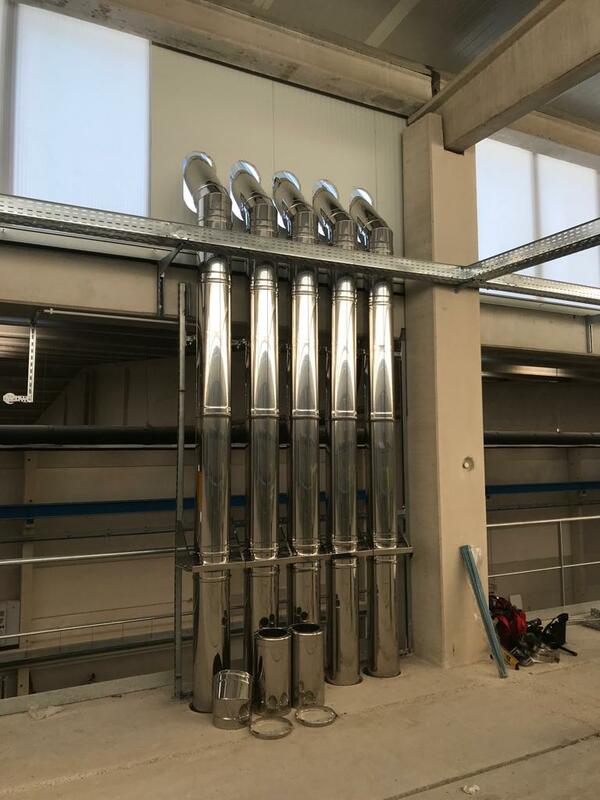 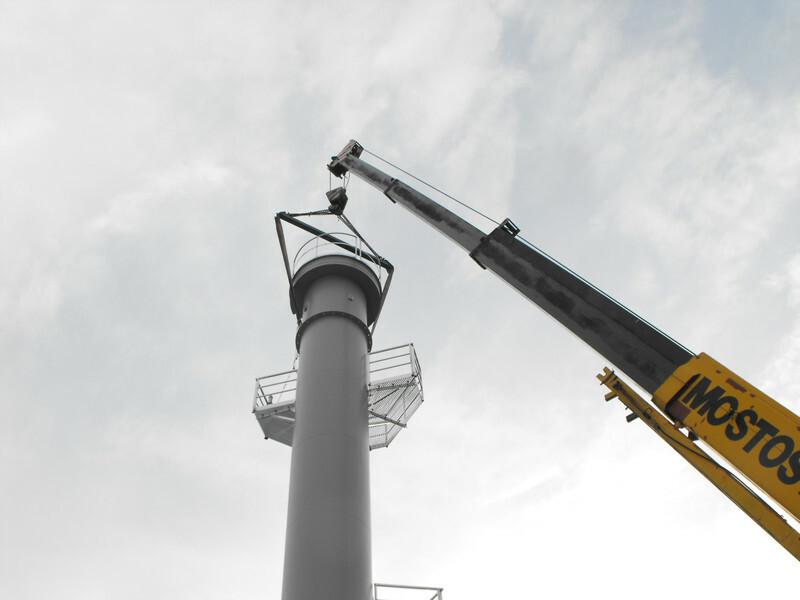 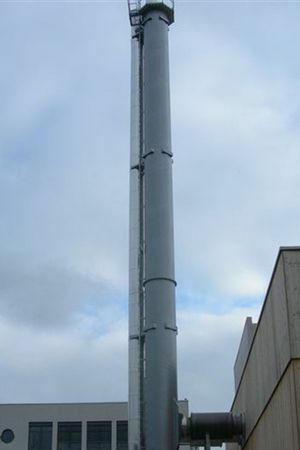 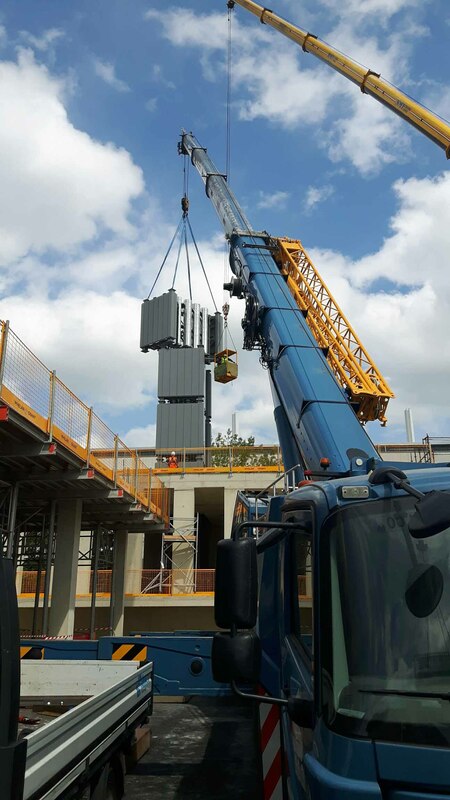 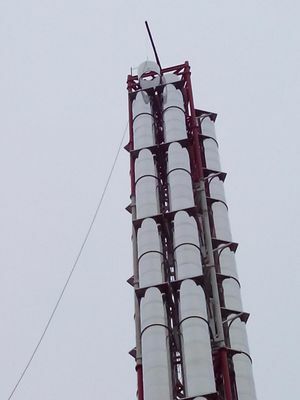 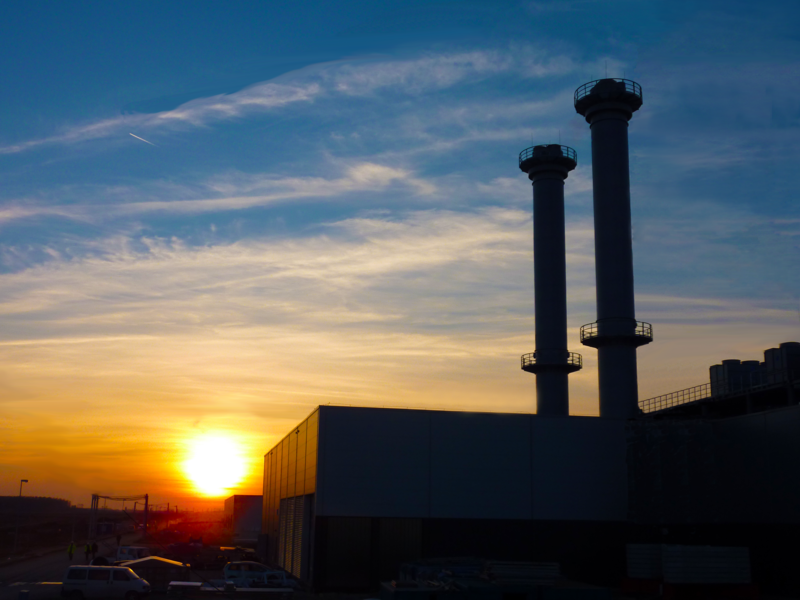 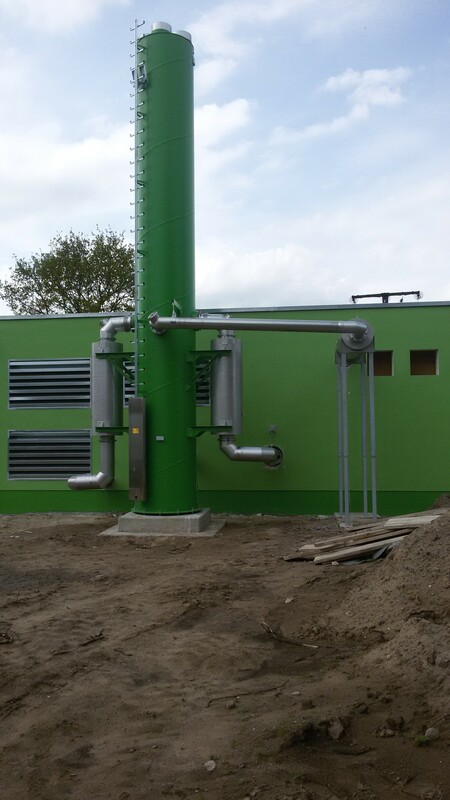 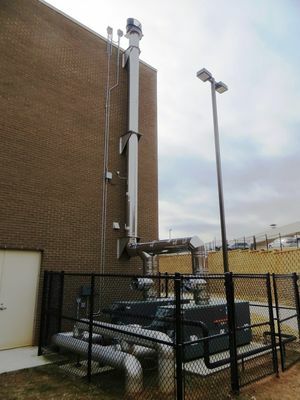 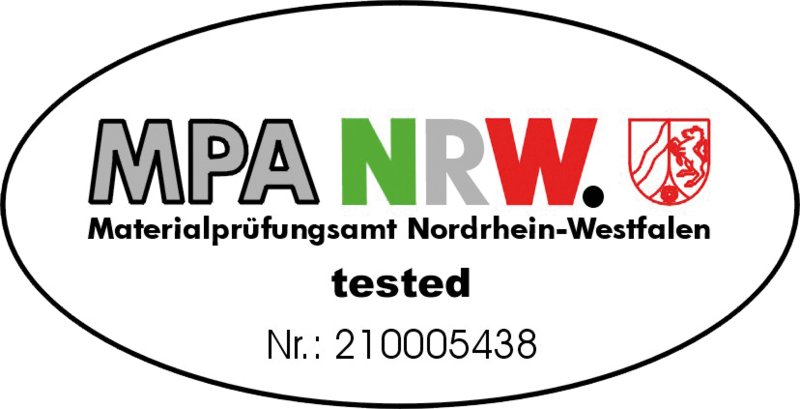 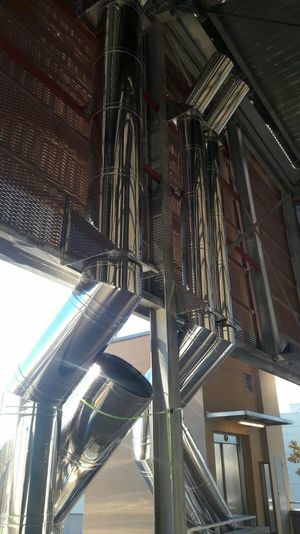 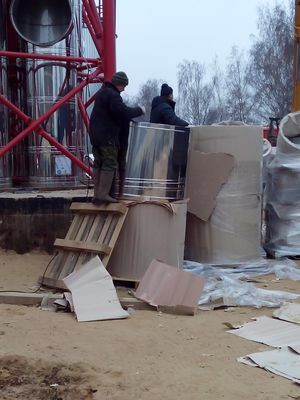 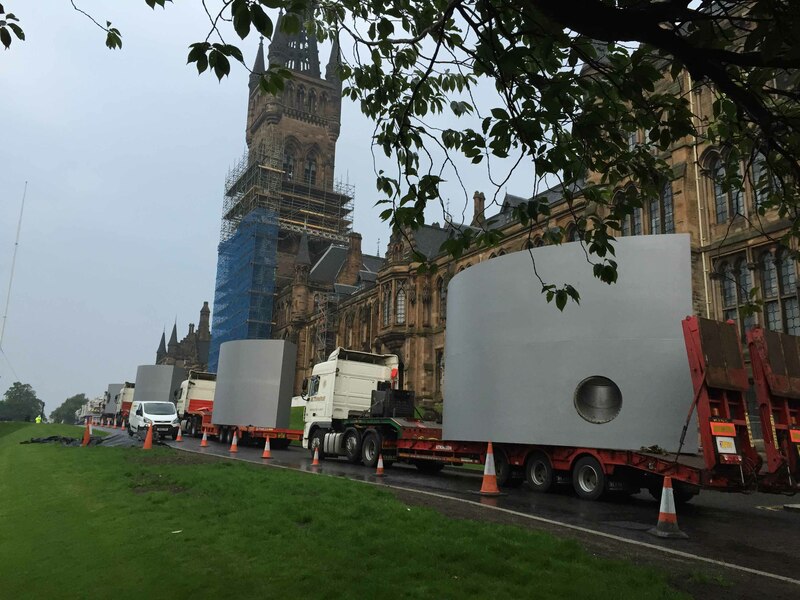 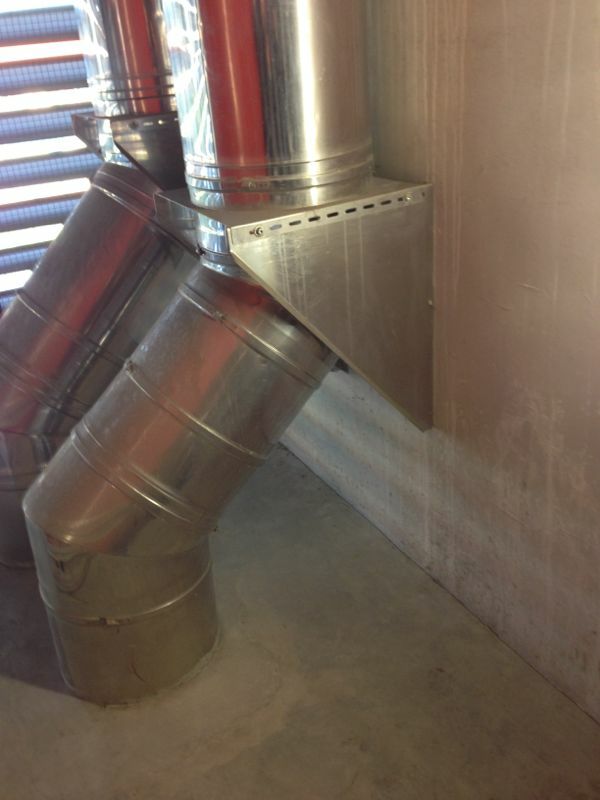 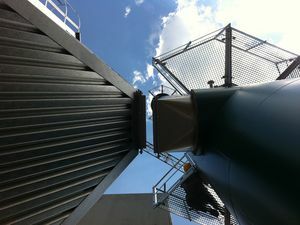 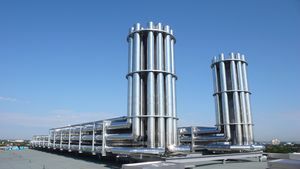 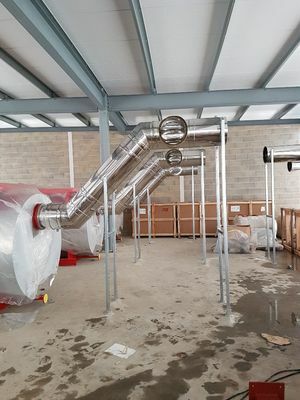 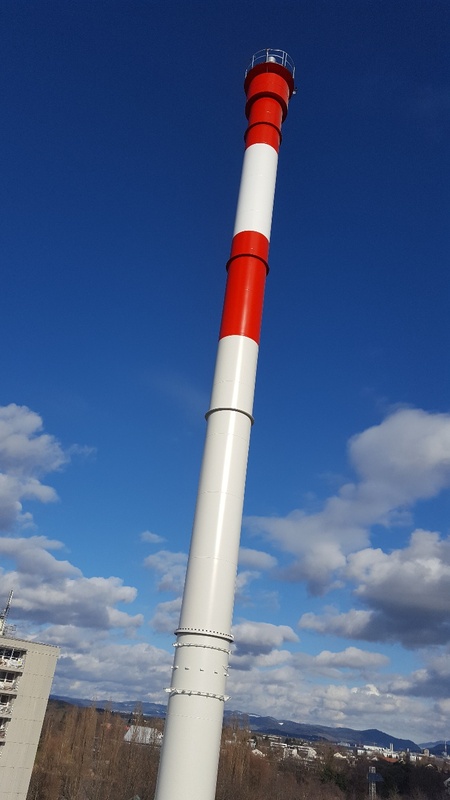 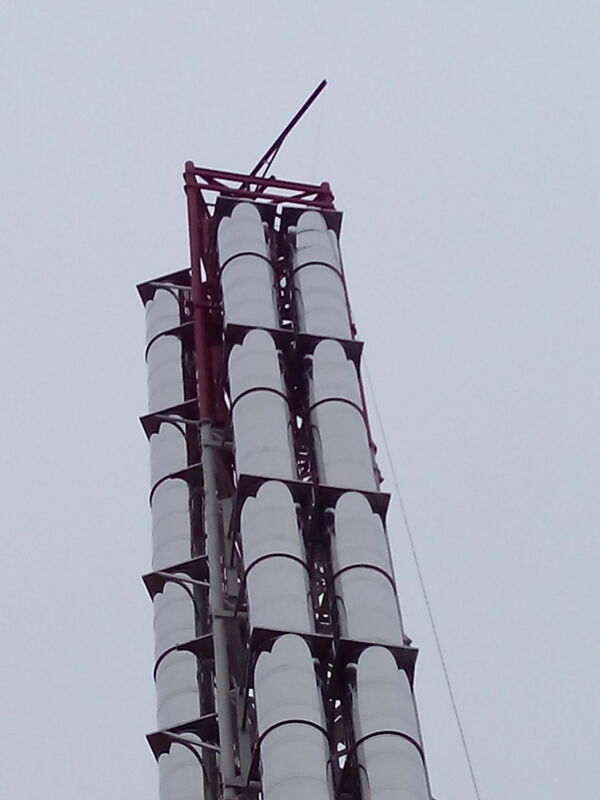 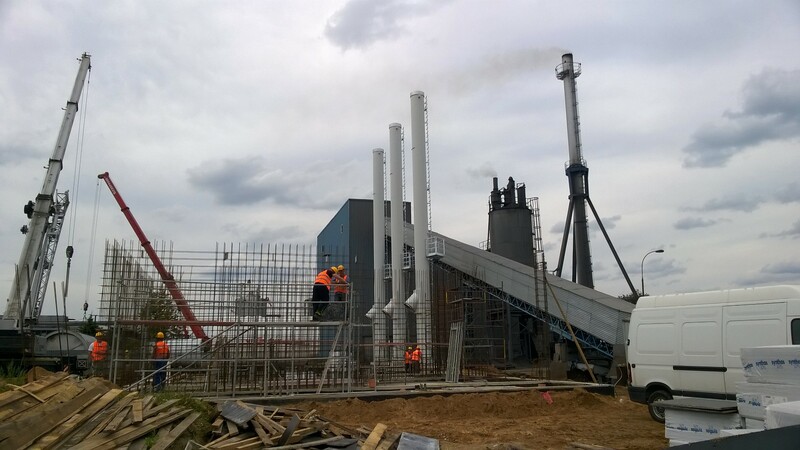 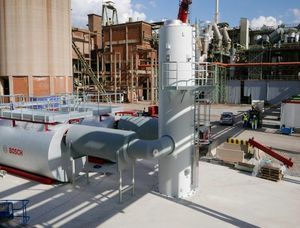 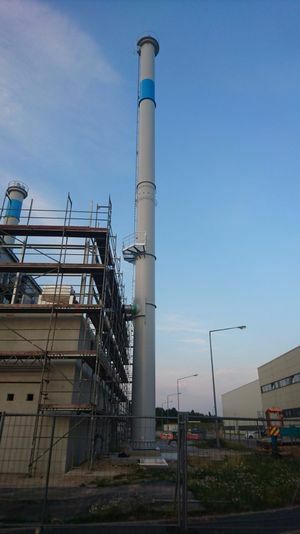 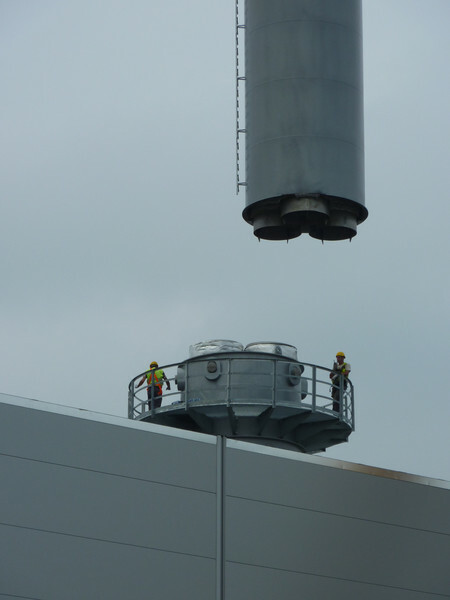 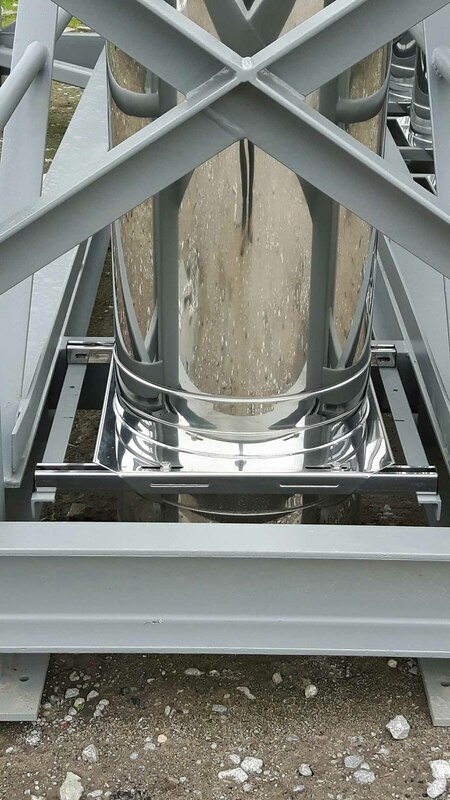 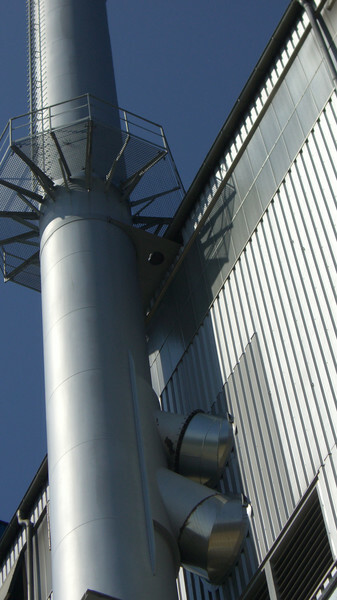 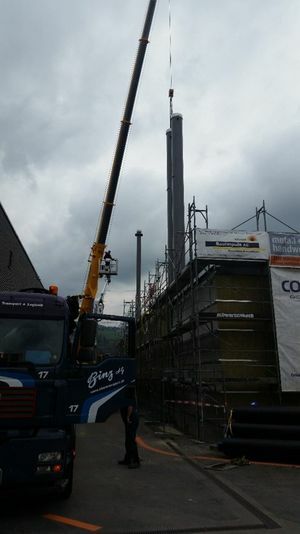 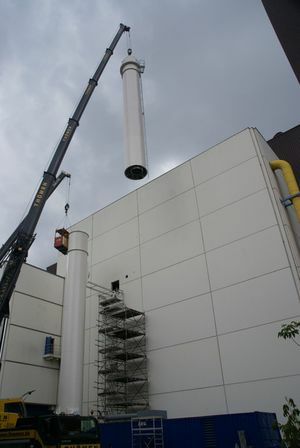 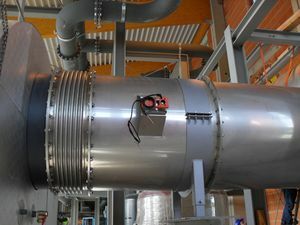 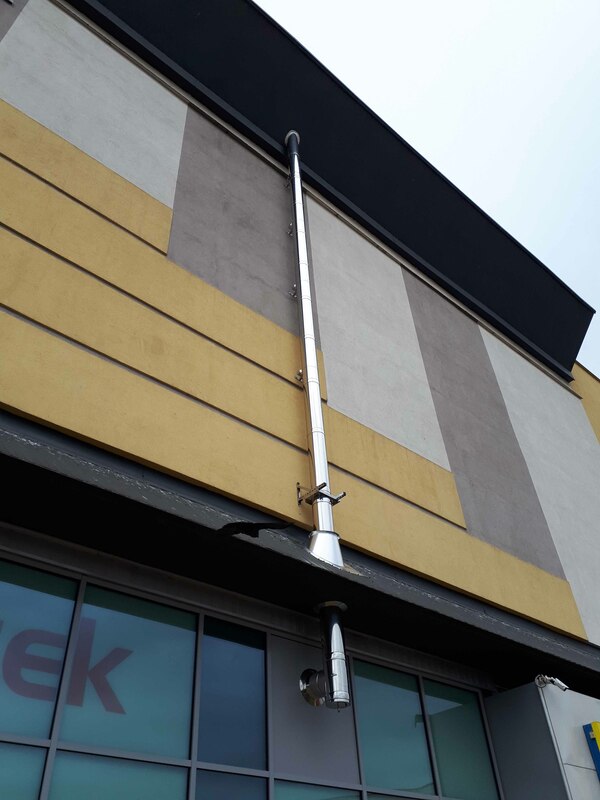 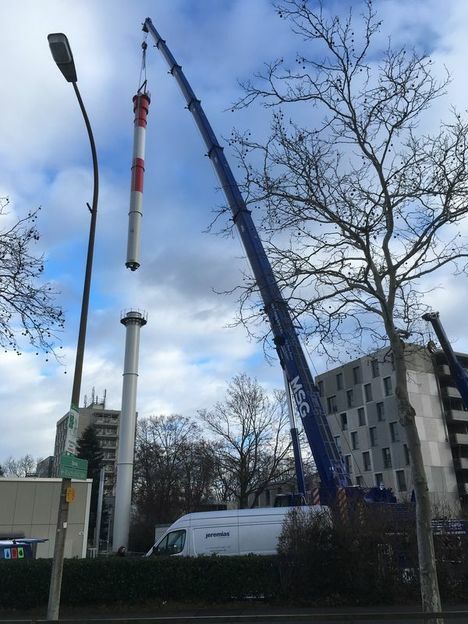 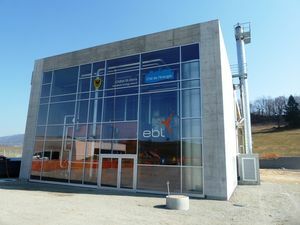 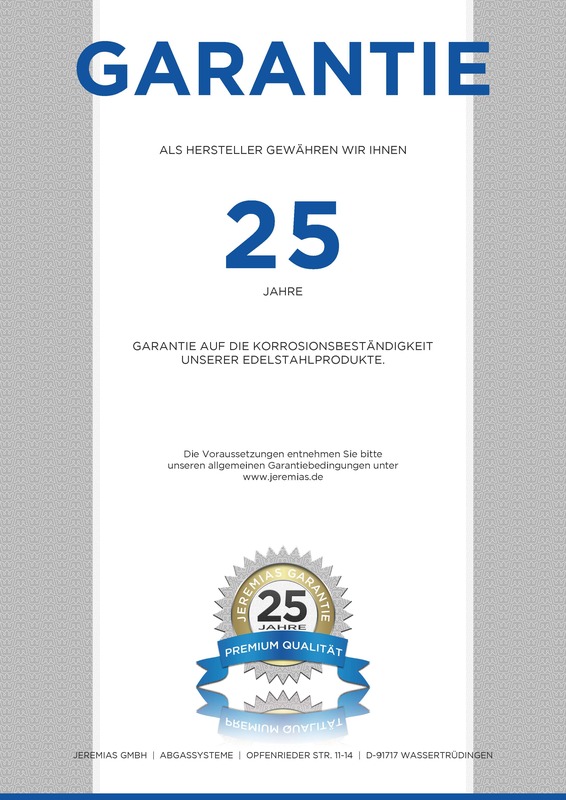 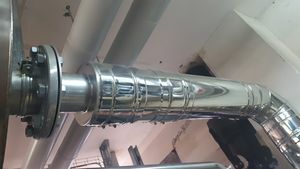 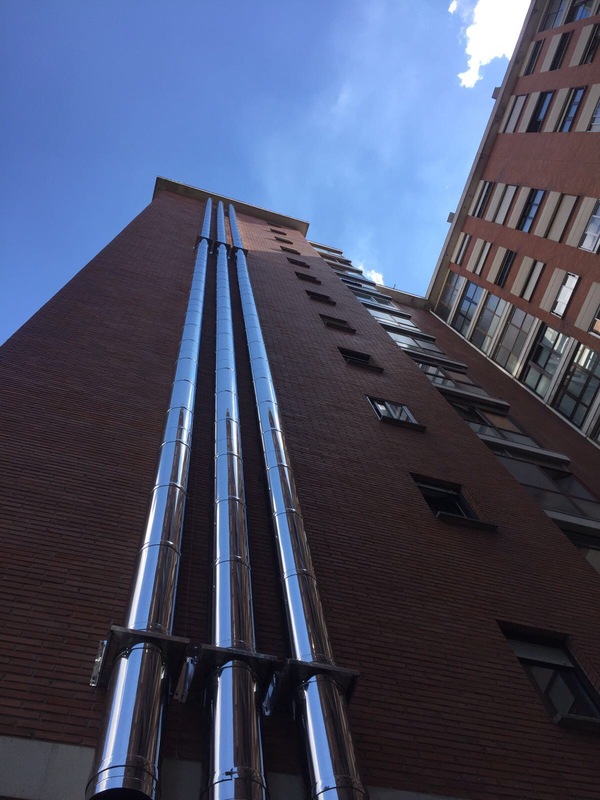 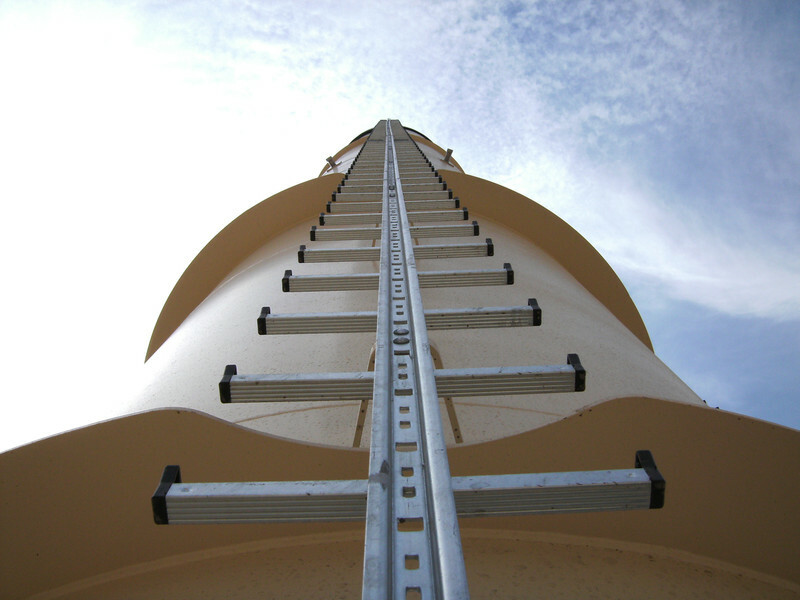 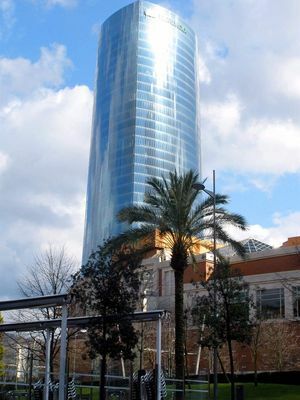 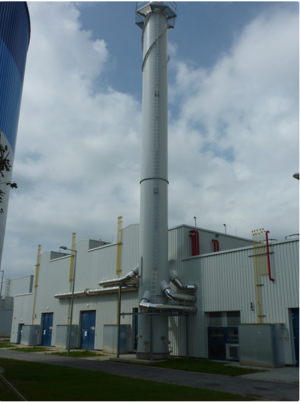 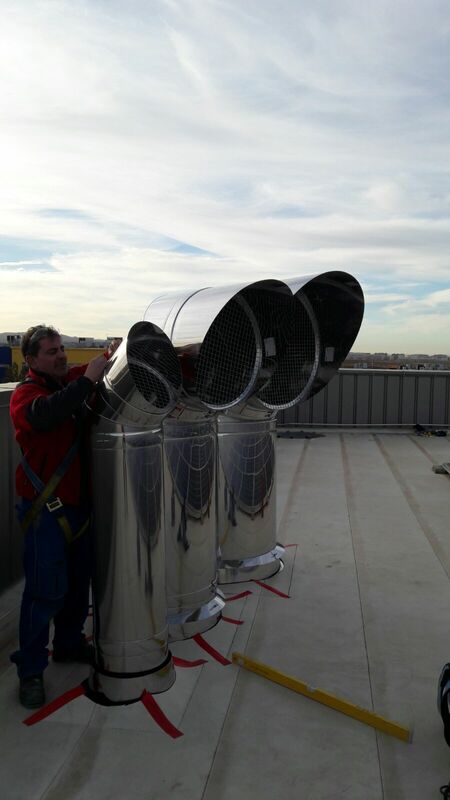 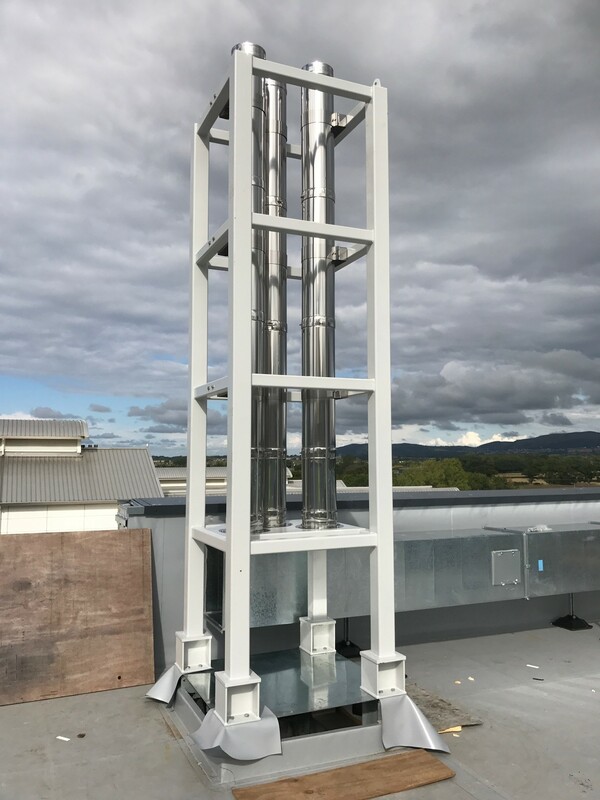 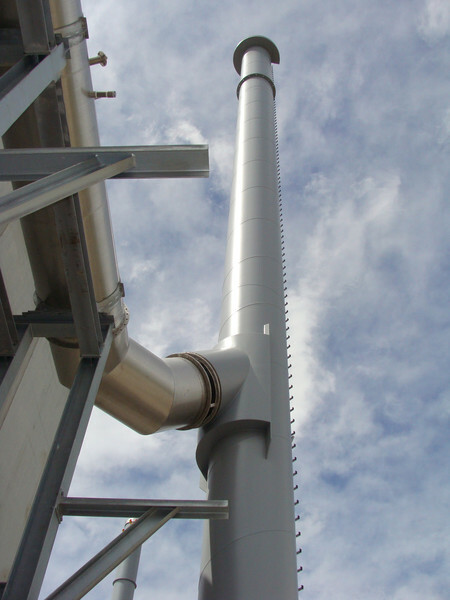 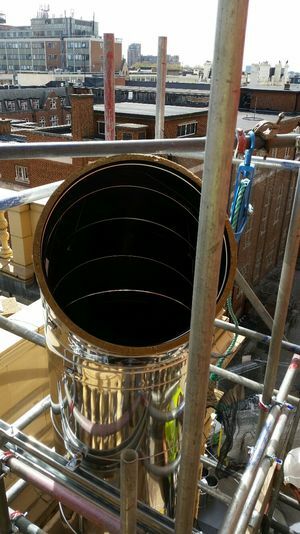 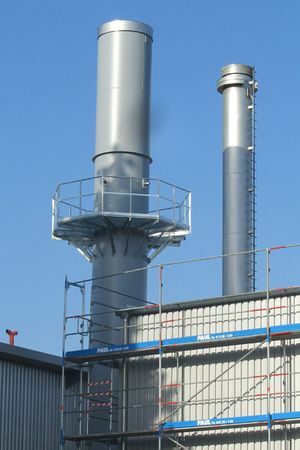 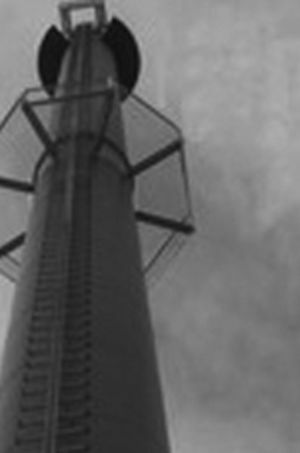 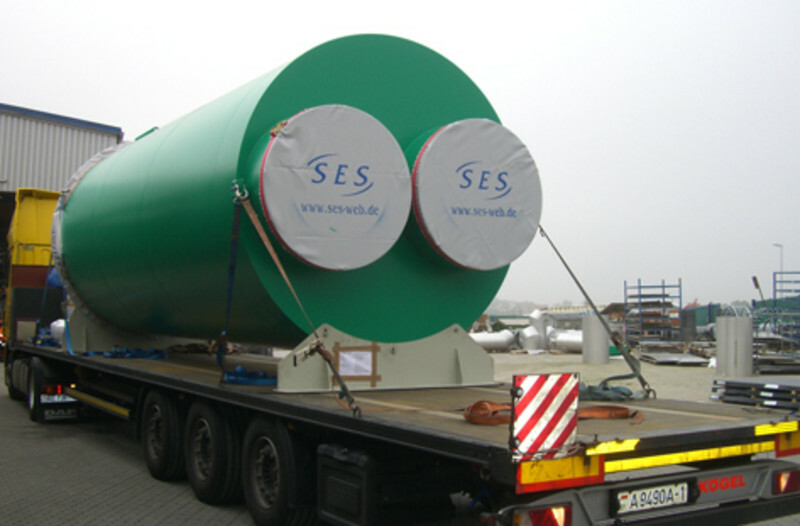 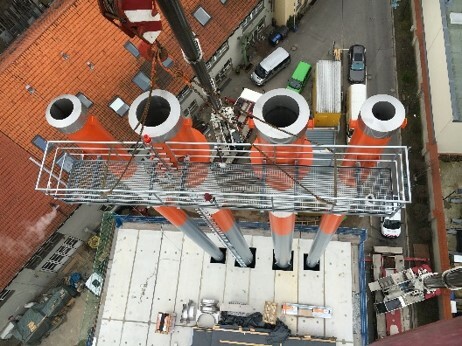 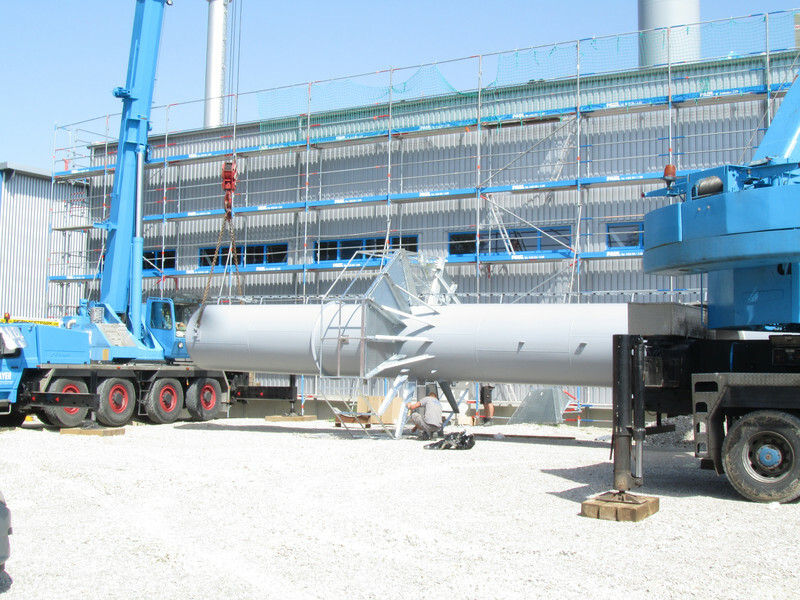 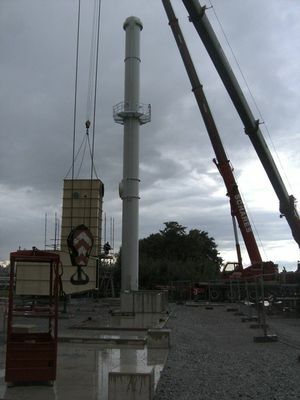 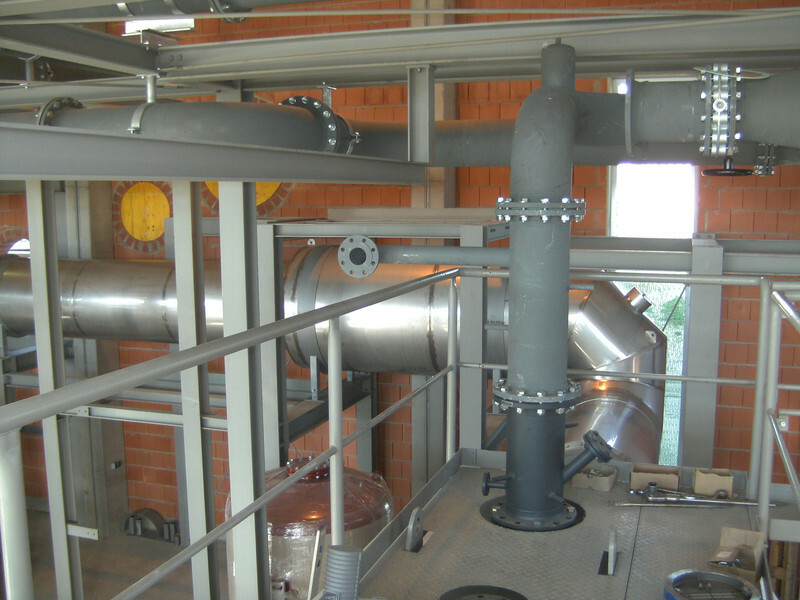 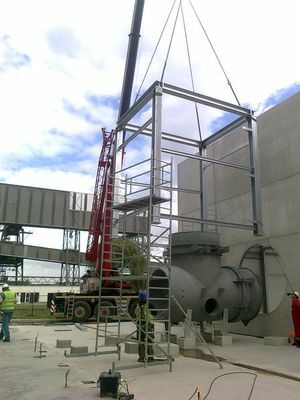 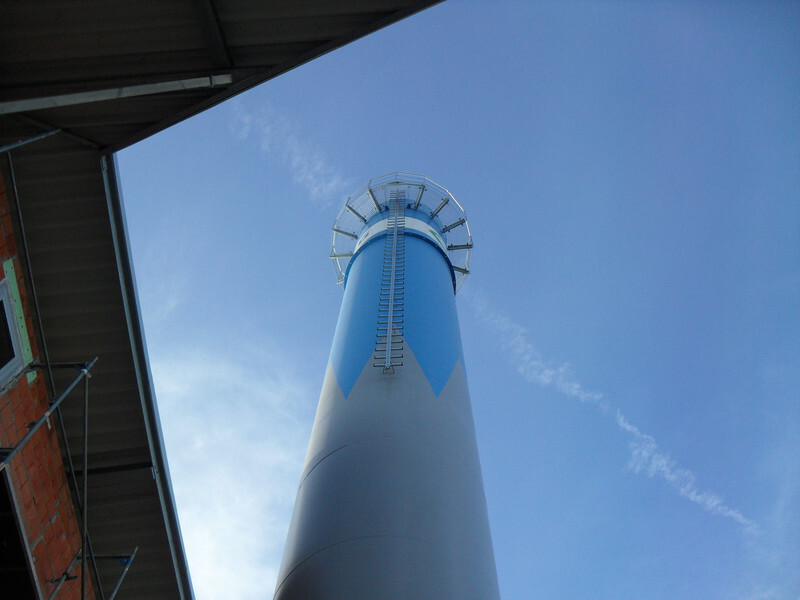 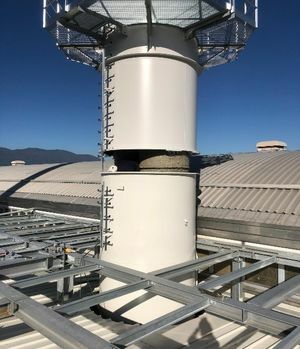 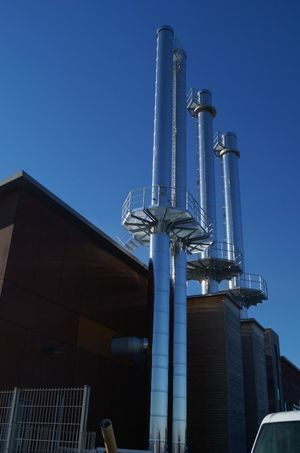 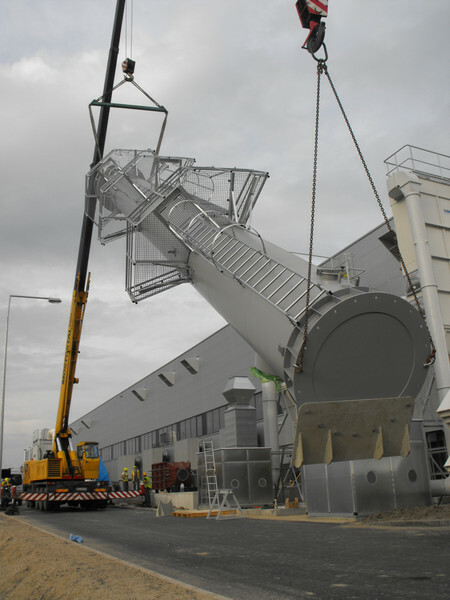 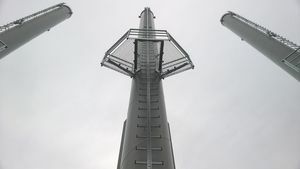 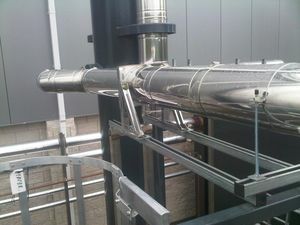 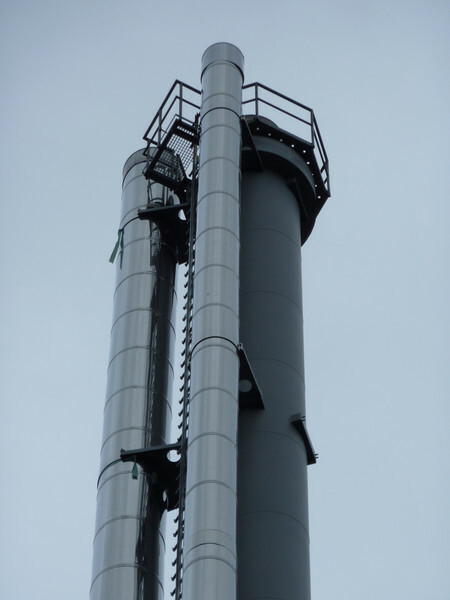 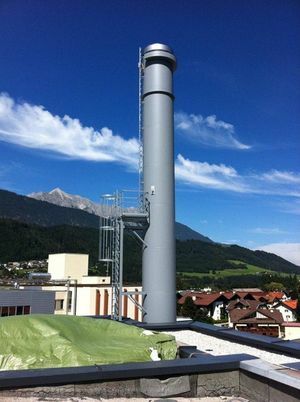 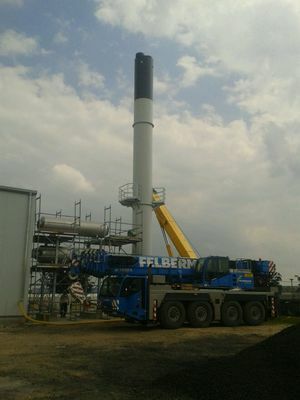 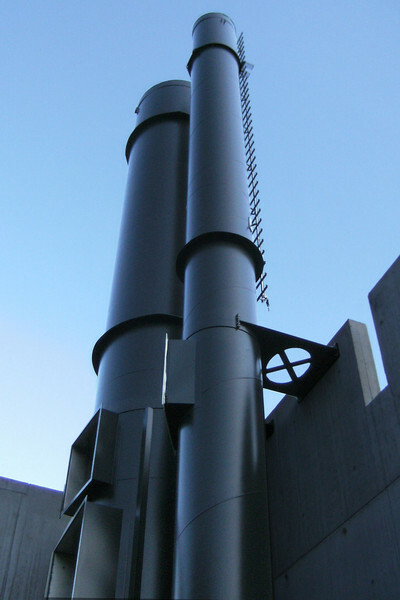 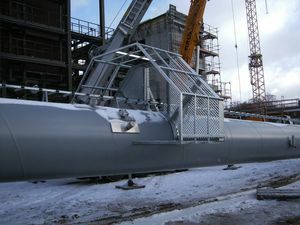 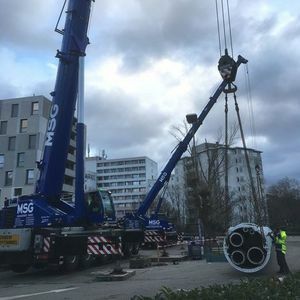 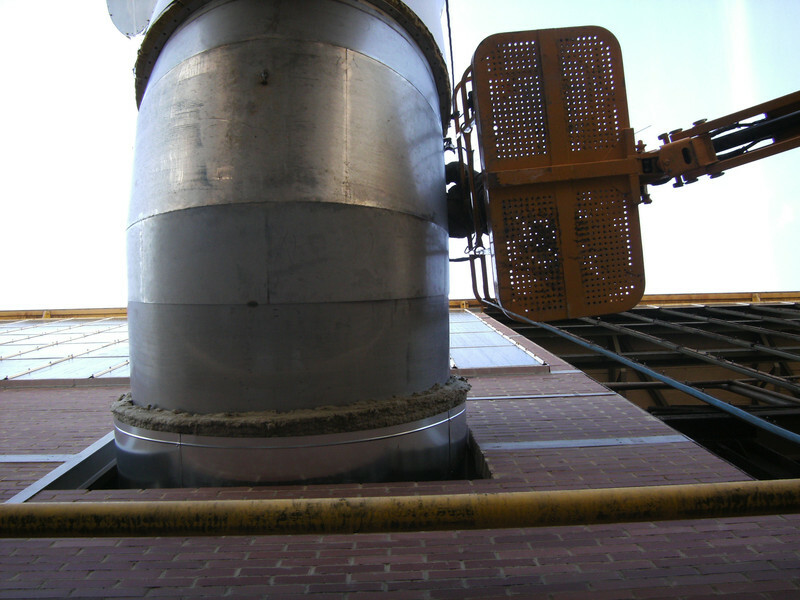 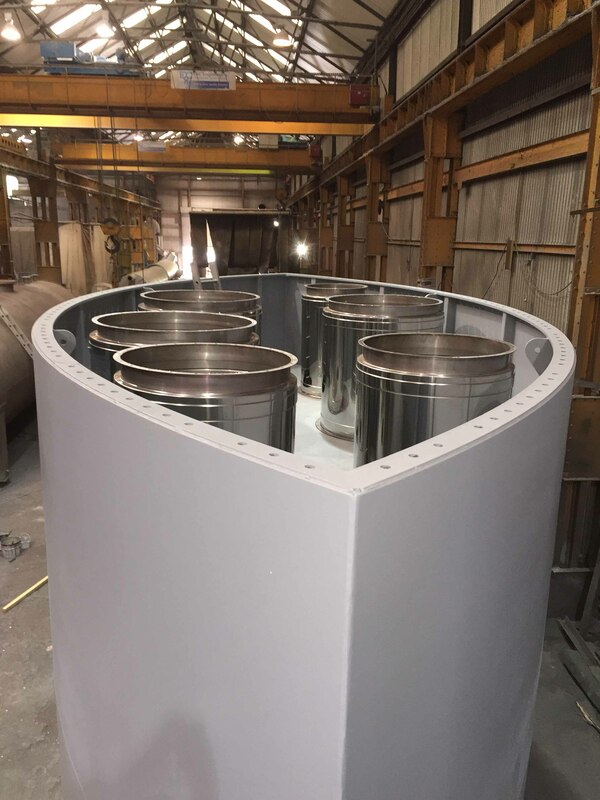 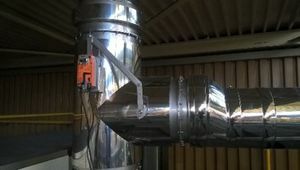 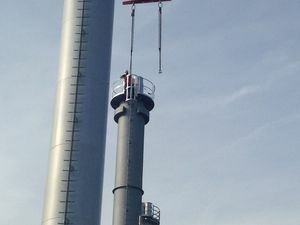 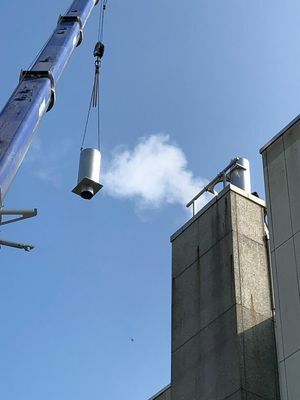 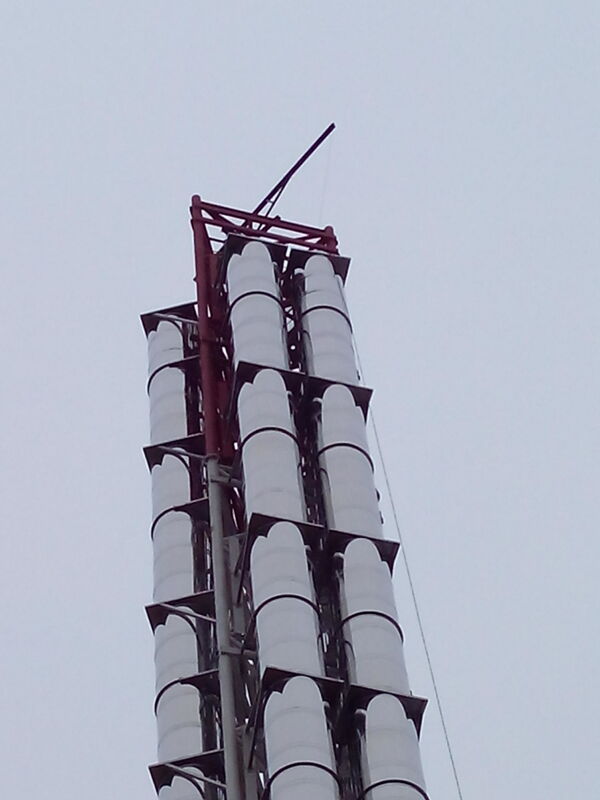 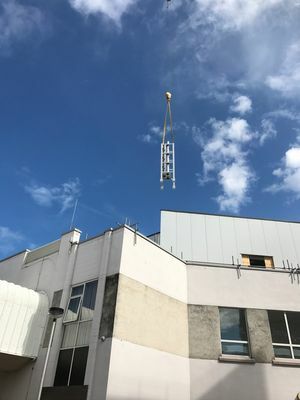 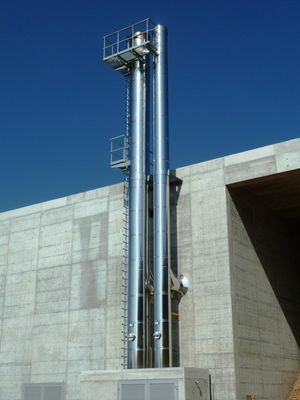 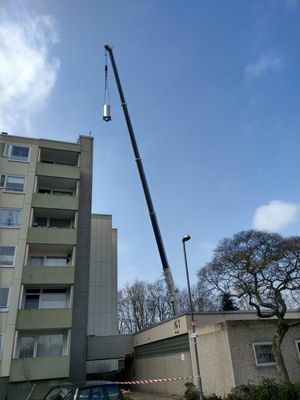 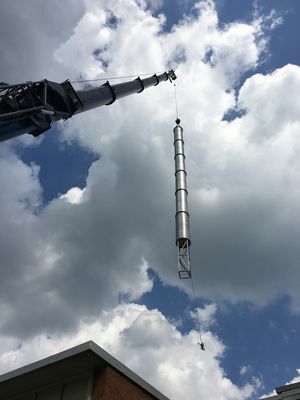 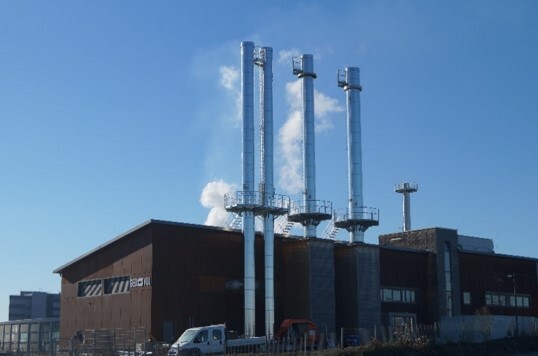 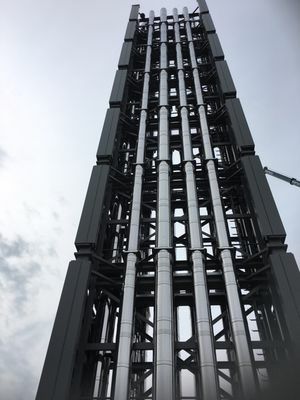 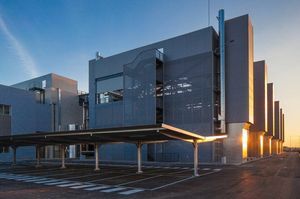 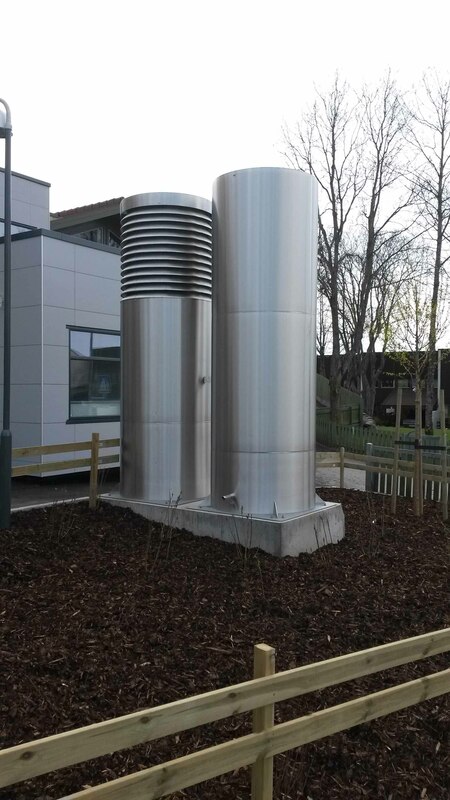 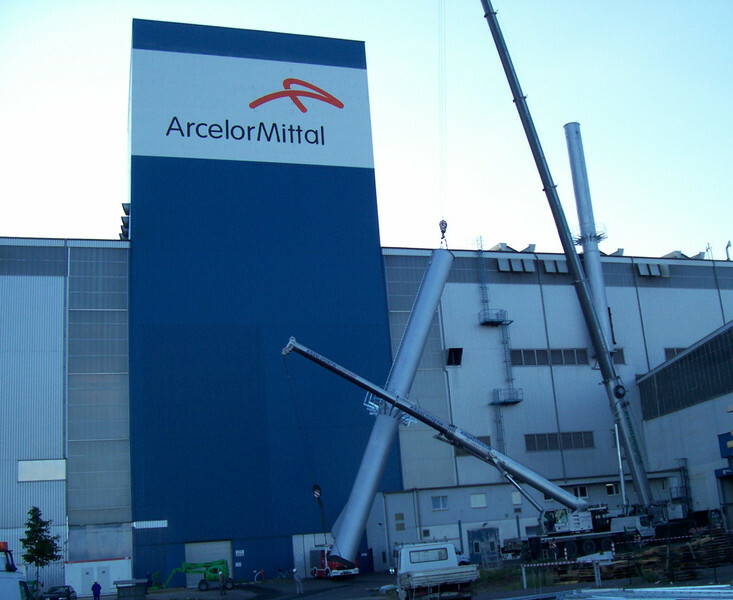 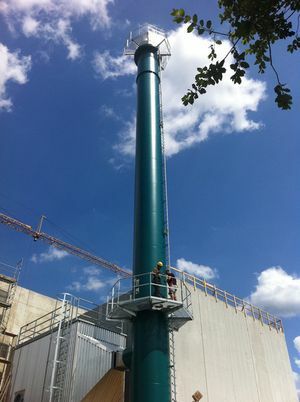 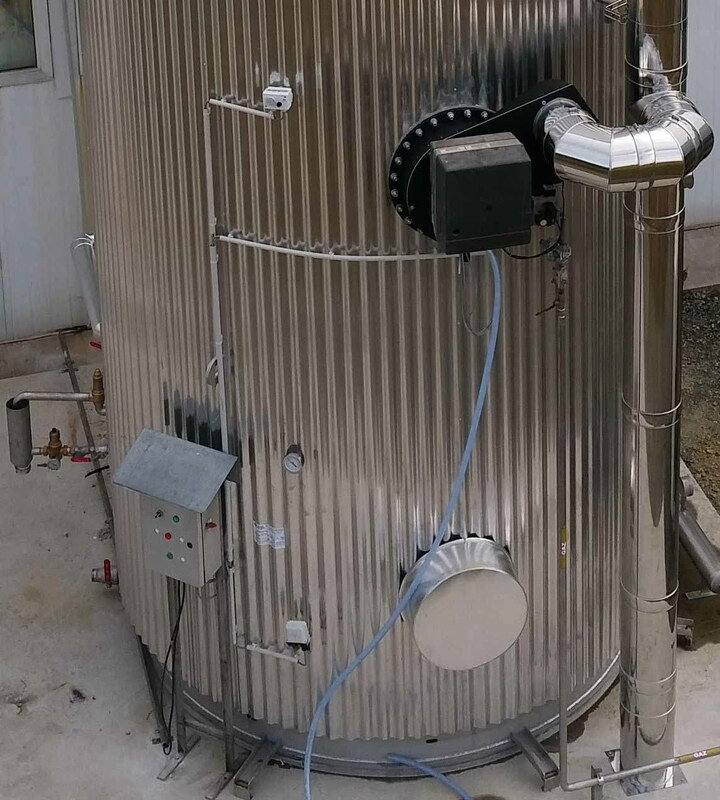 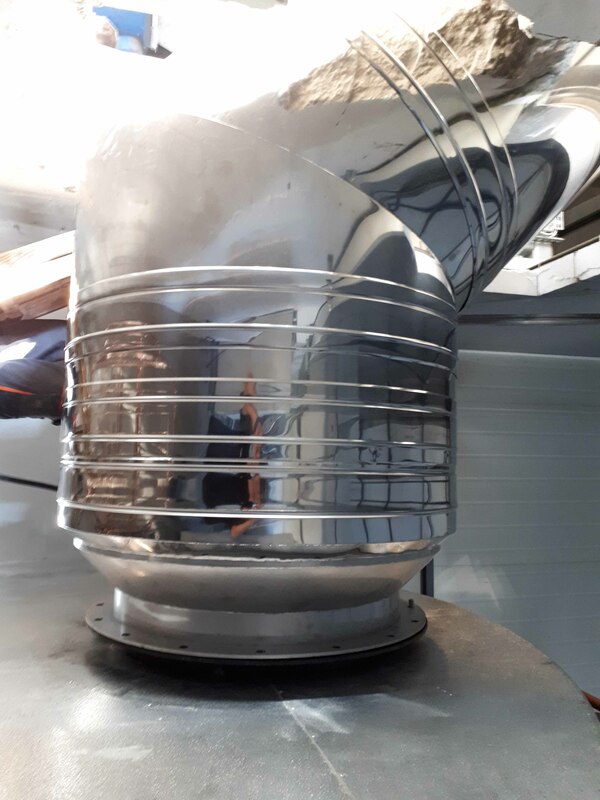 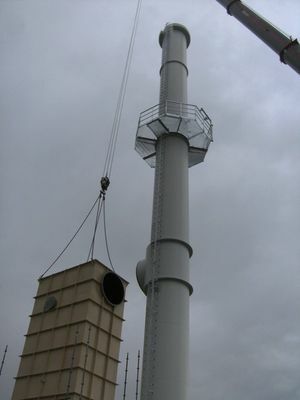 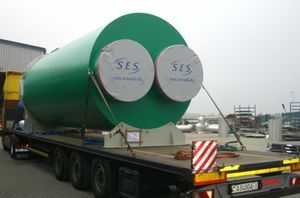 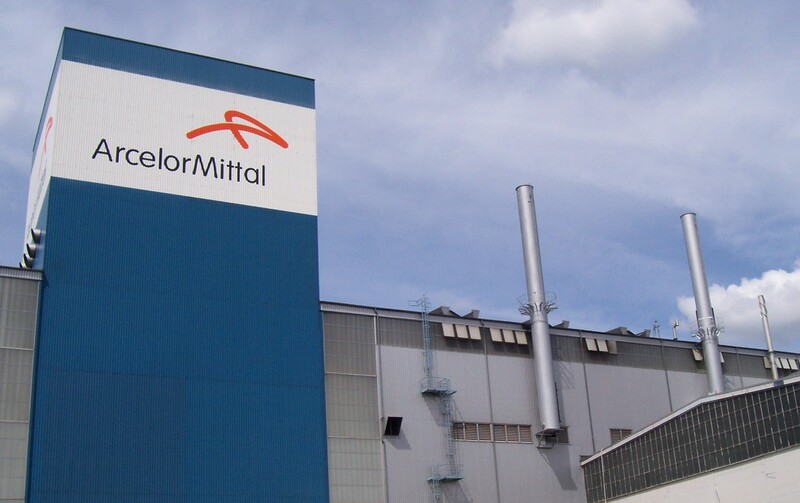 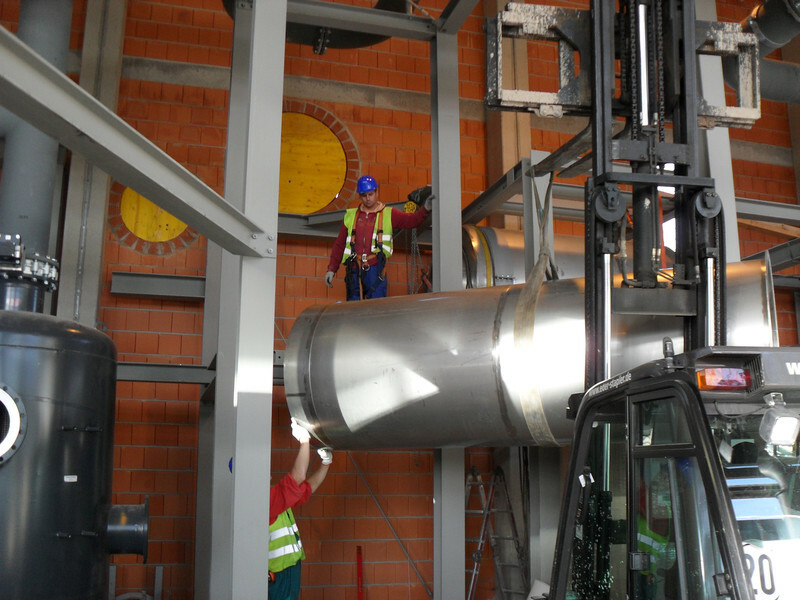 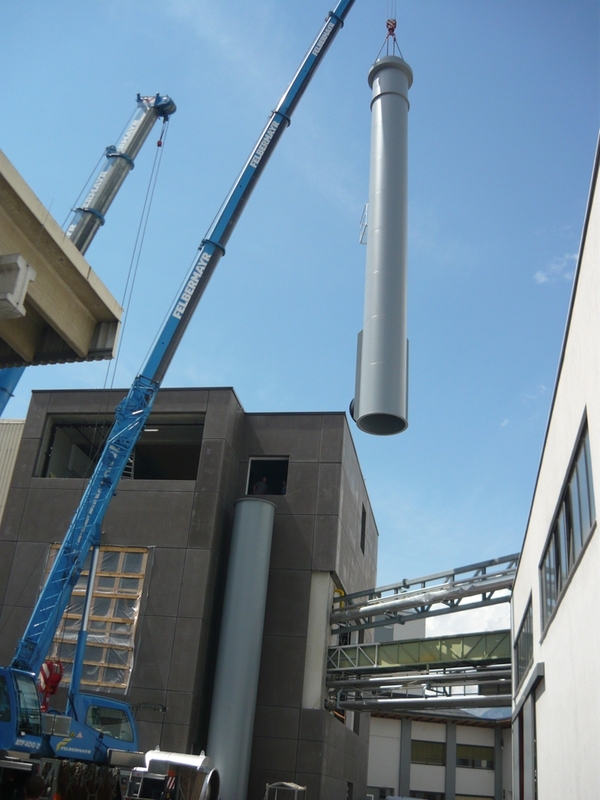 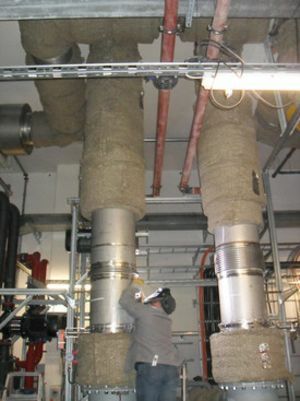 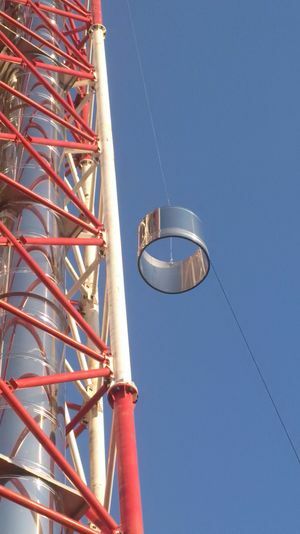 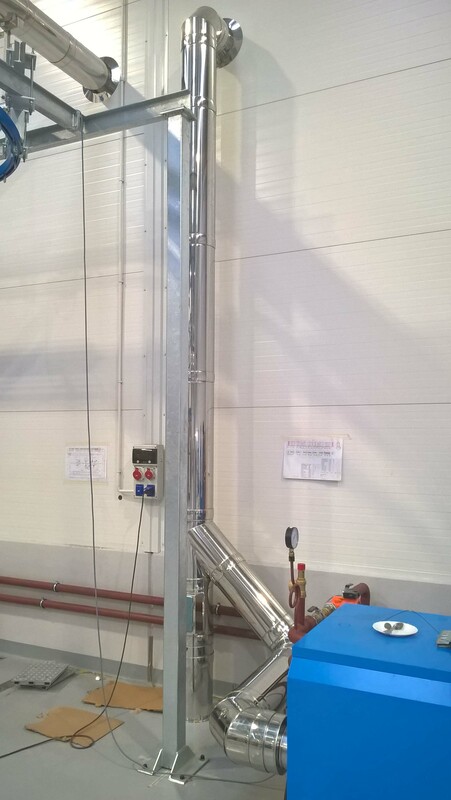 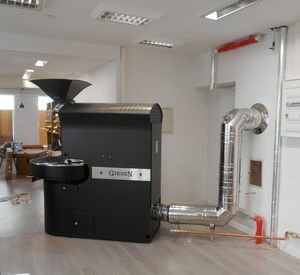 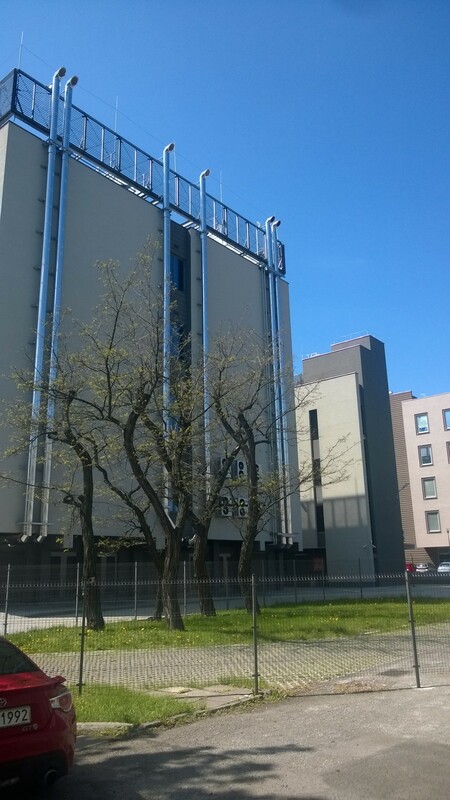 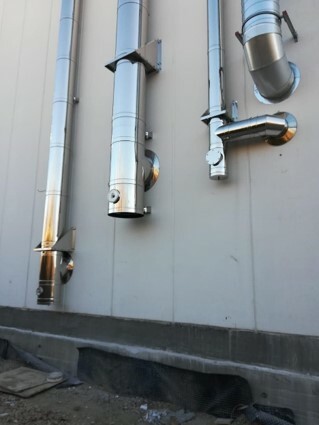 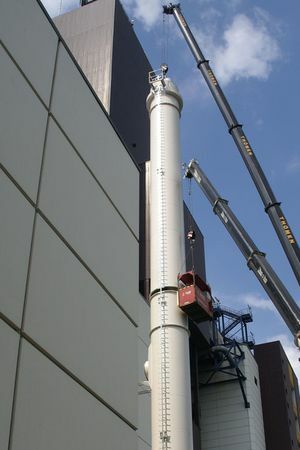 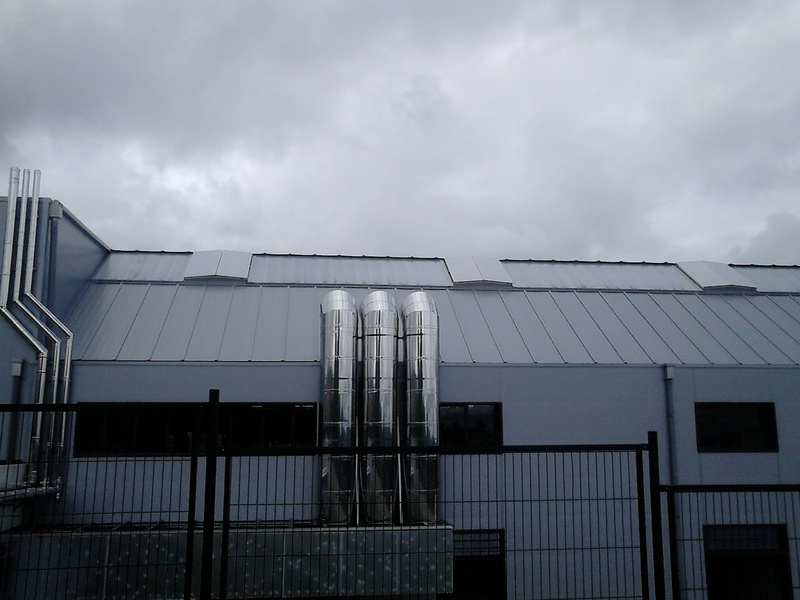 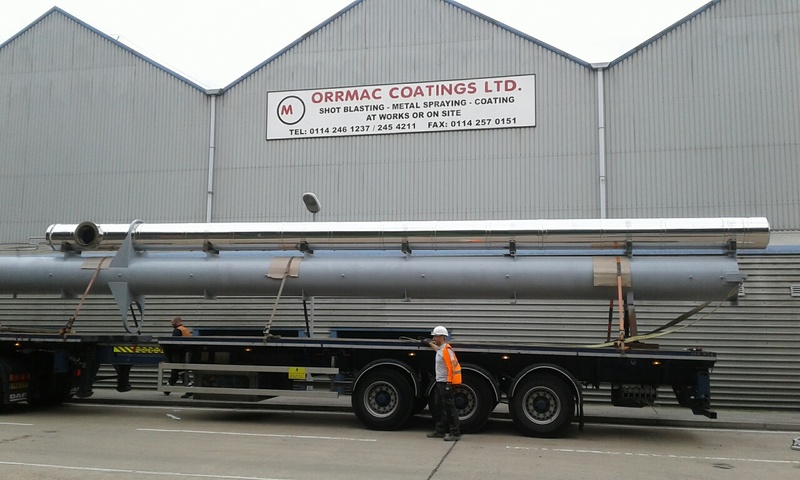 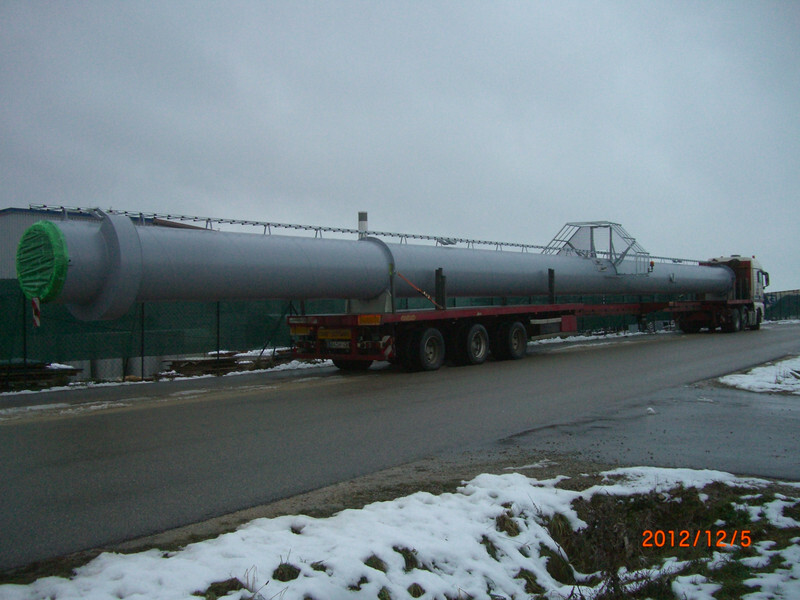 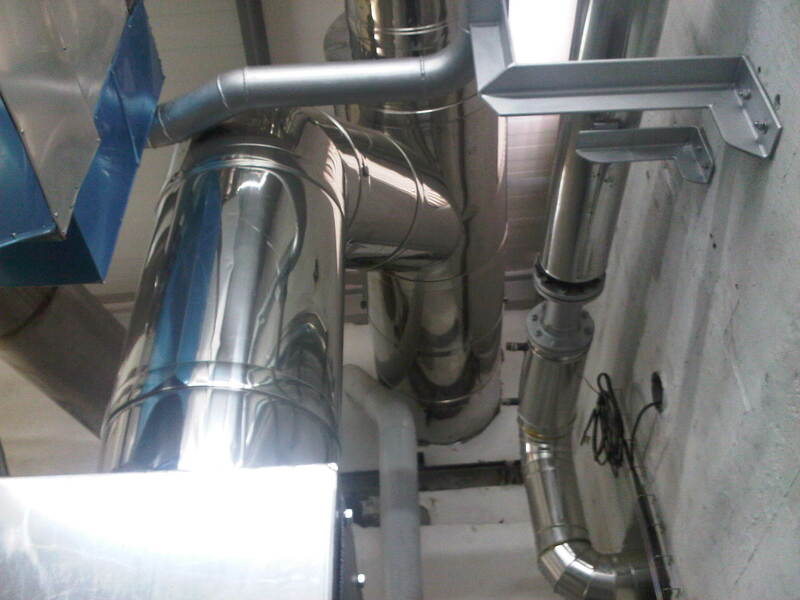 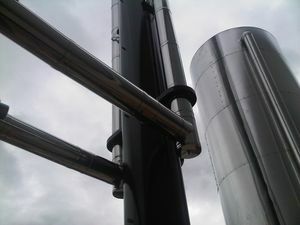 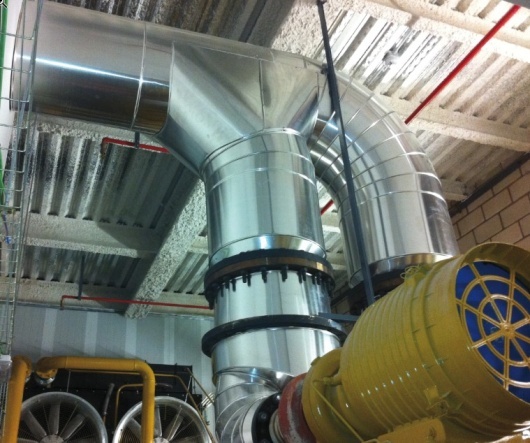 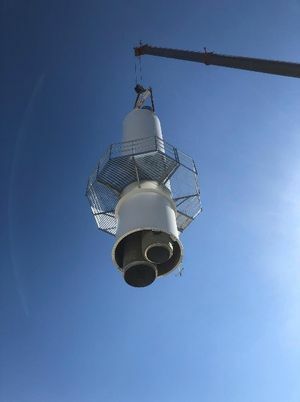 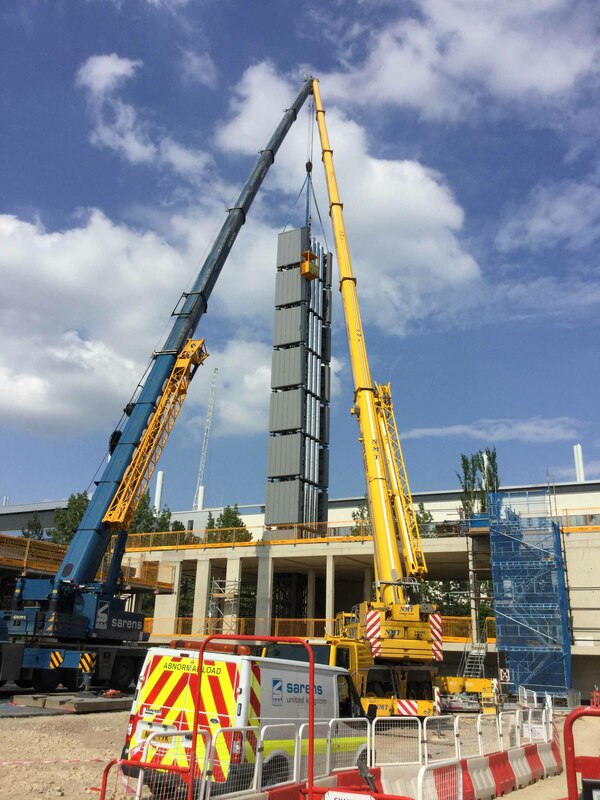 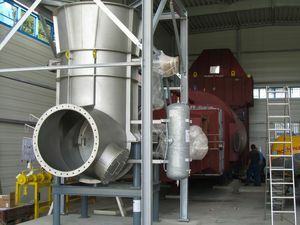 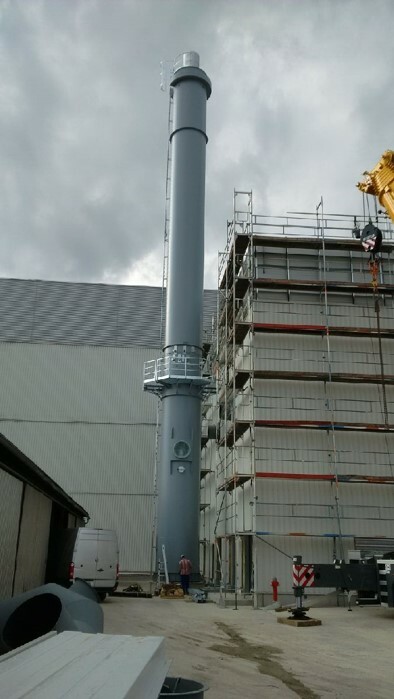 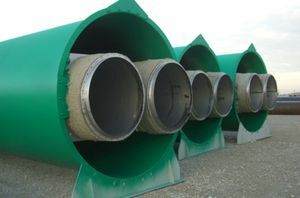 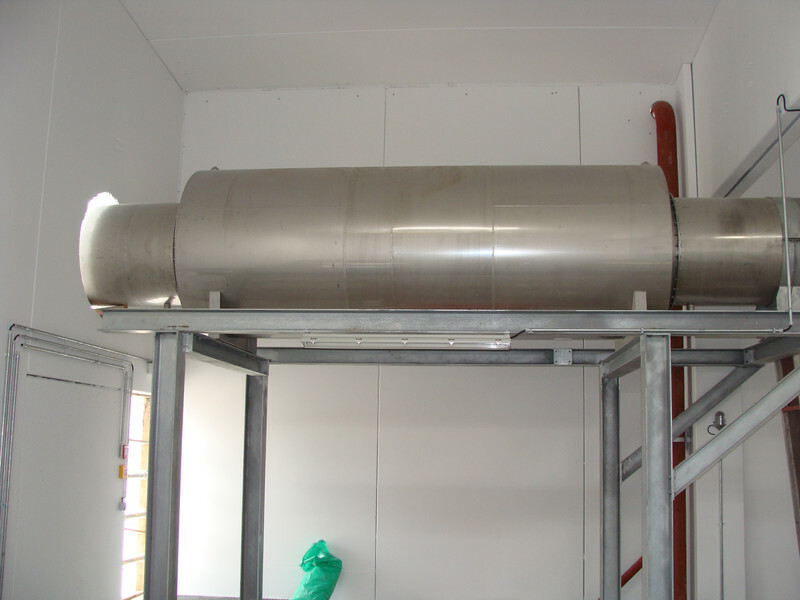 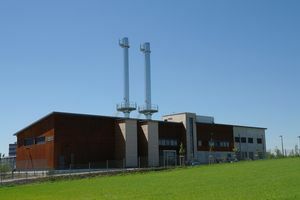 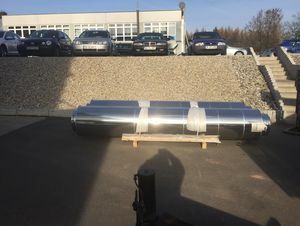 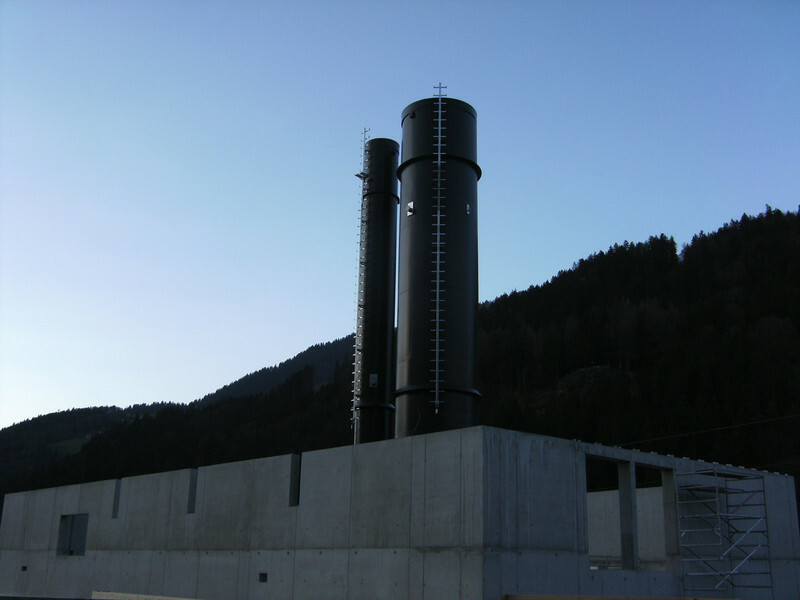 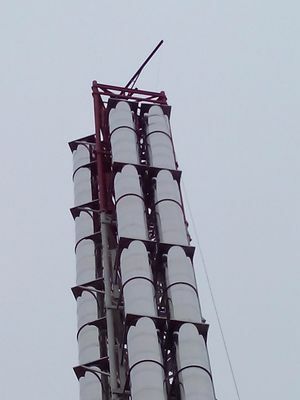 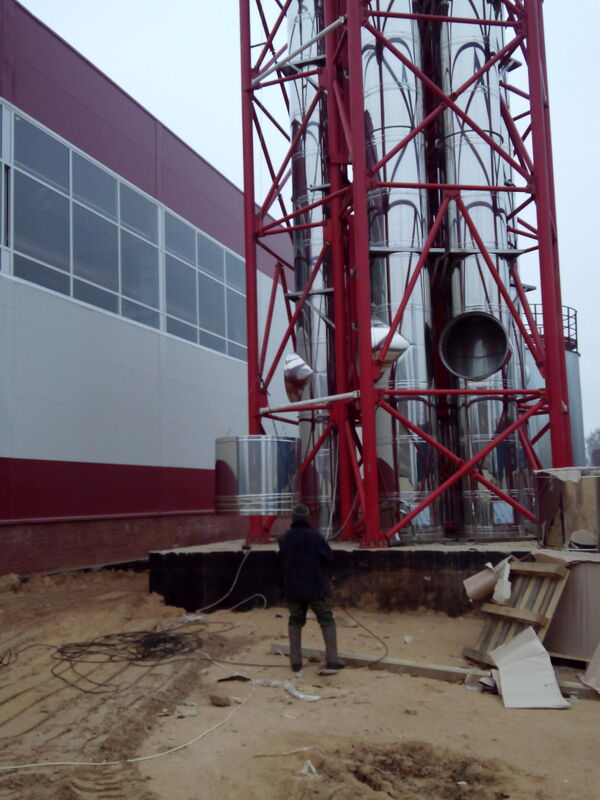 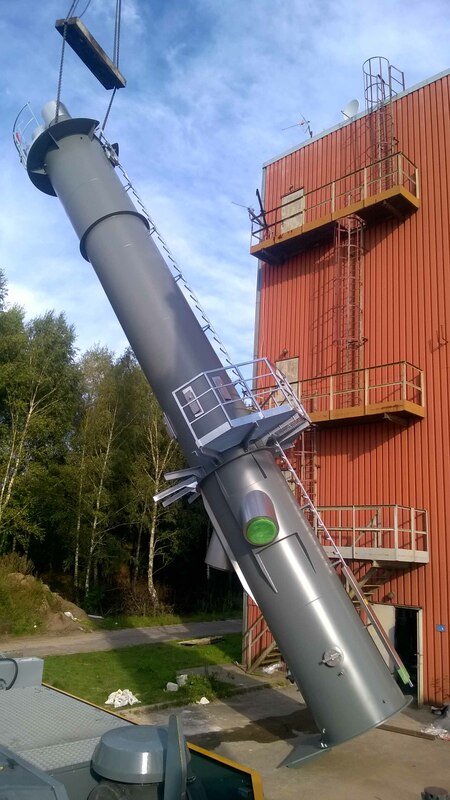 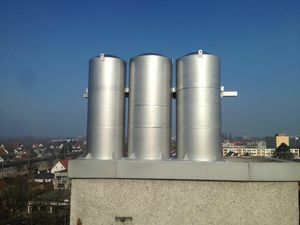 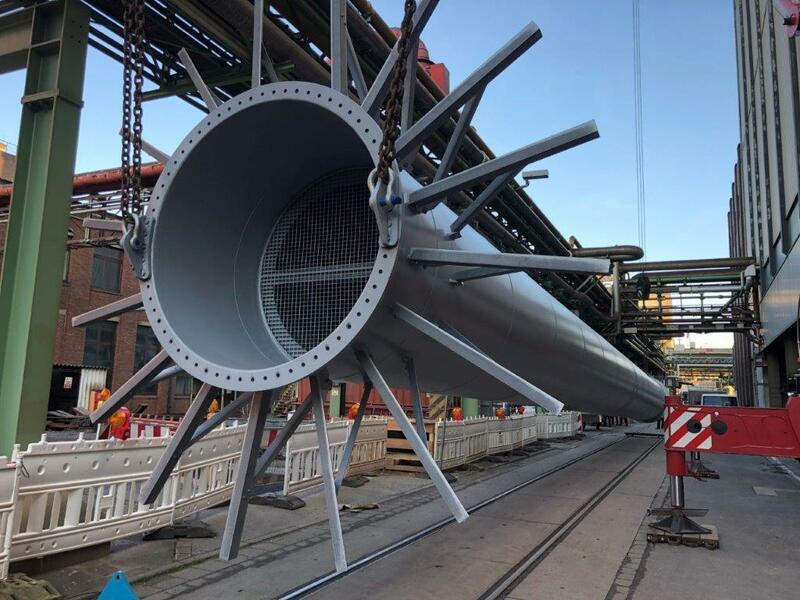 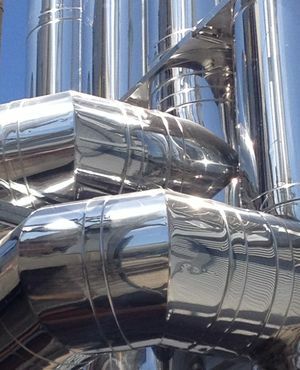 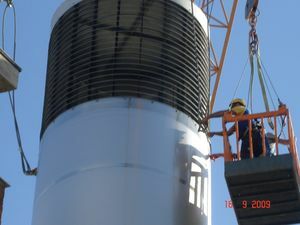 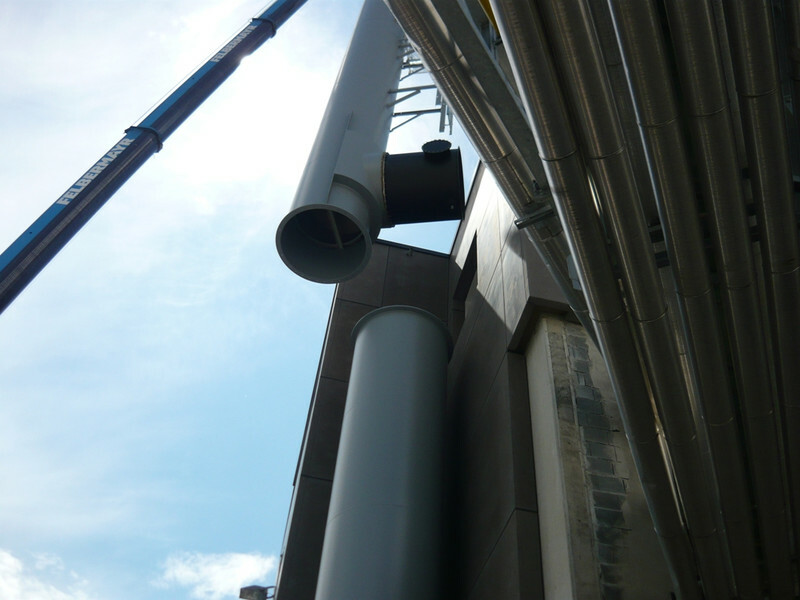 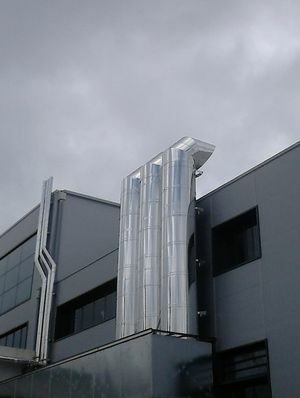 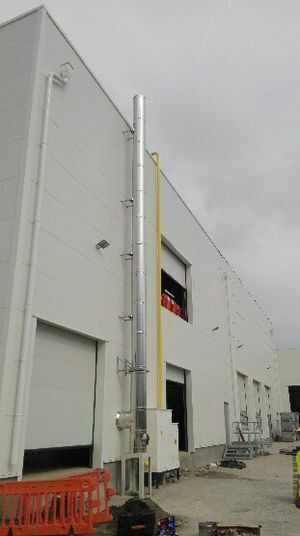 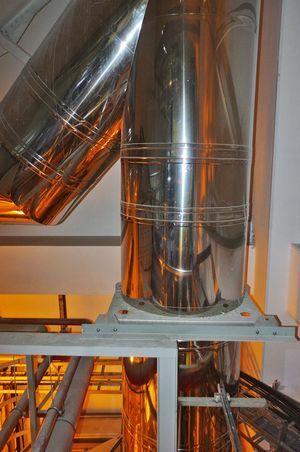 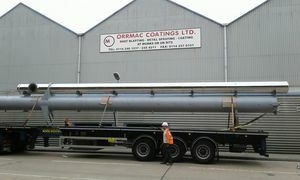 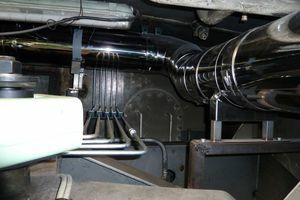 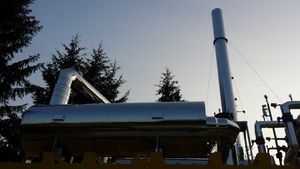 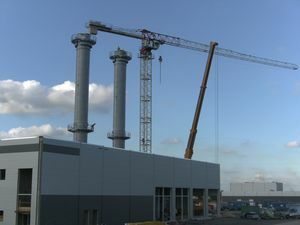 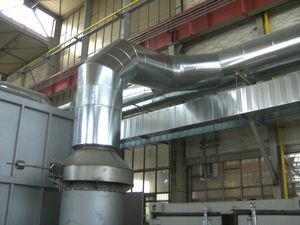 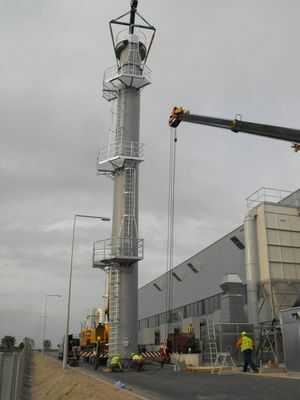 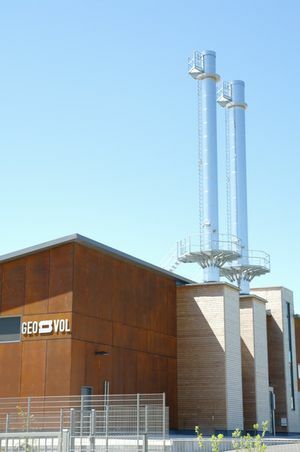 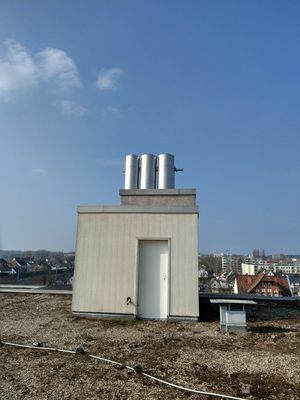 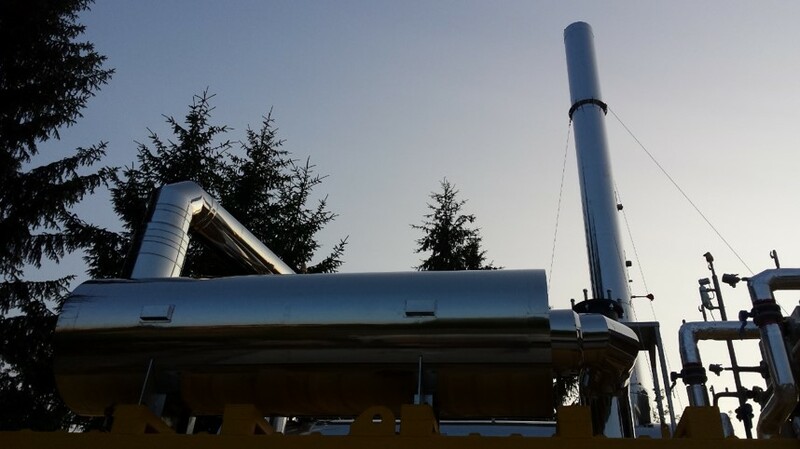 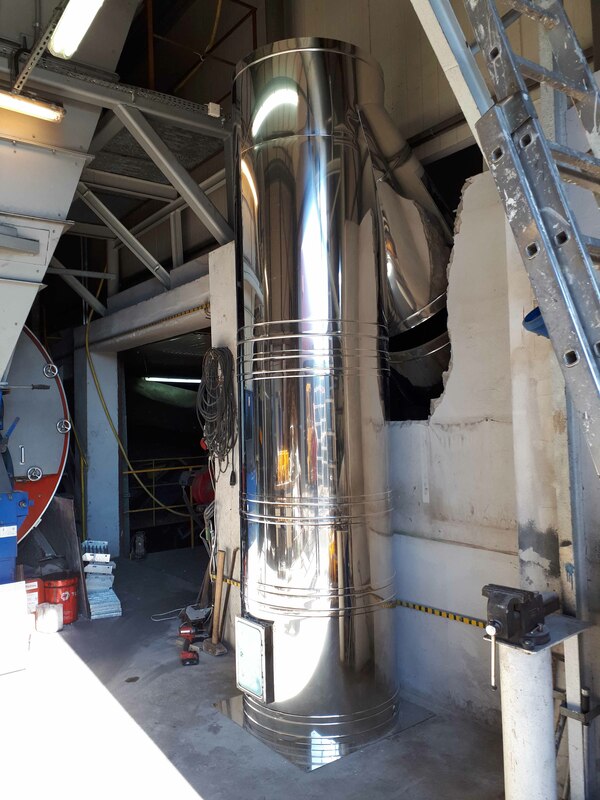 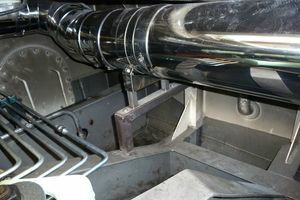 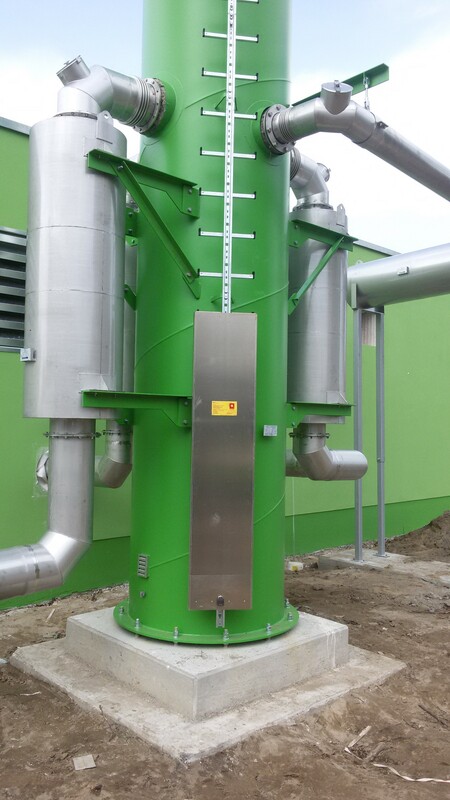 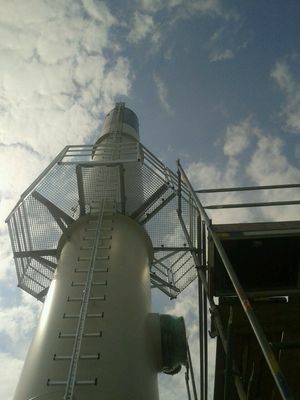 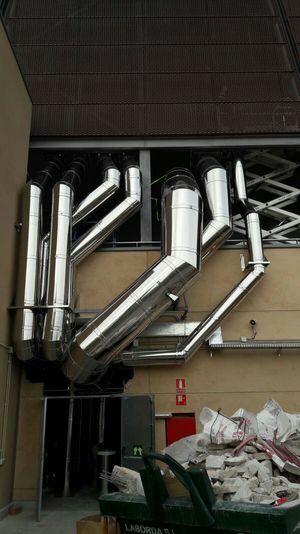 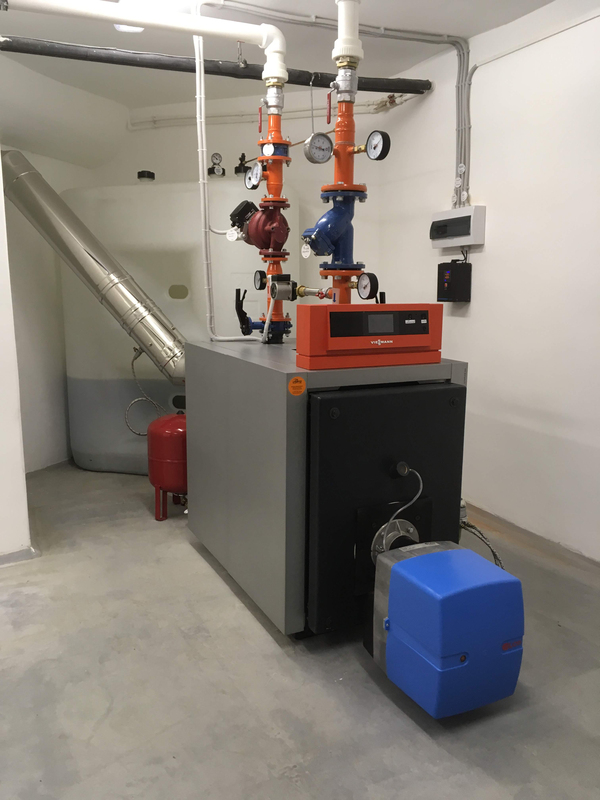 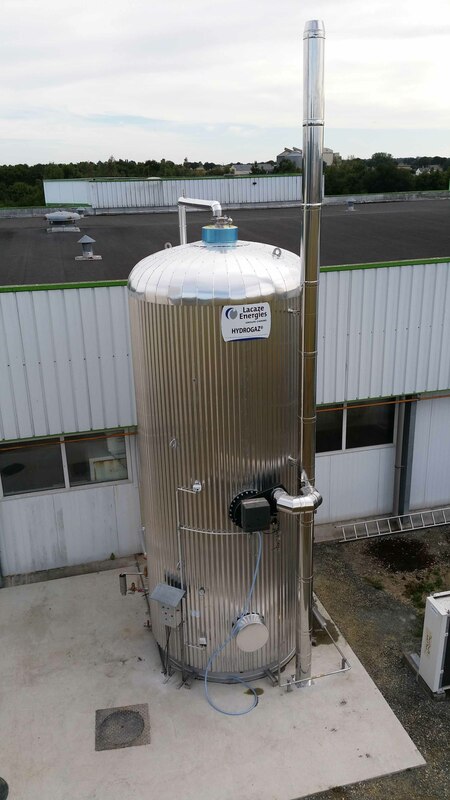 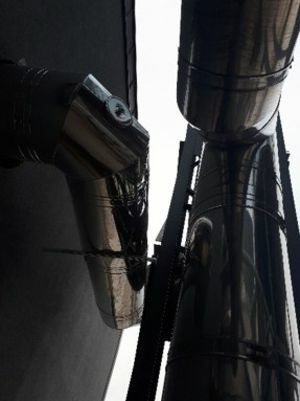 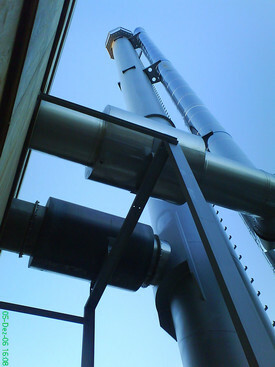 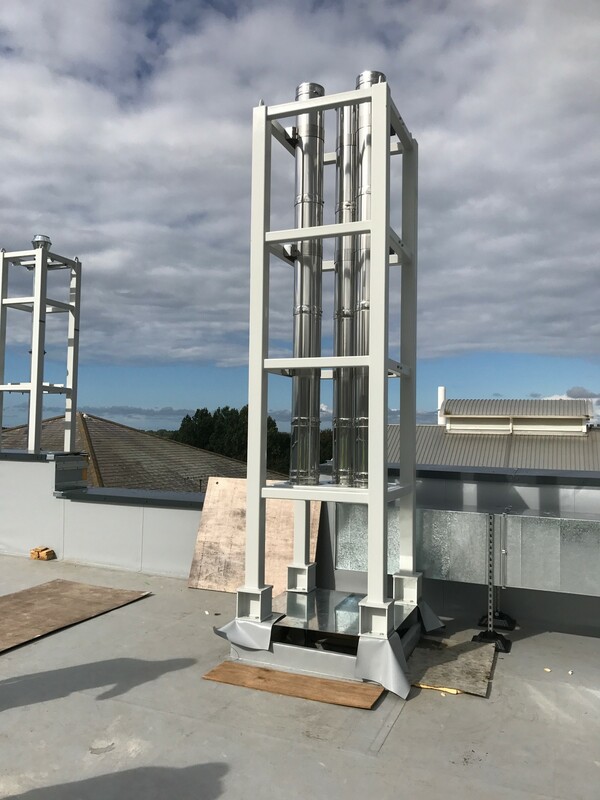 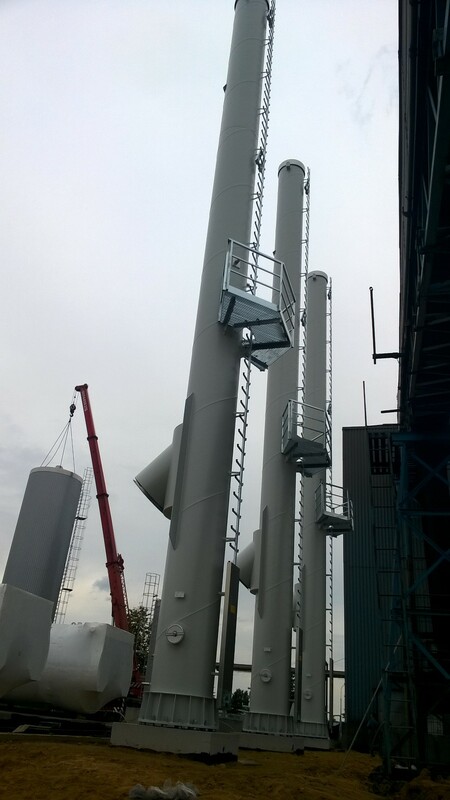 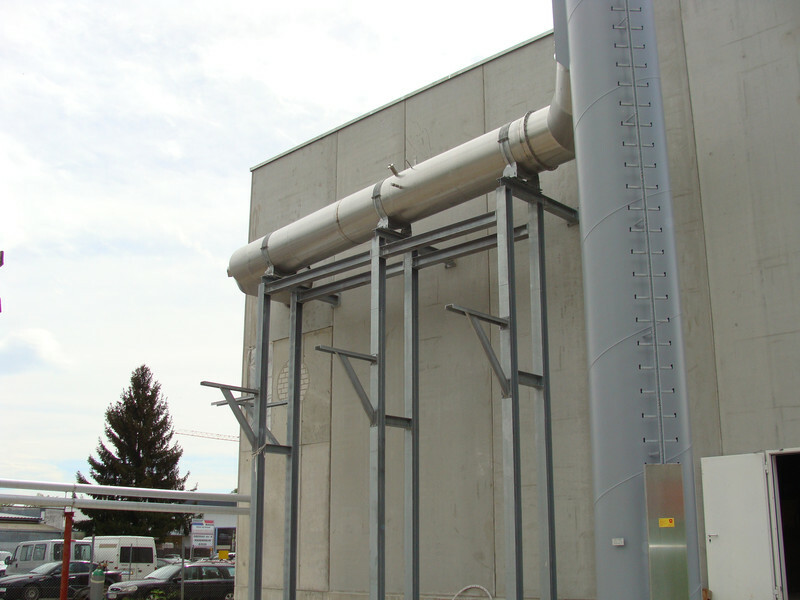 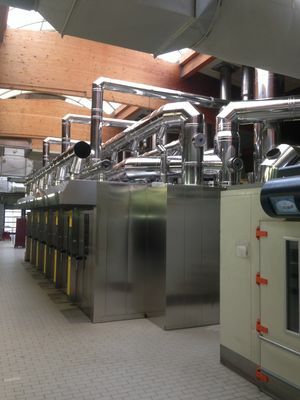 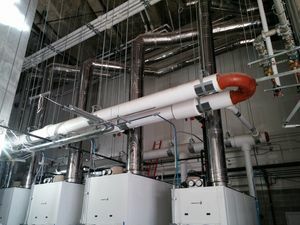 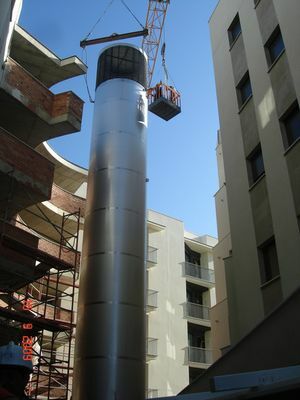 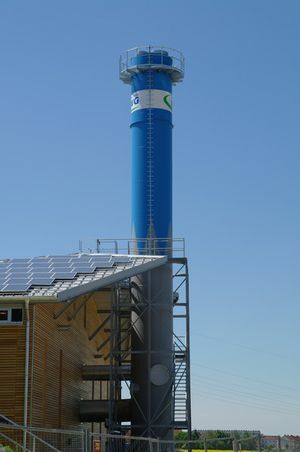 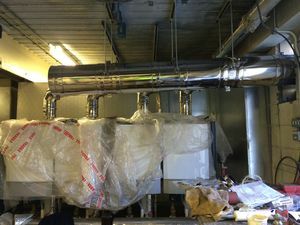 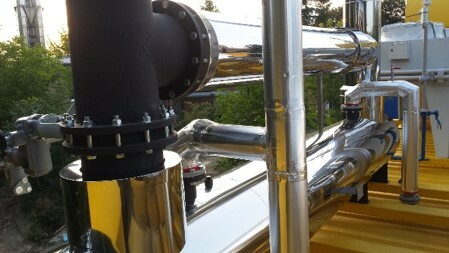 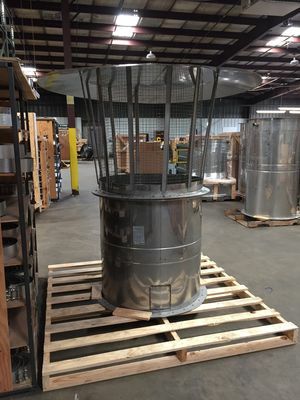 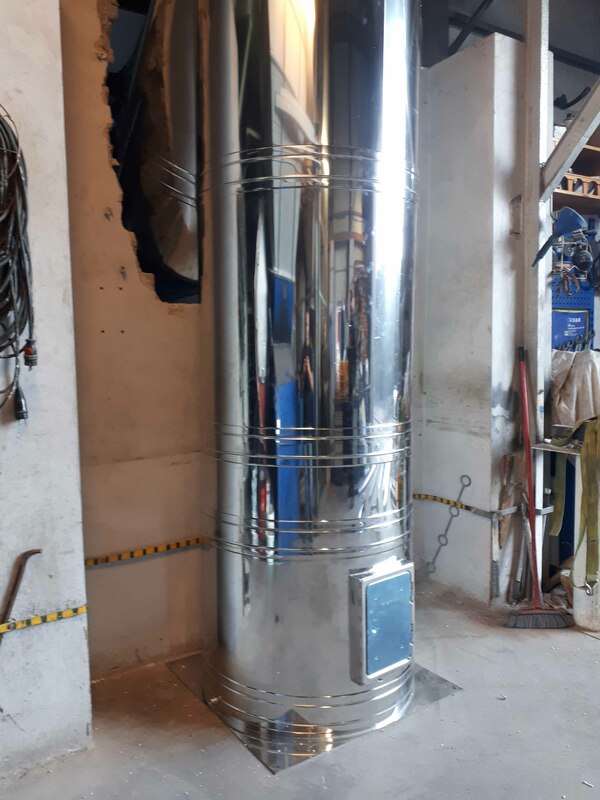 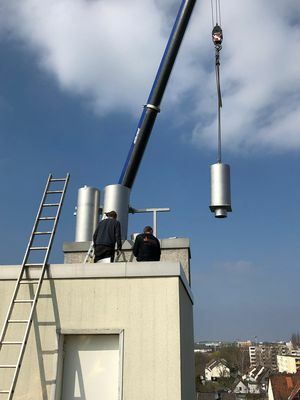 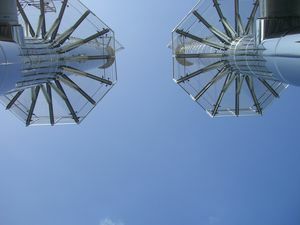 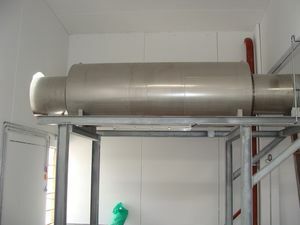 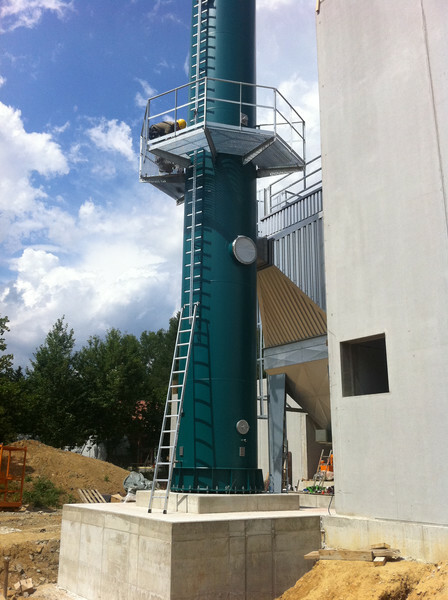 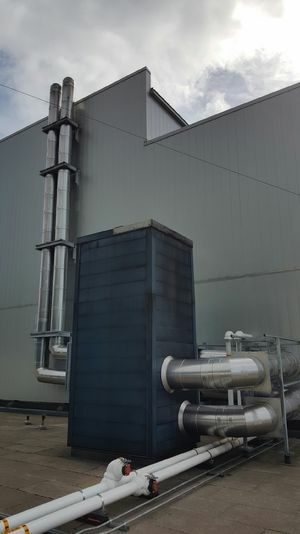 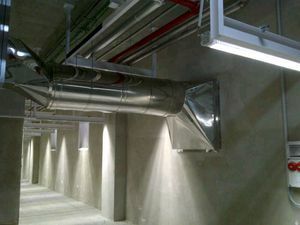 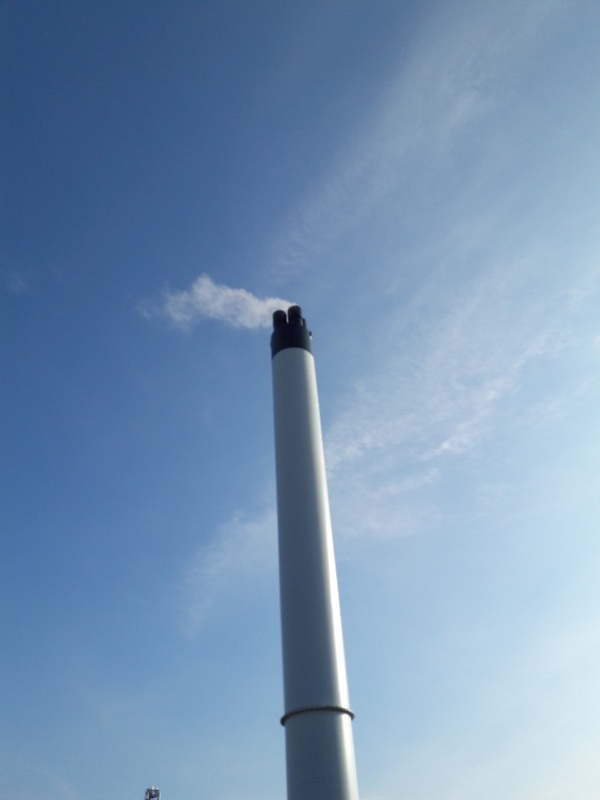 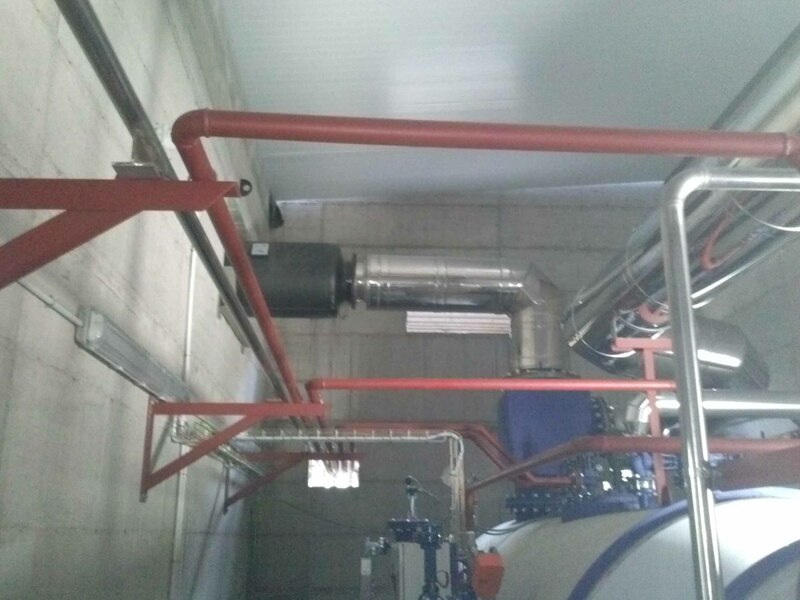 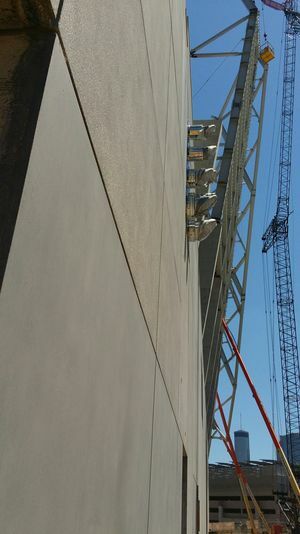 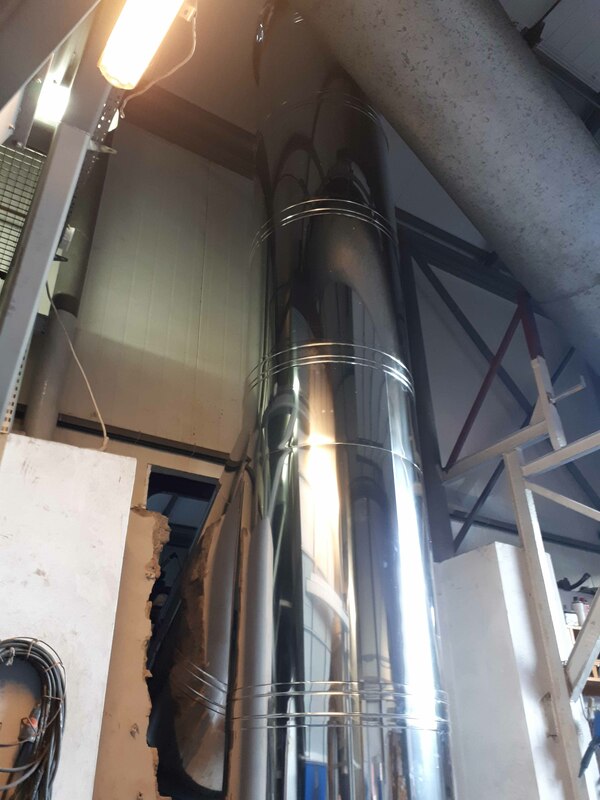 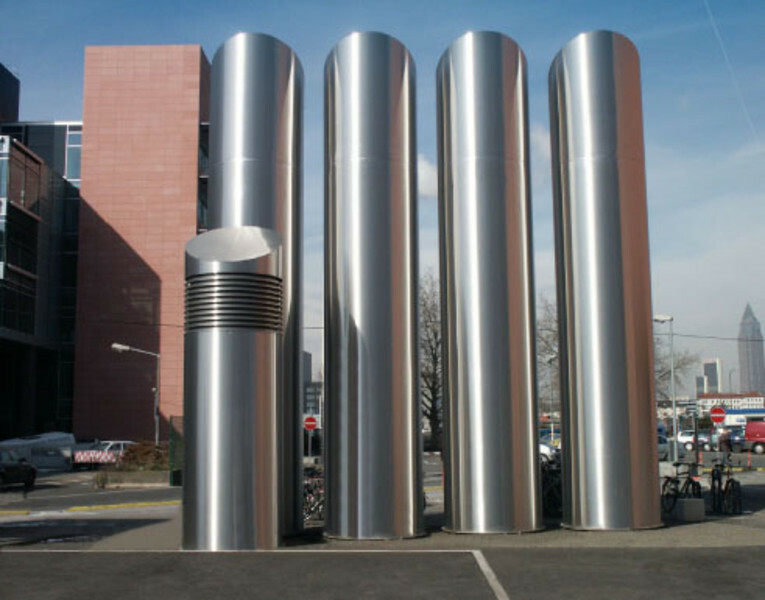 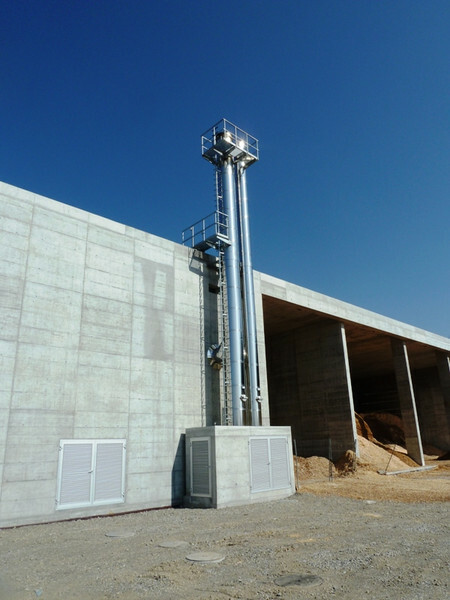 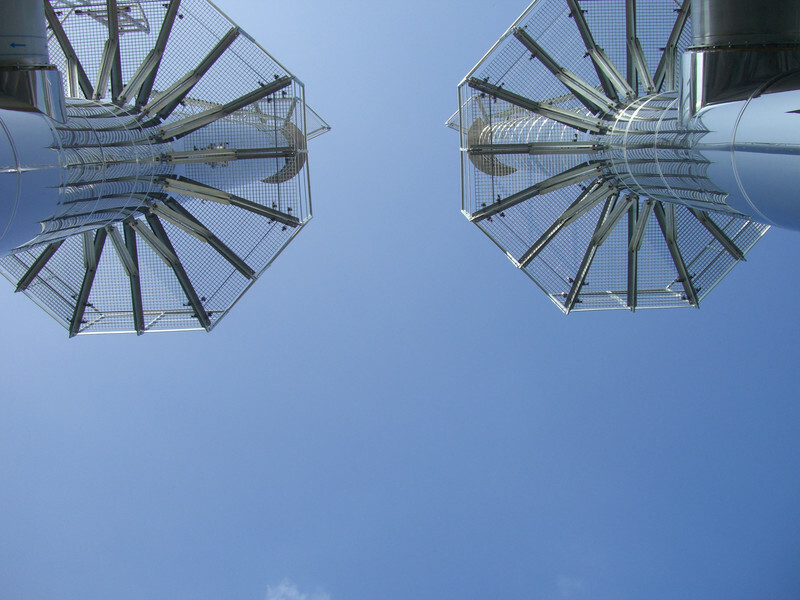 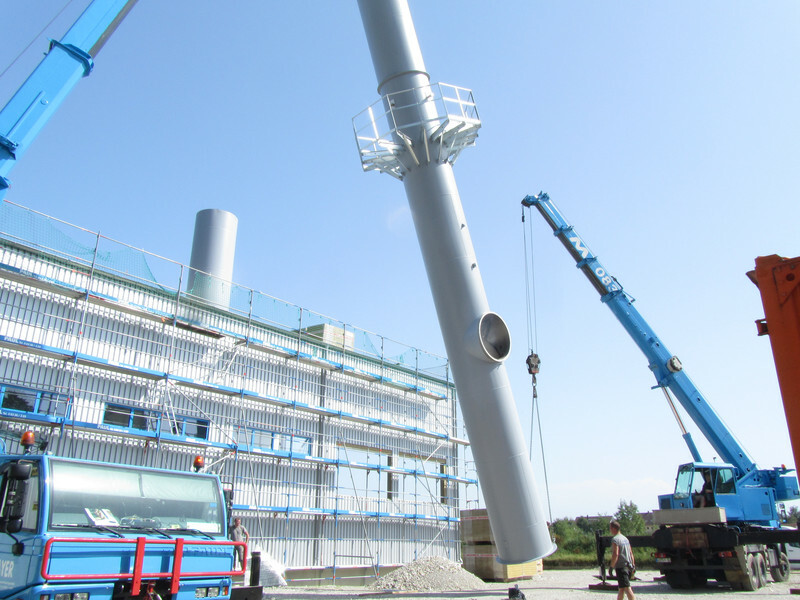 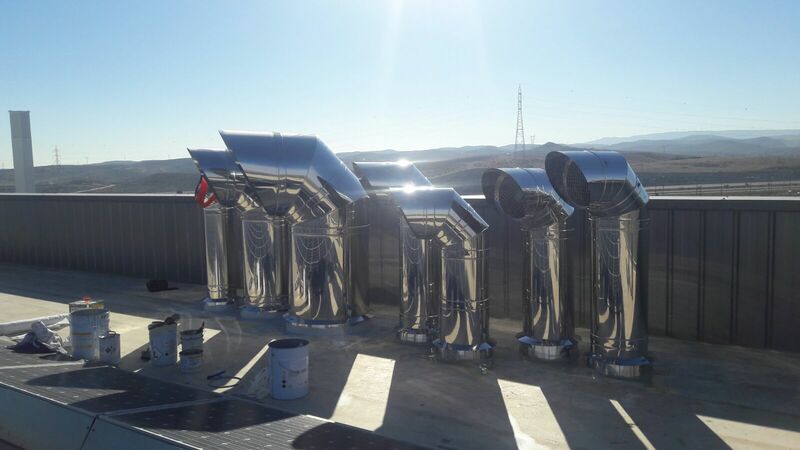 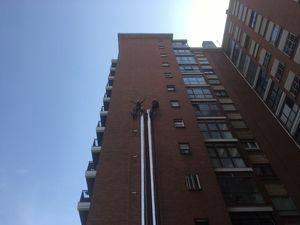 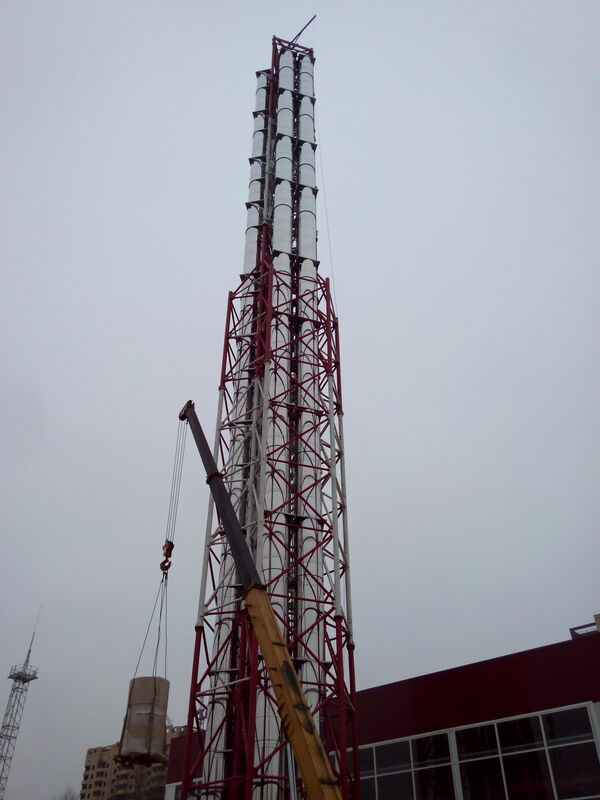 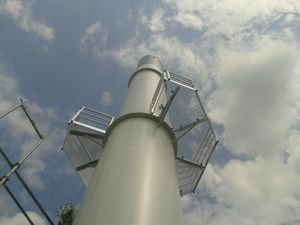 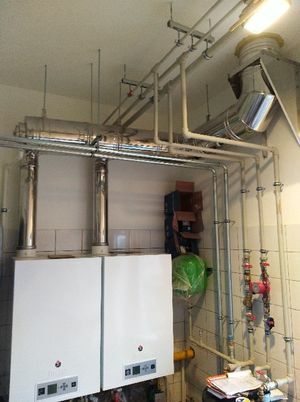 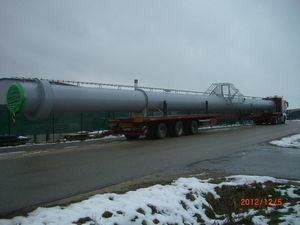 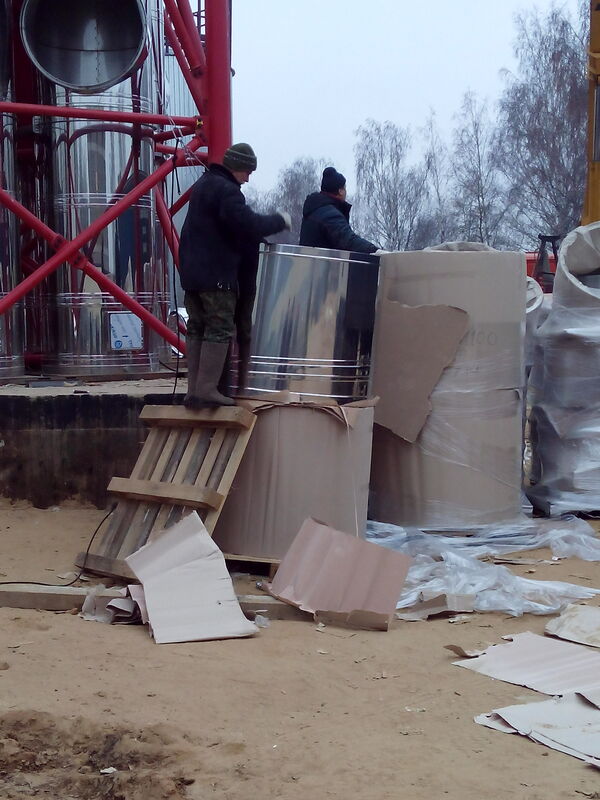 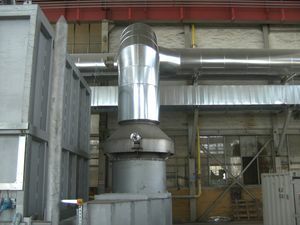 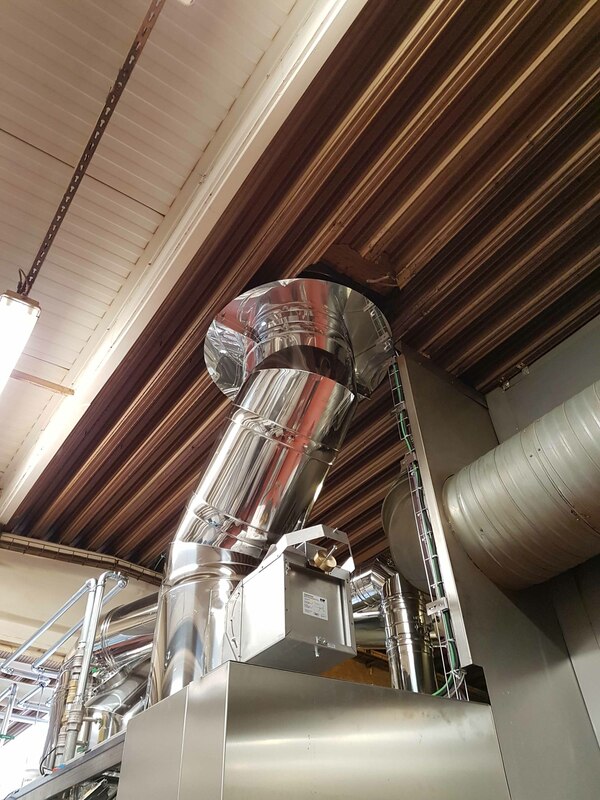 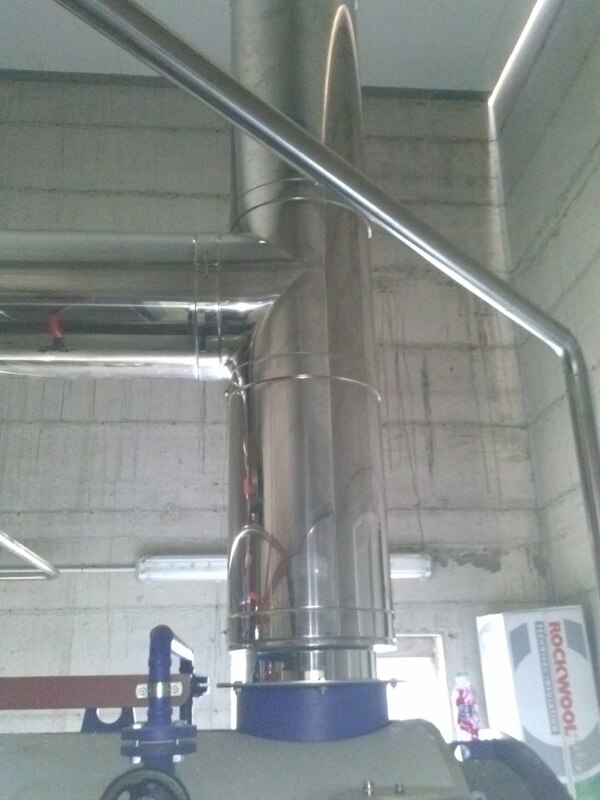 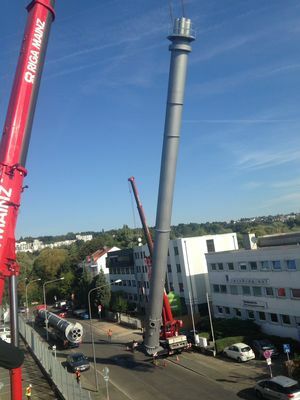 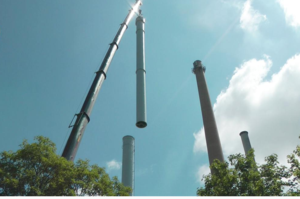 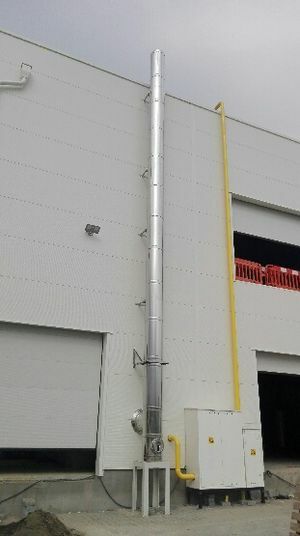 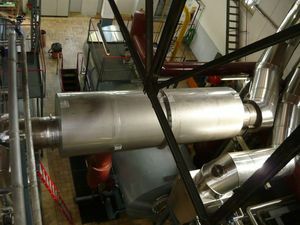 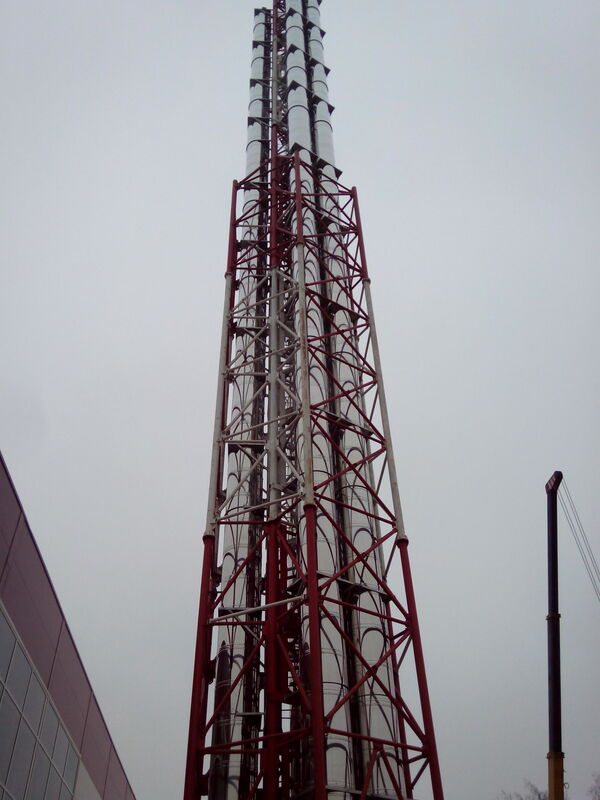 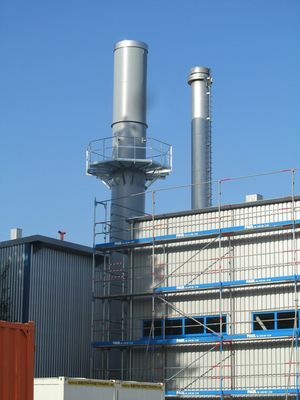 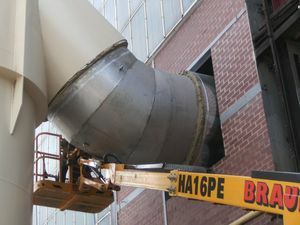 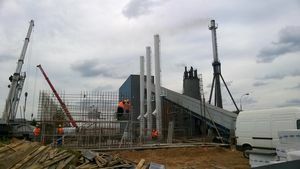 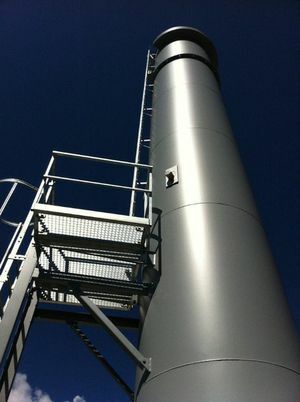 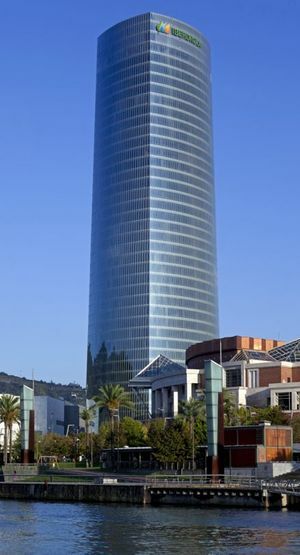 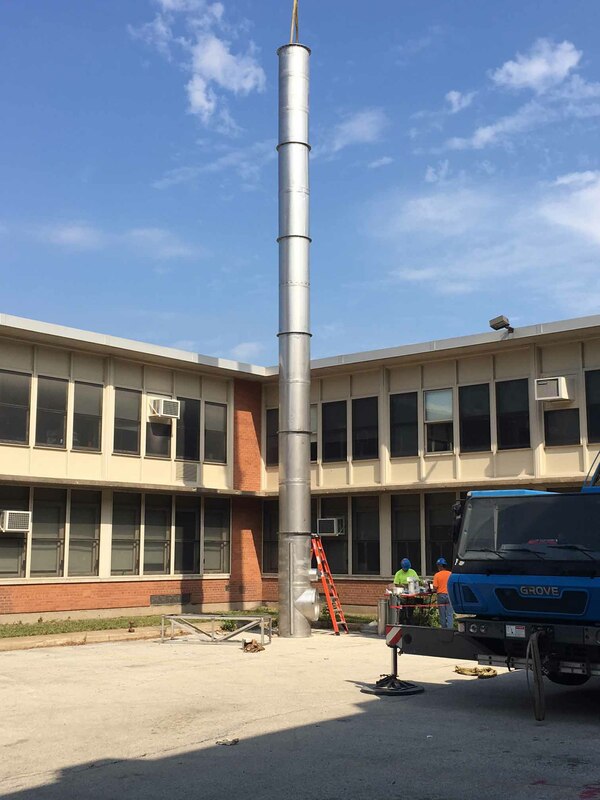 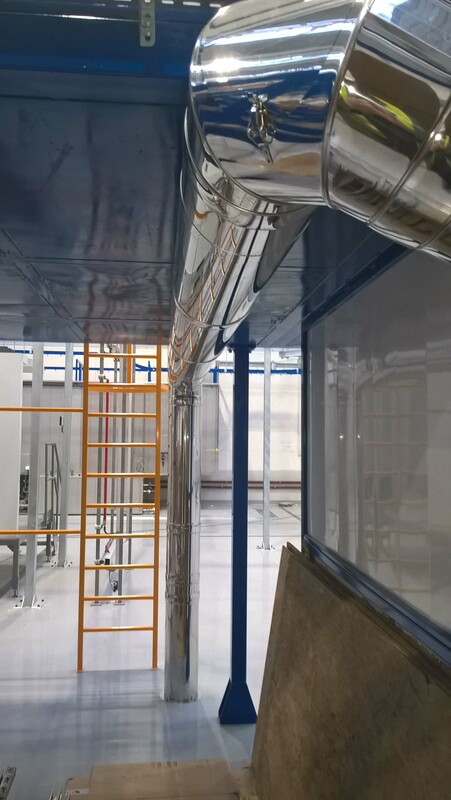 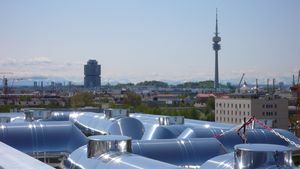 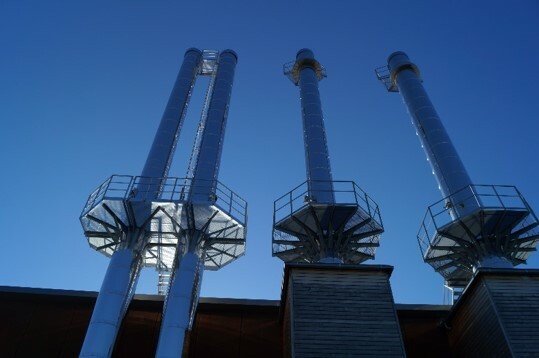 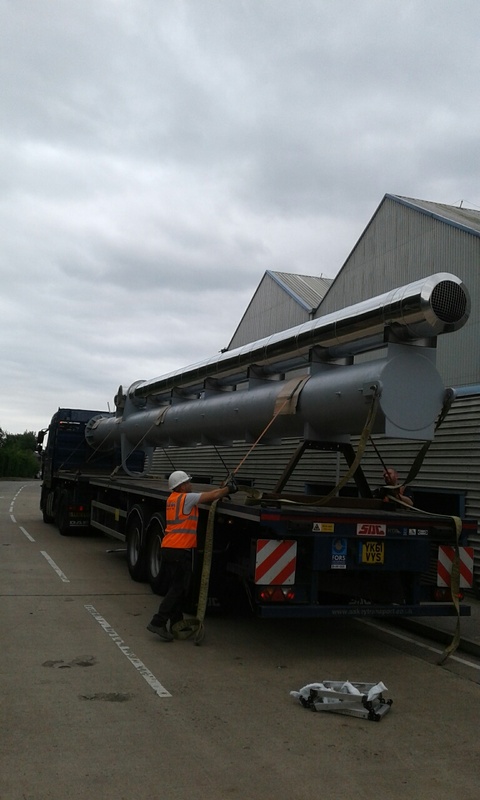 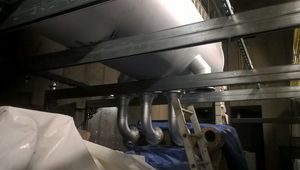 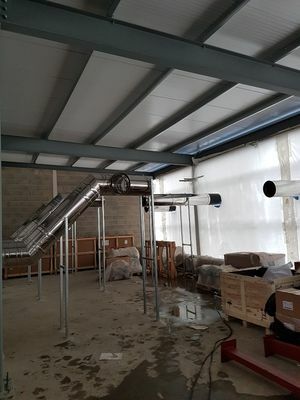 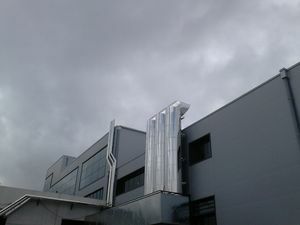 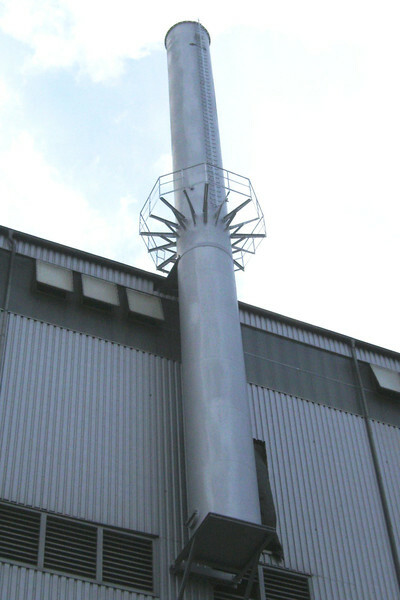 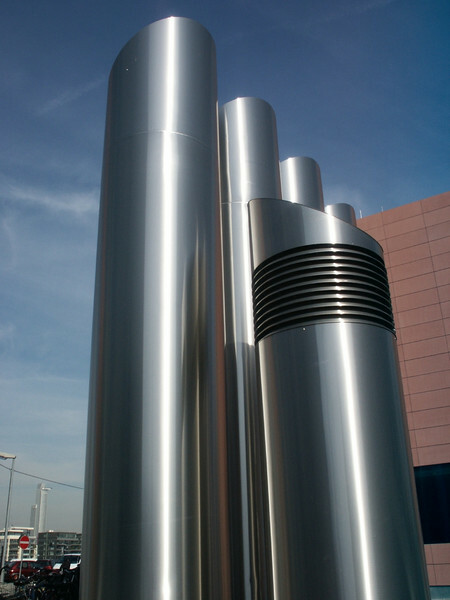 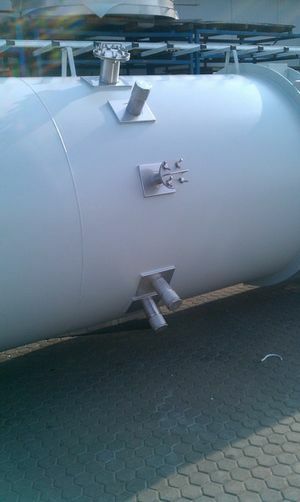 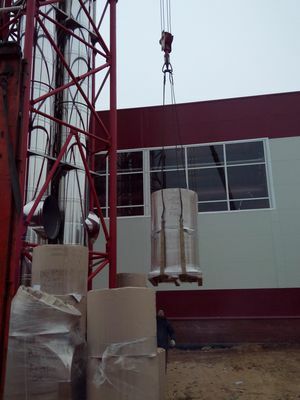 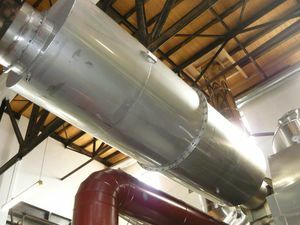 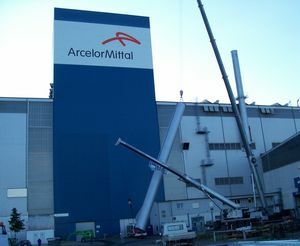 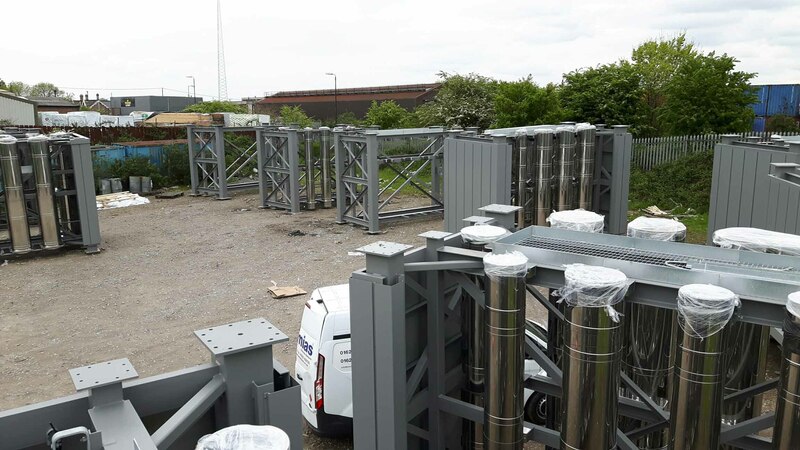 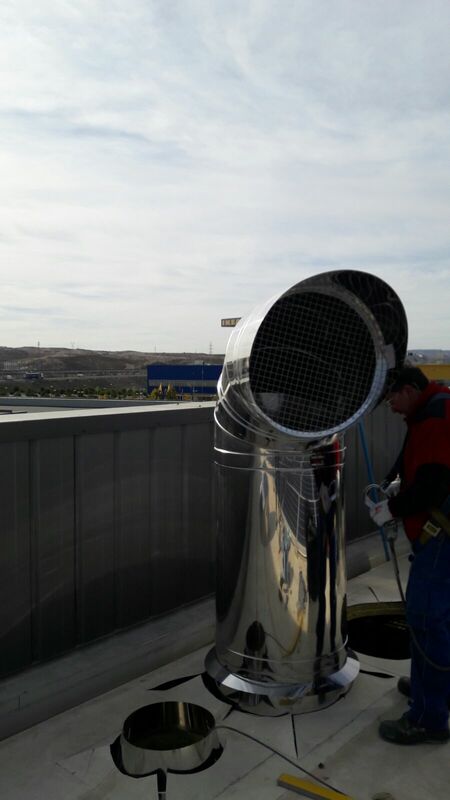 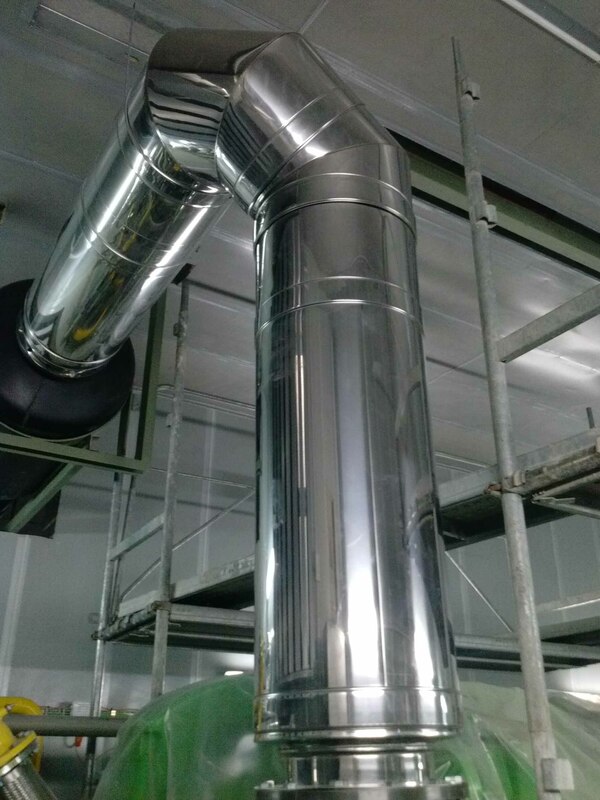 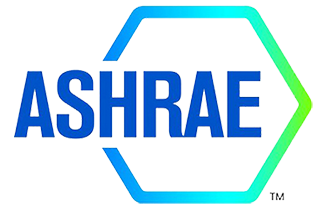 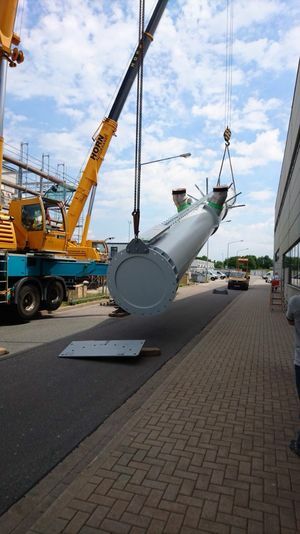 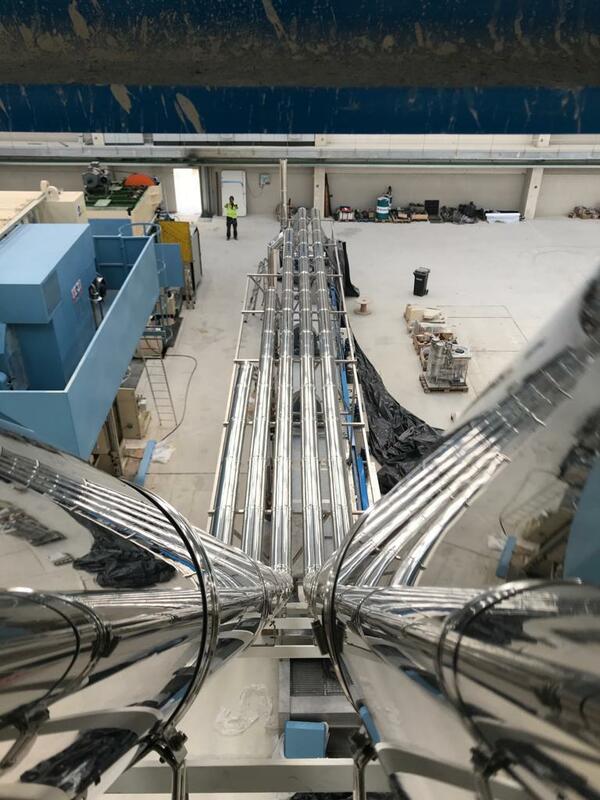 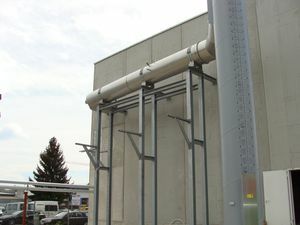 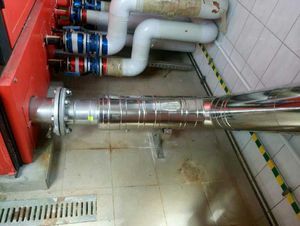 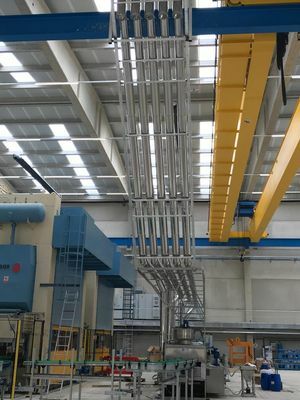 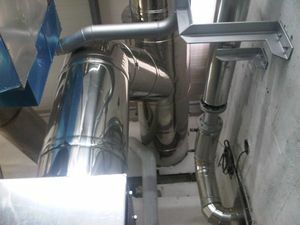 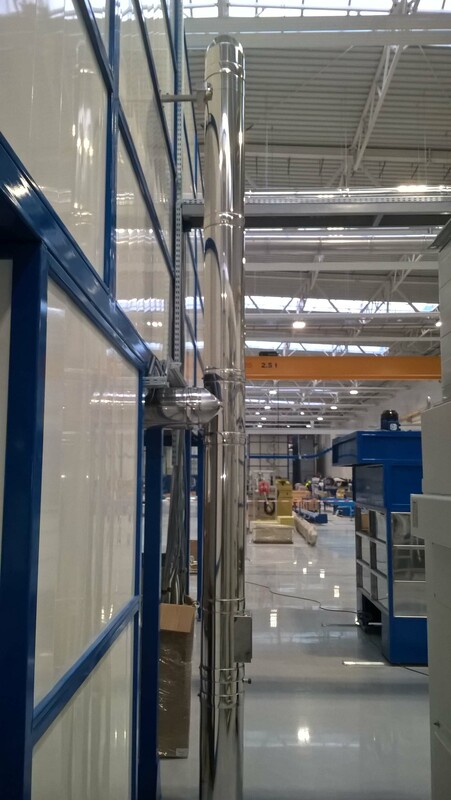 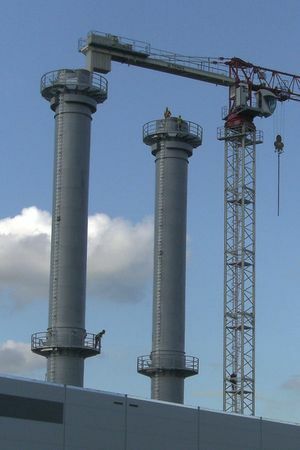 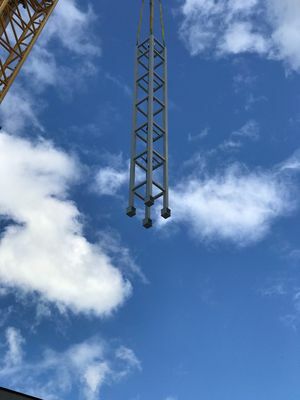 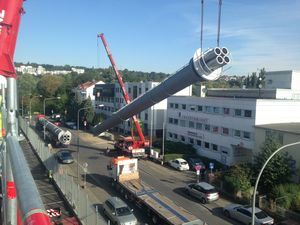 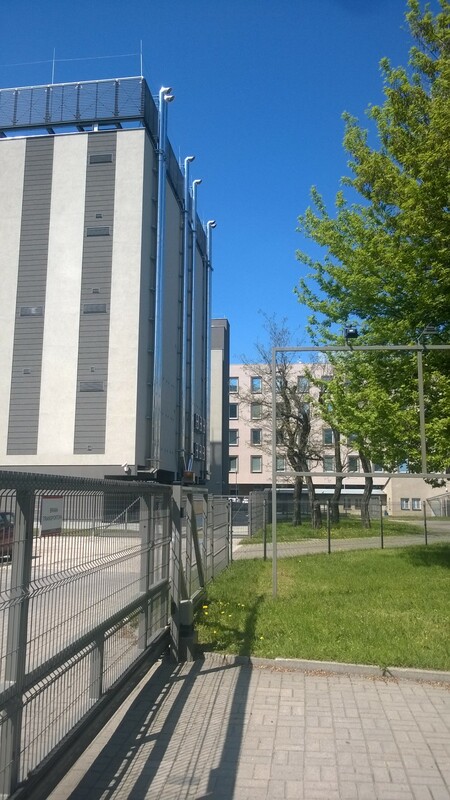 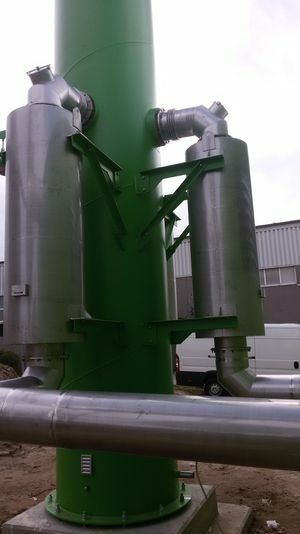 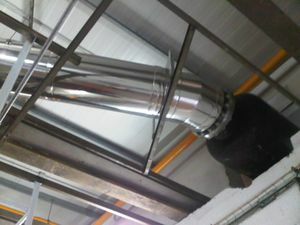 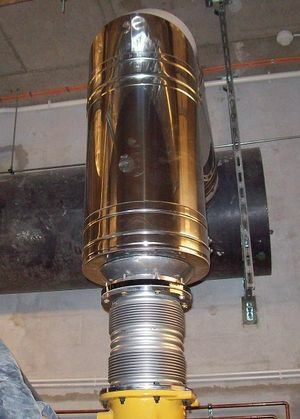 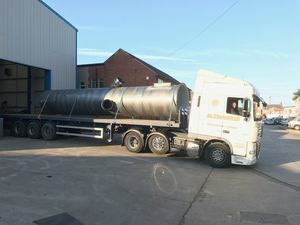 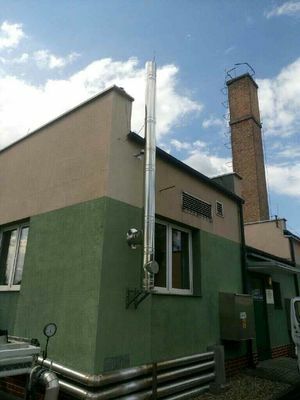 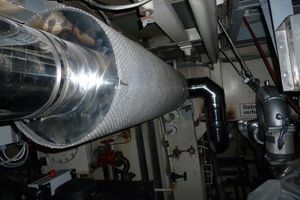 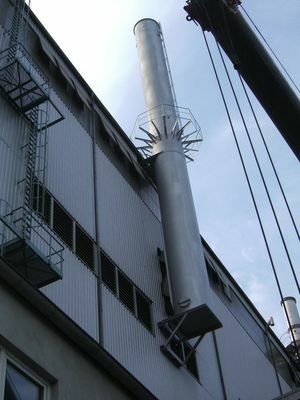 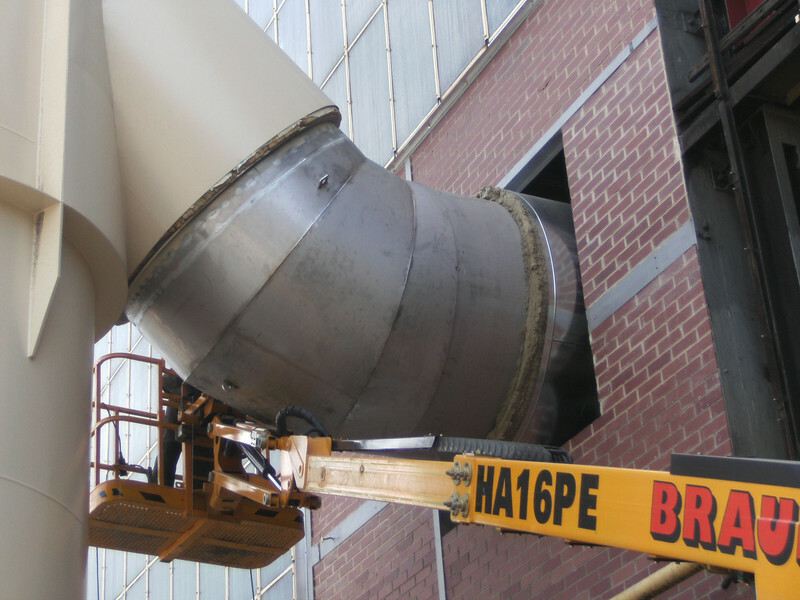 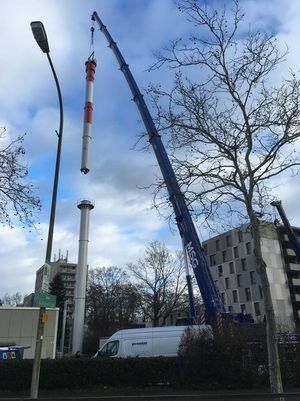 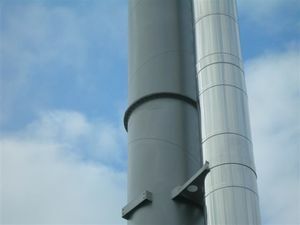 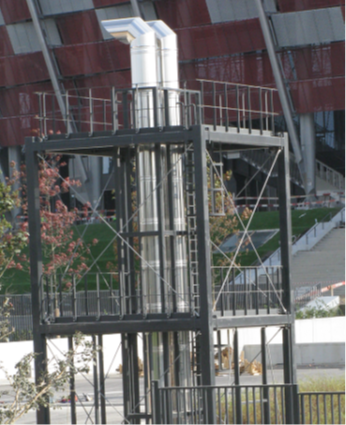 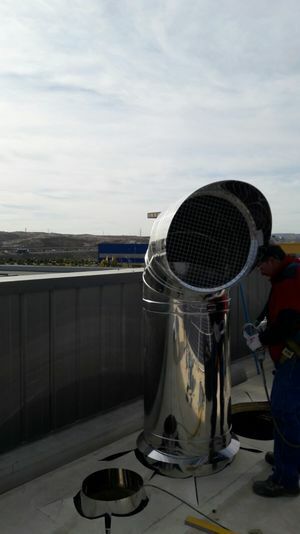 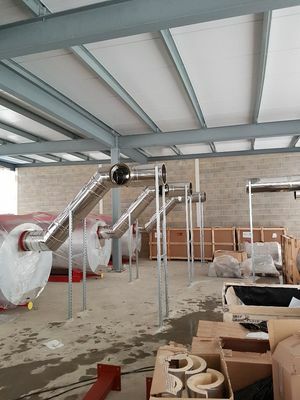 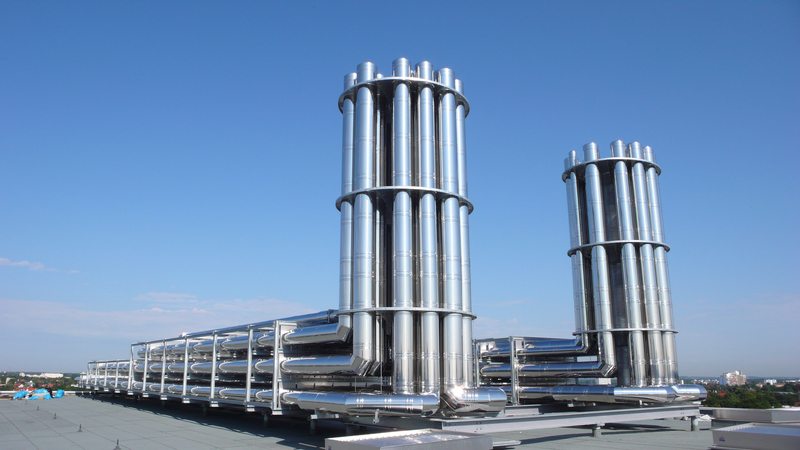 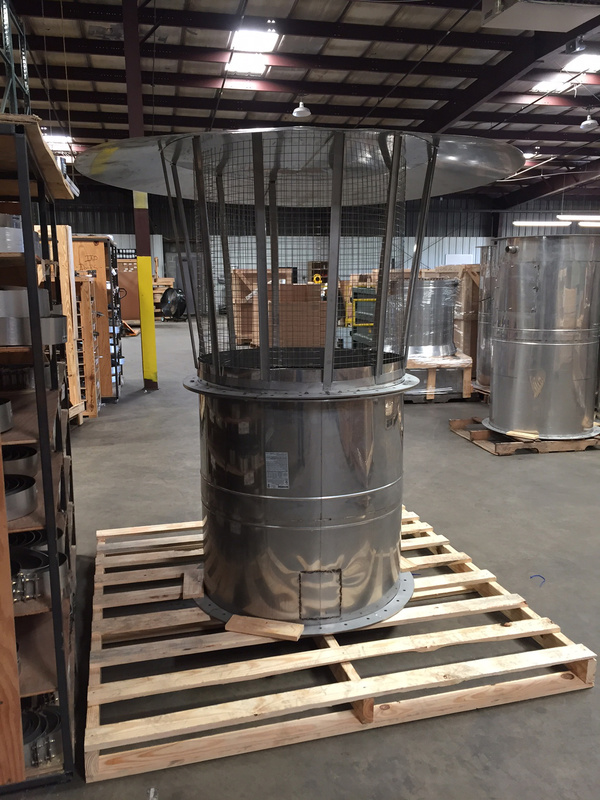 Chimney for the extraction of the waste air of lacquering systems with 350ºC. 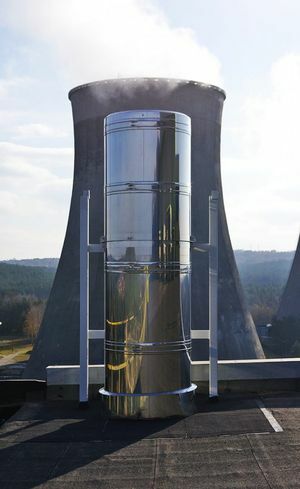 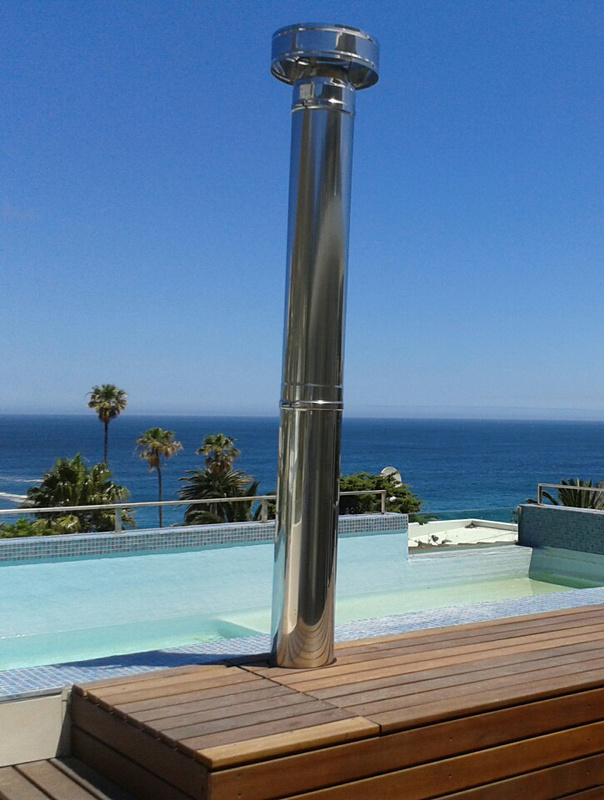 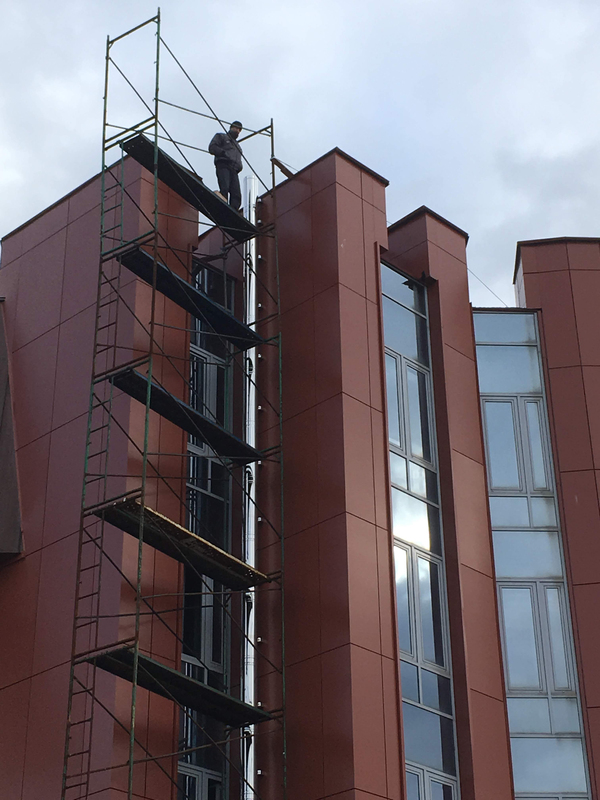 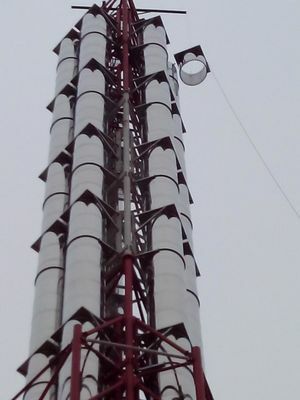 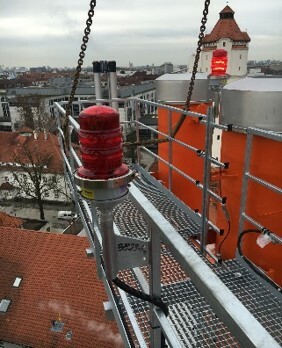 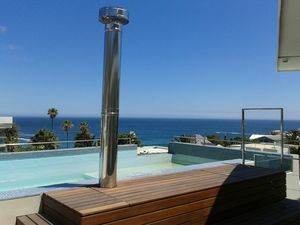 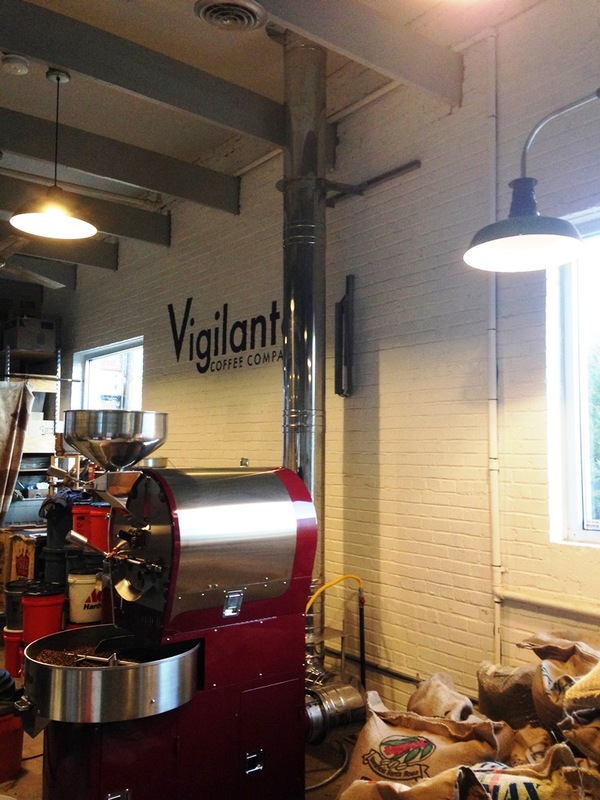 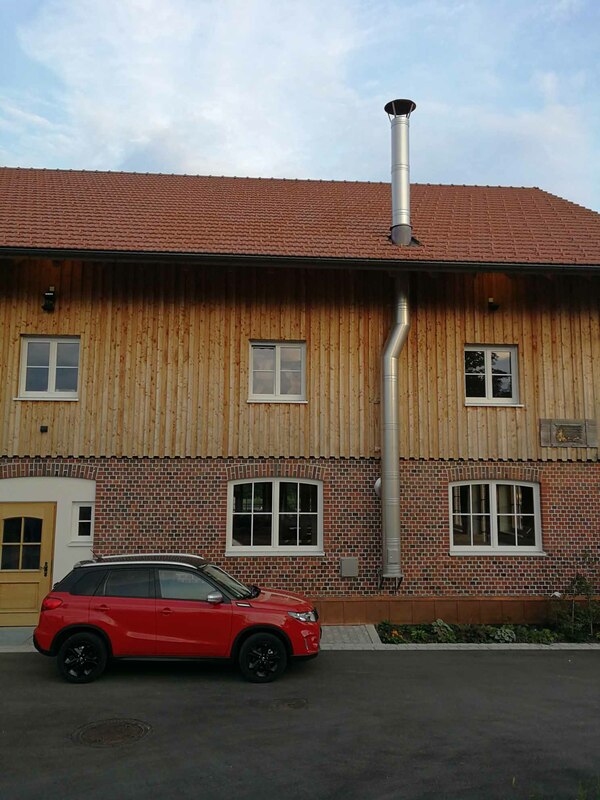 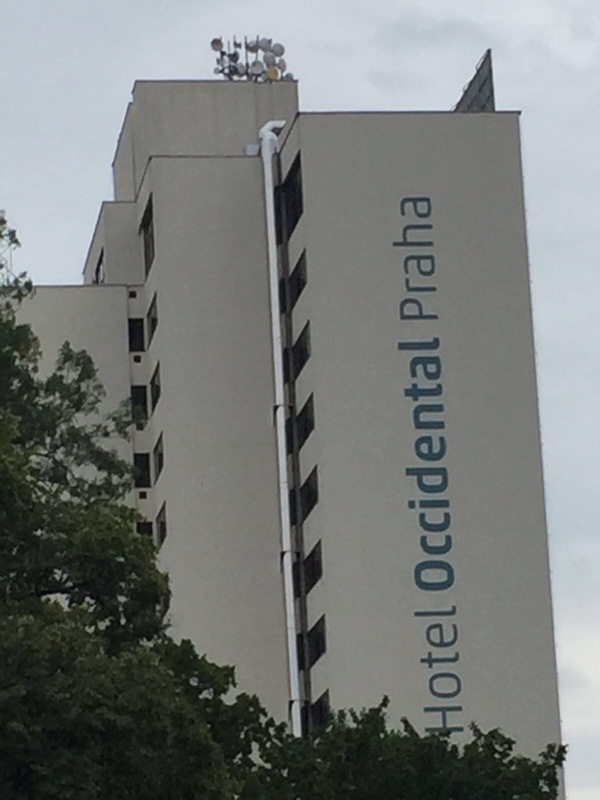 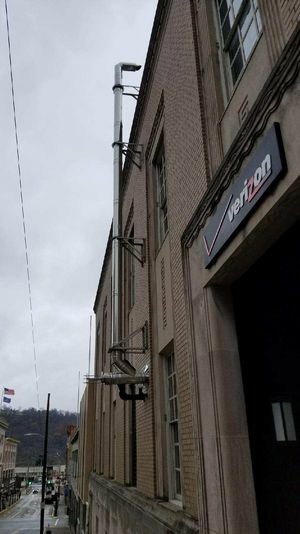 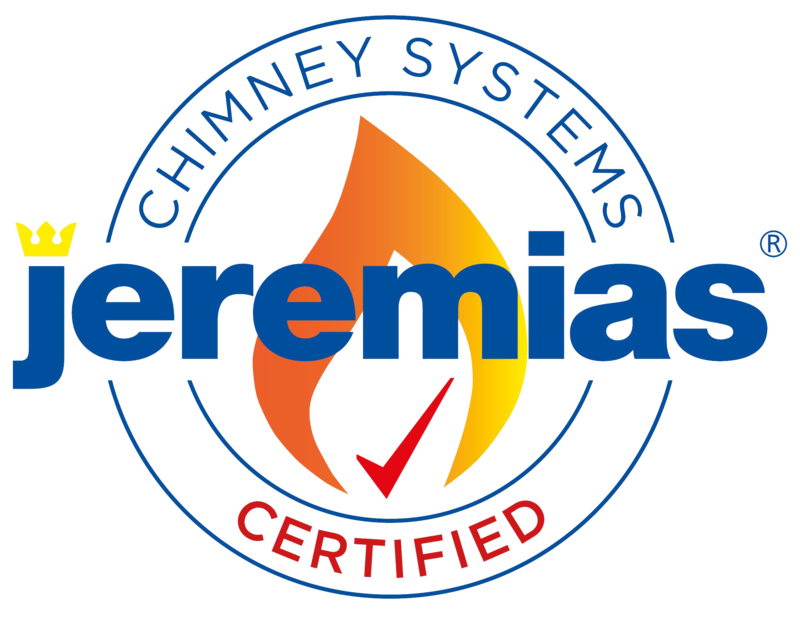 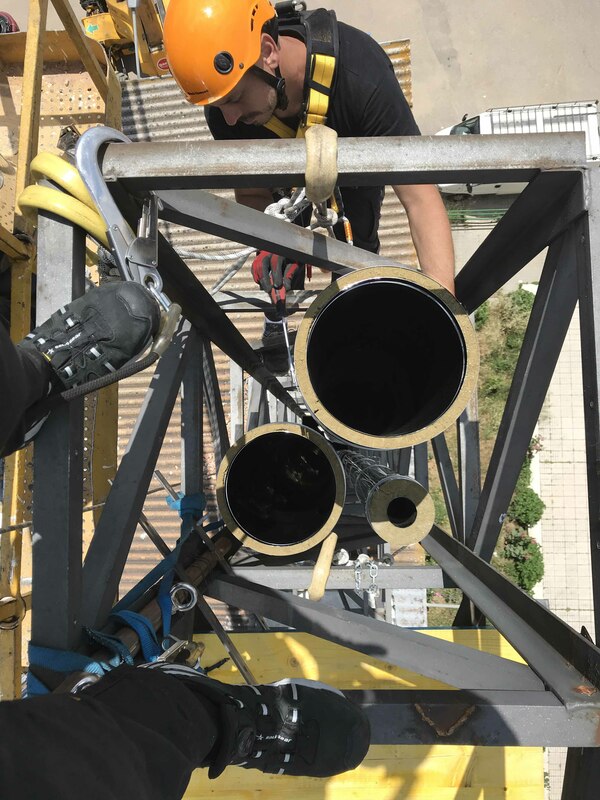 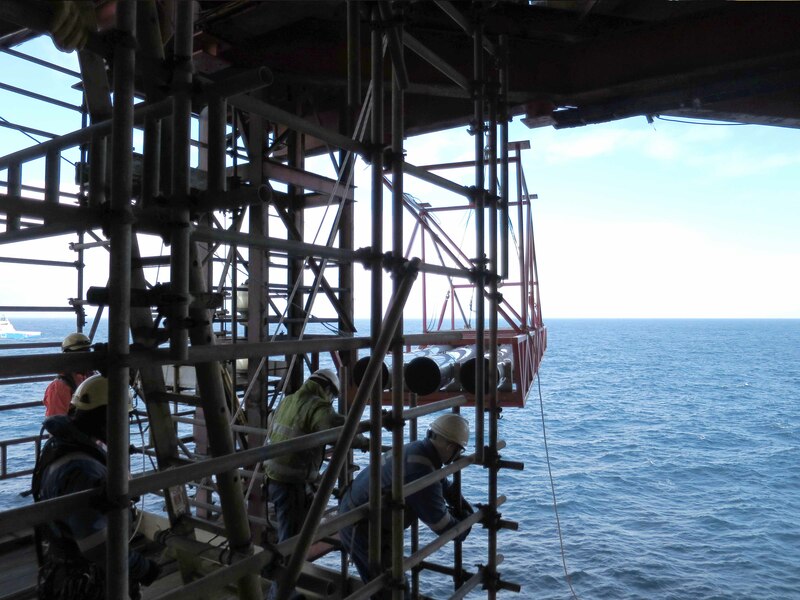 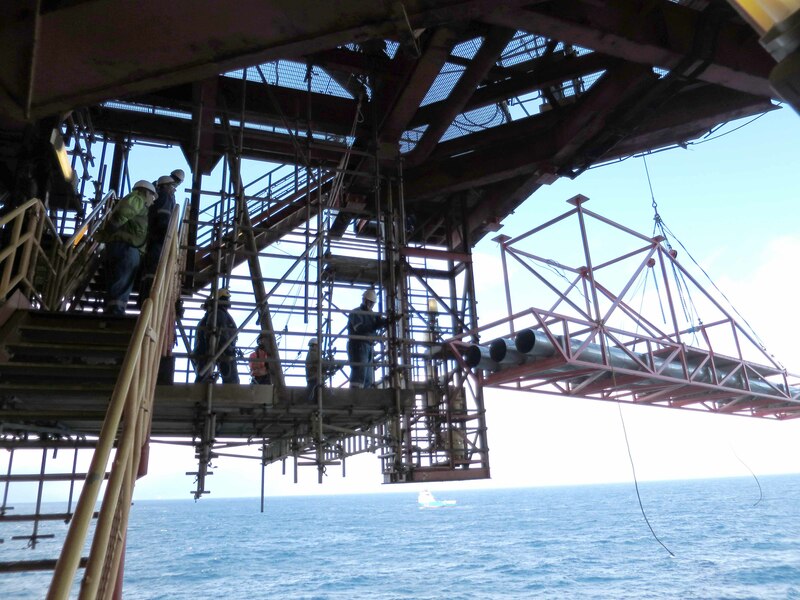 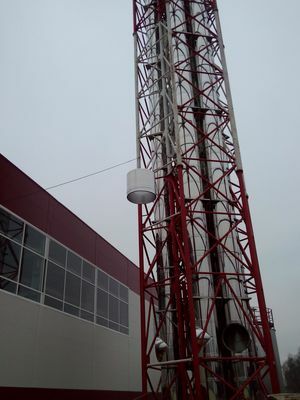 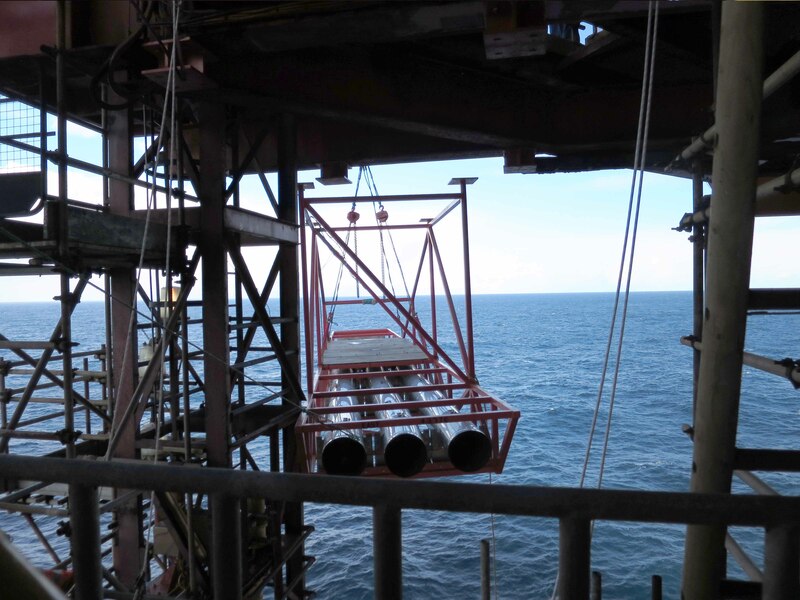 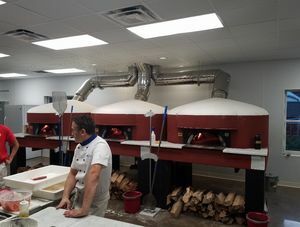 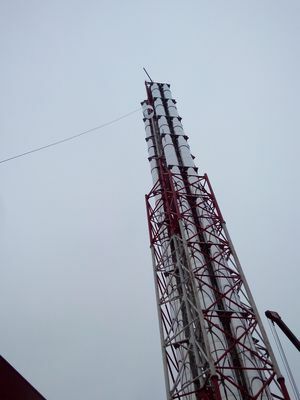 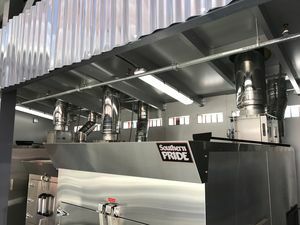 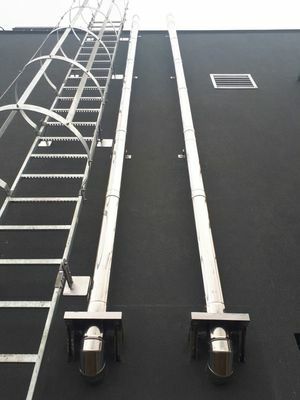 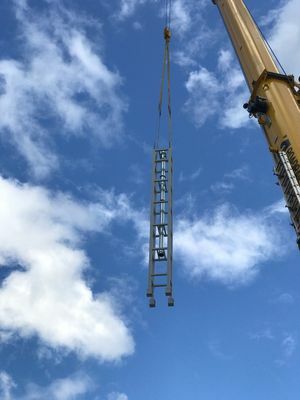 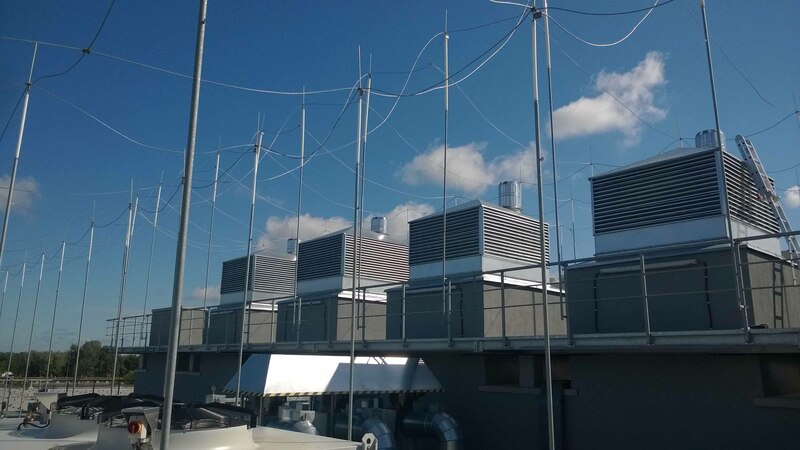 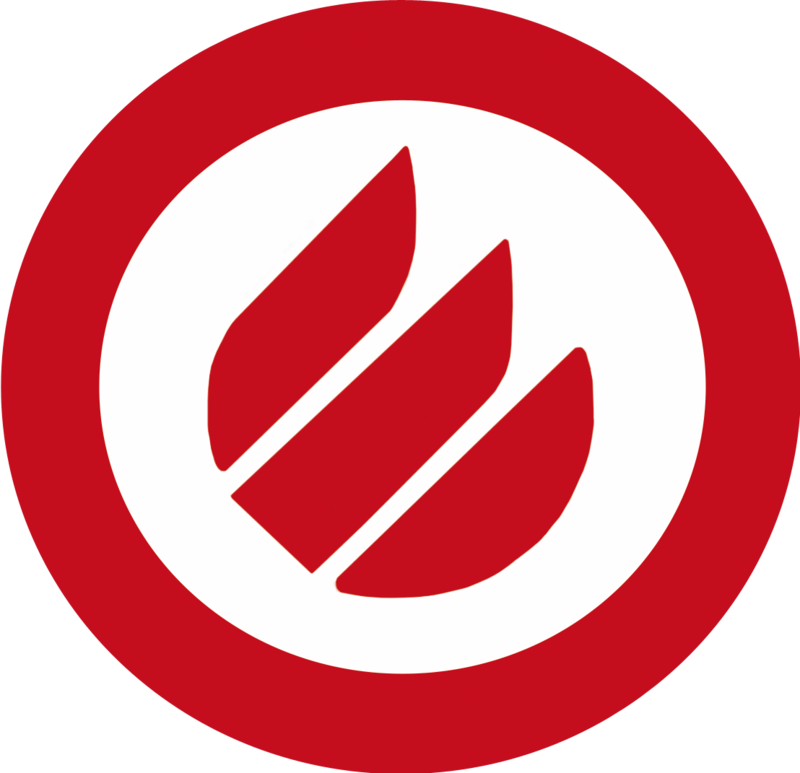 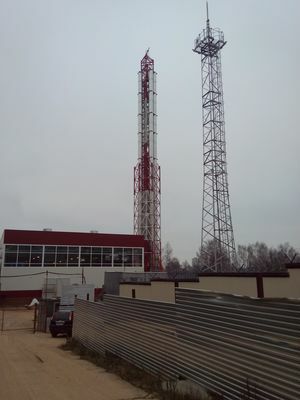 Based on several demands of the customers the chimney has been equipped with 4 platforms (2x135º/1x180º/1x360º as platform). 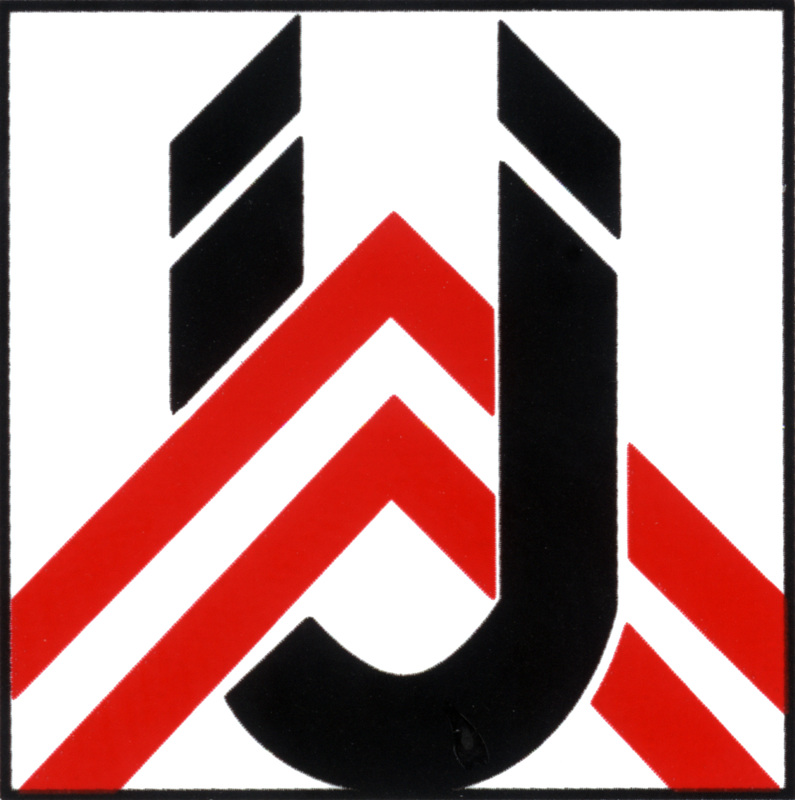 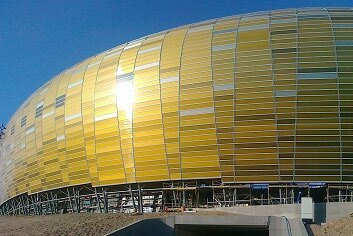 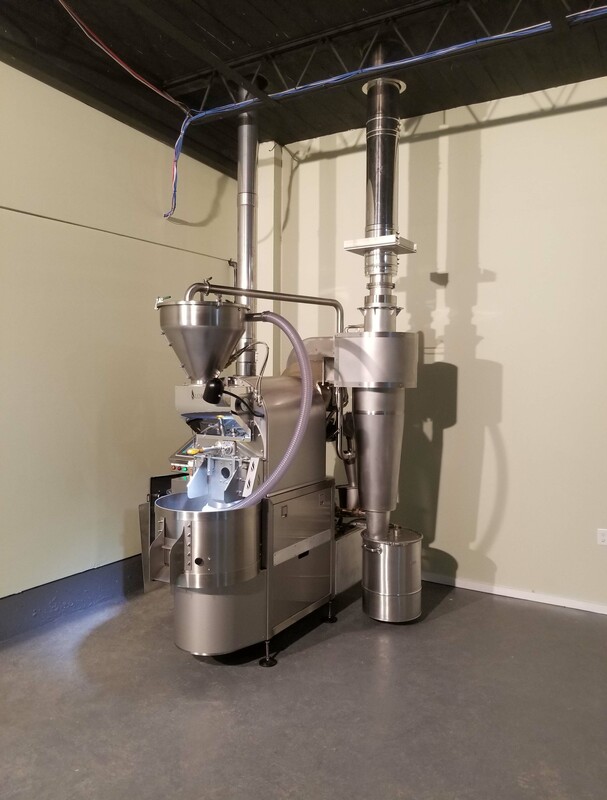 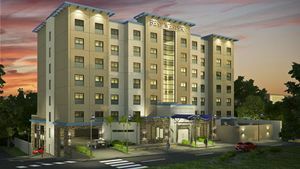 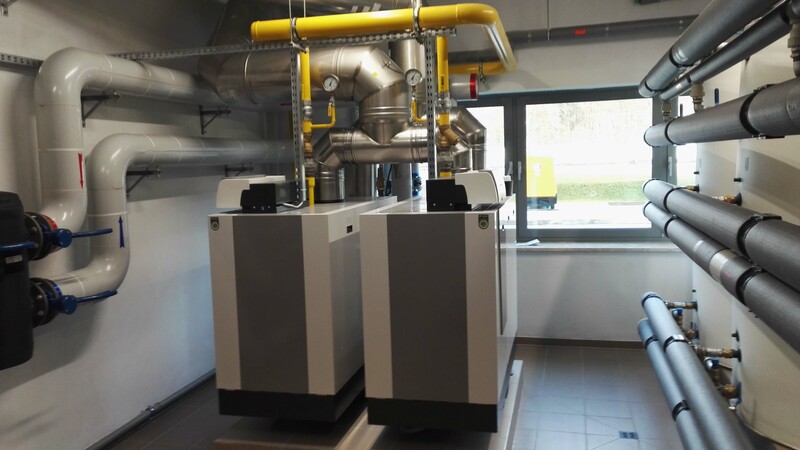 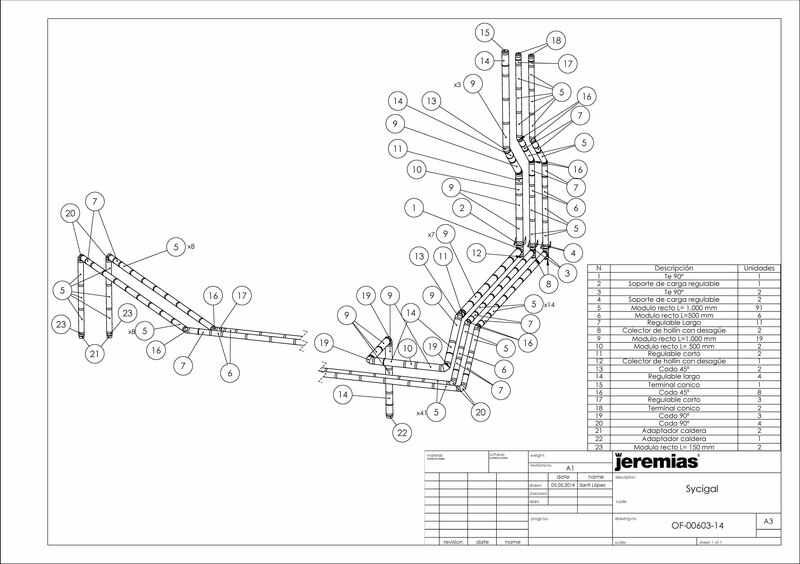 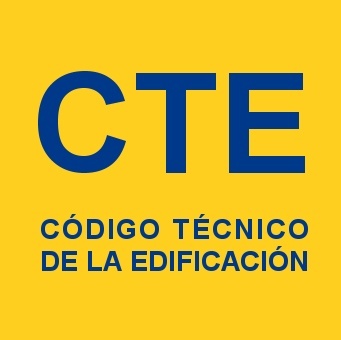 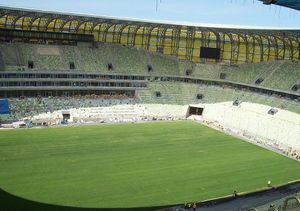 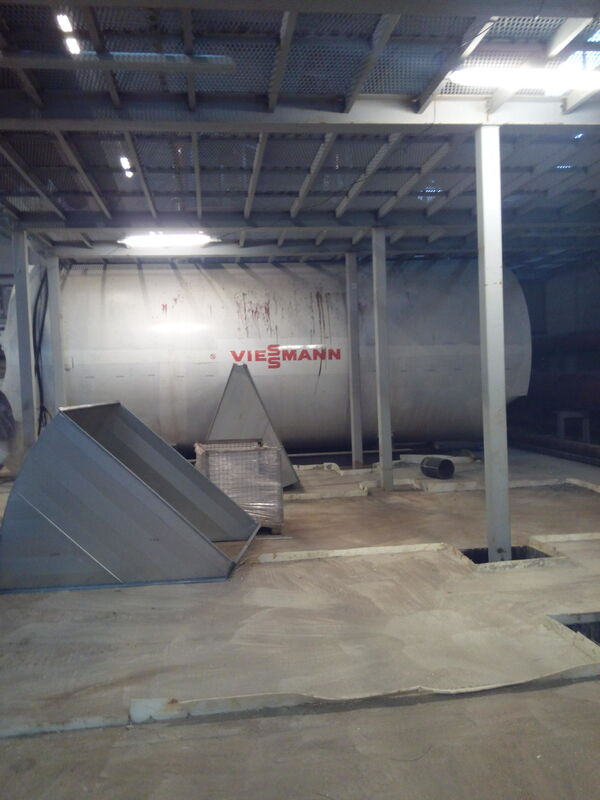 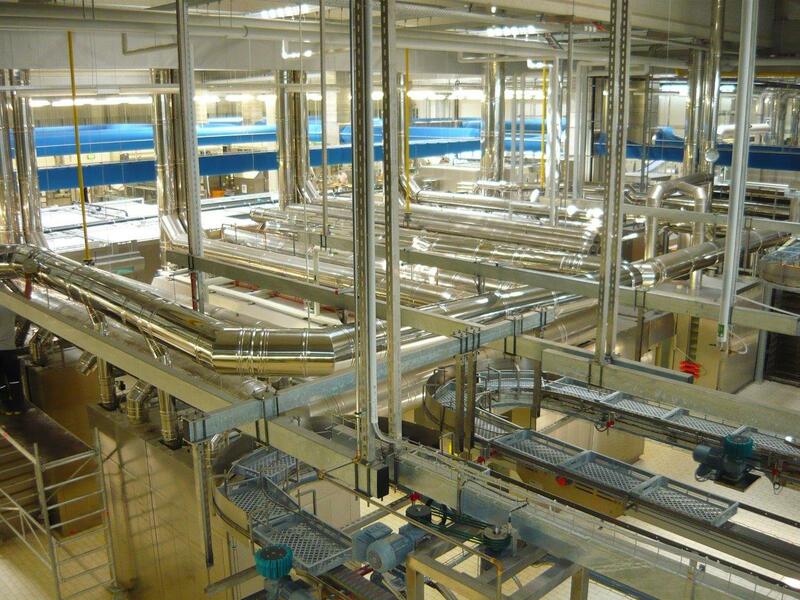 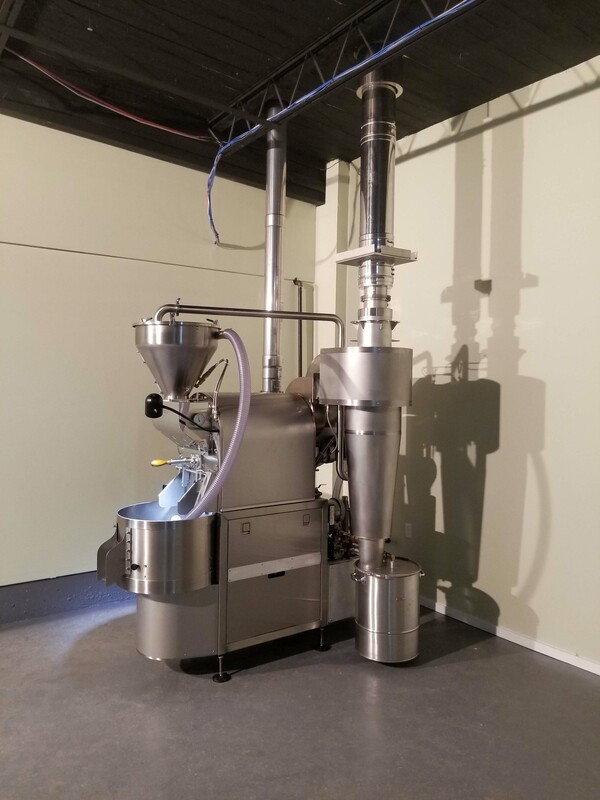 Besides planning, project management and production also logistics inlcuding installation is a part of the service of Jeremias. 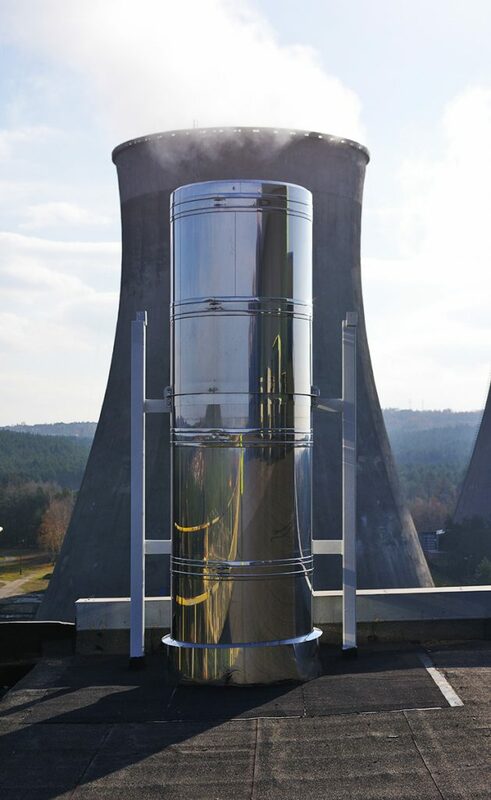 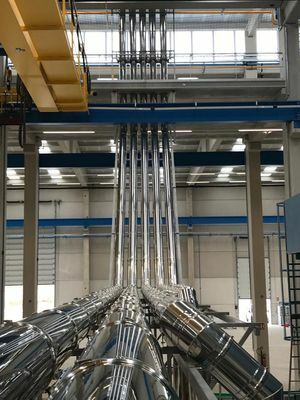 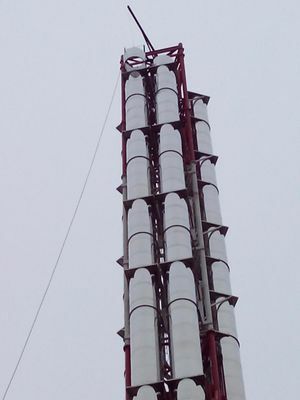 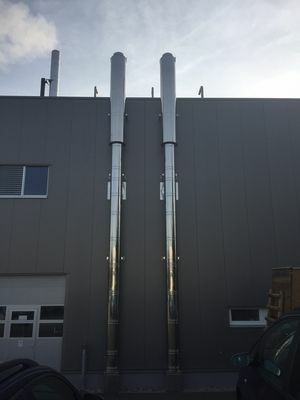 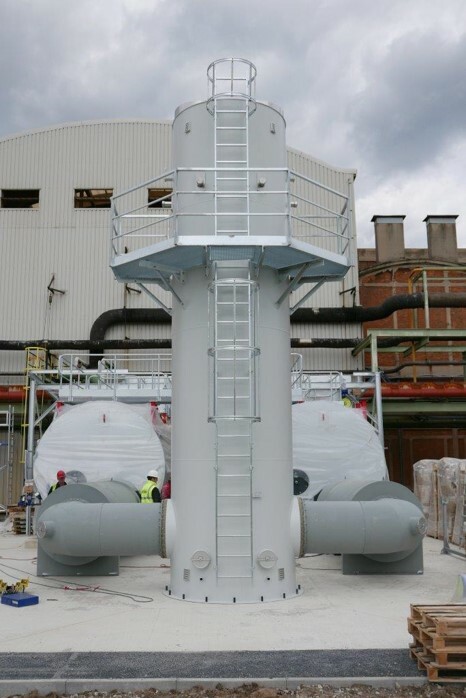 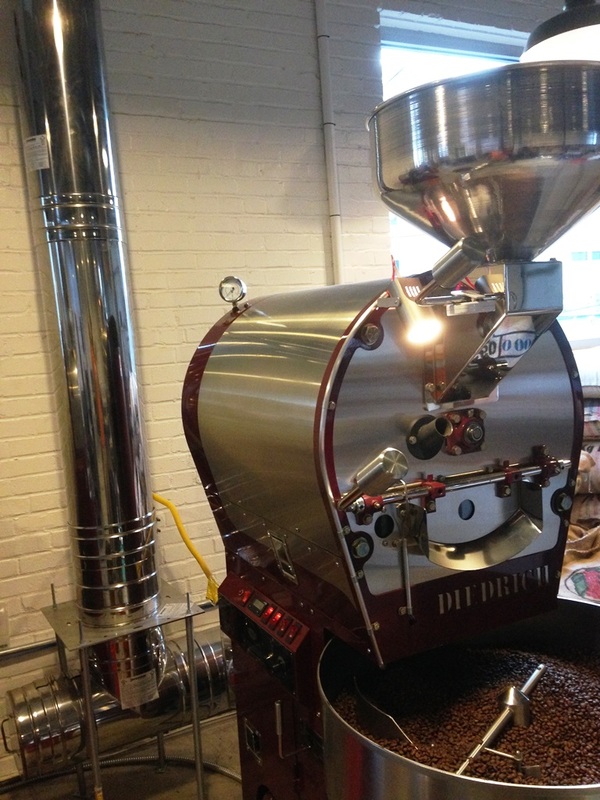 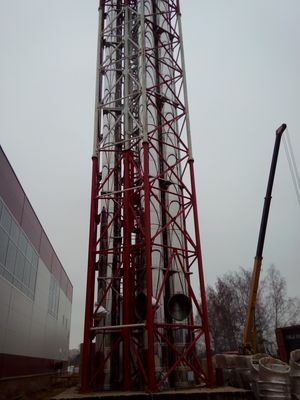 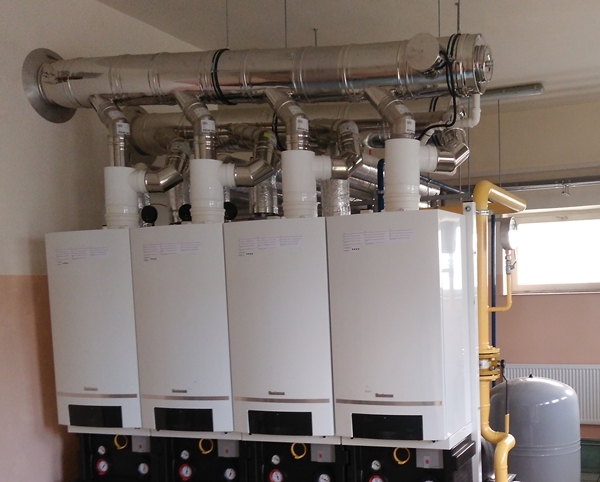 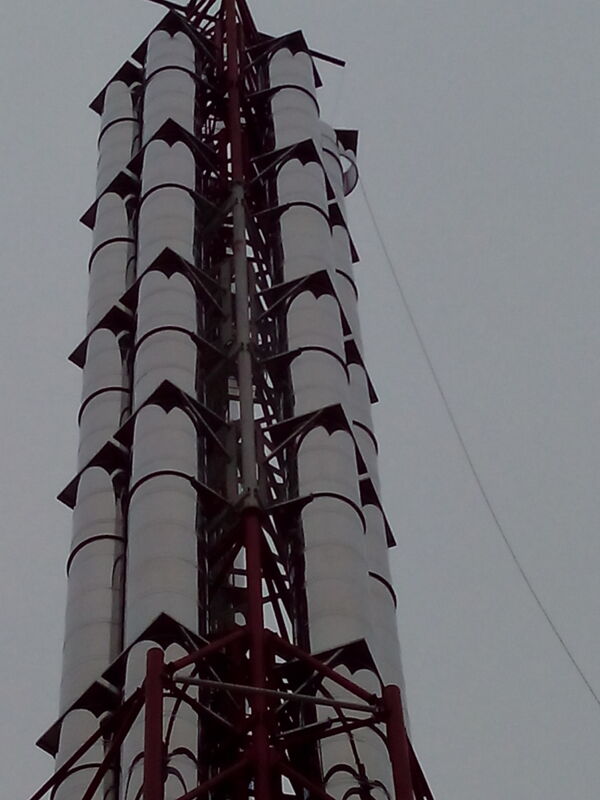 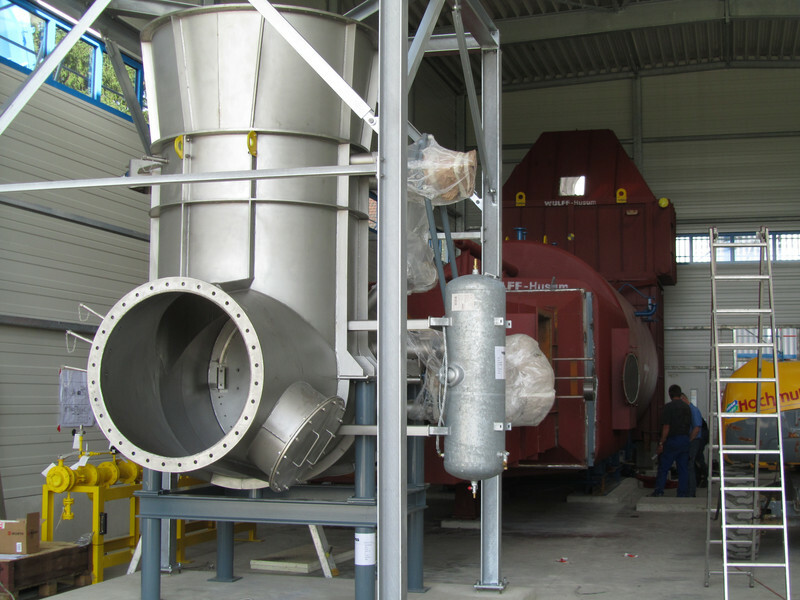 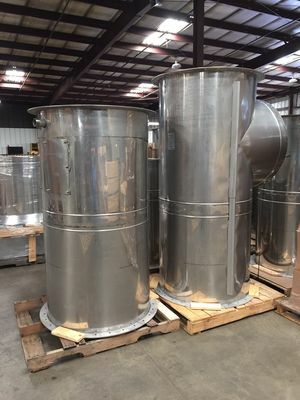 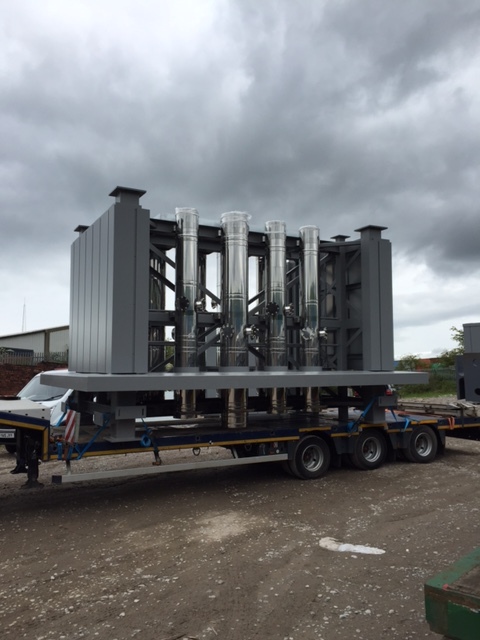 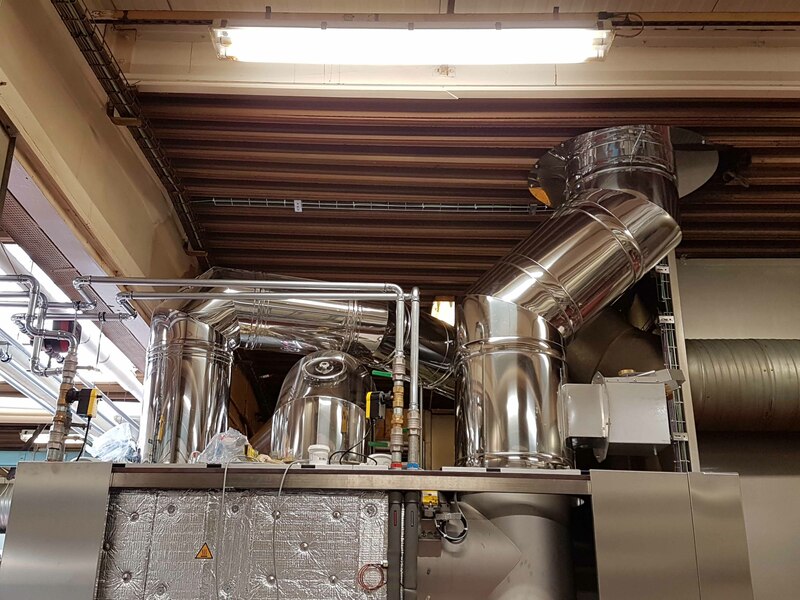 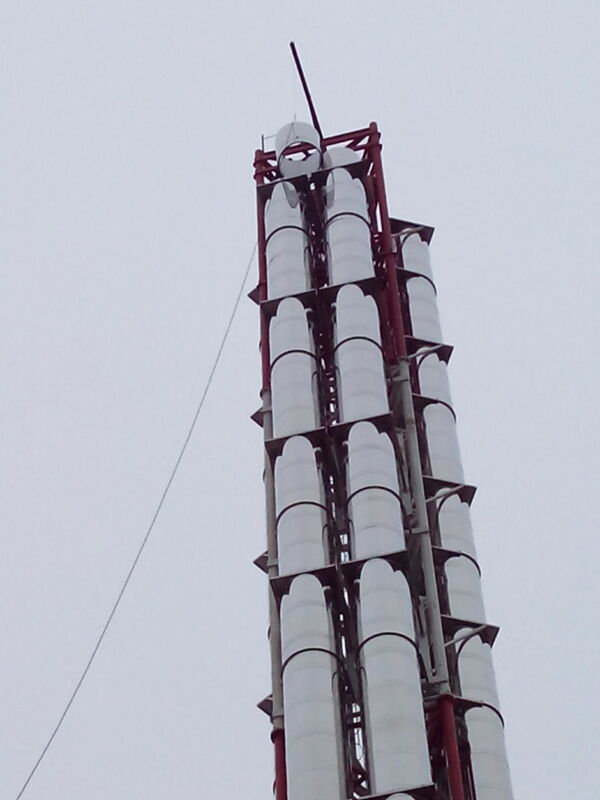 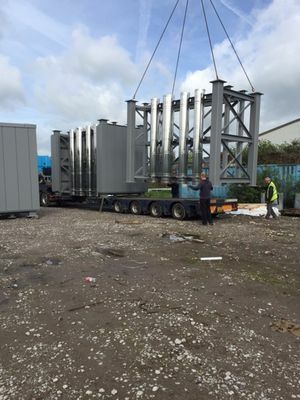 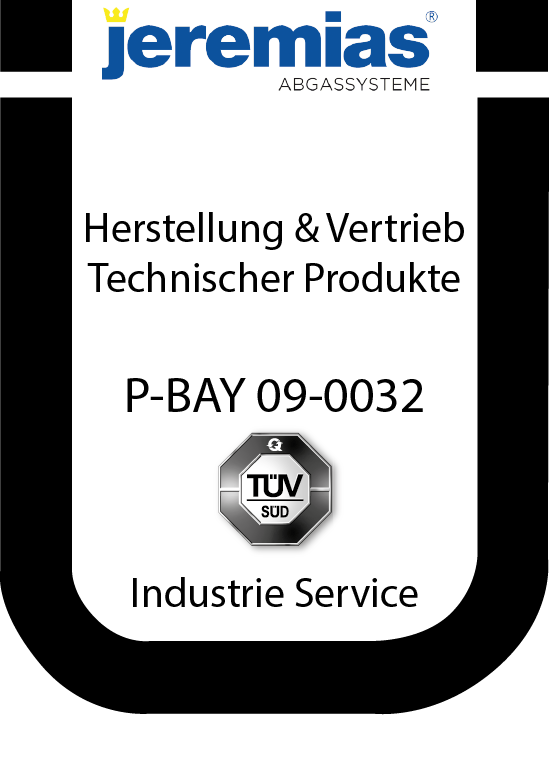 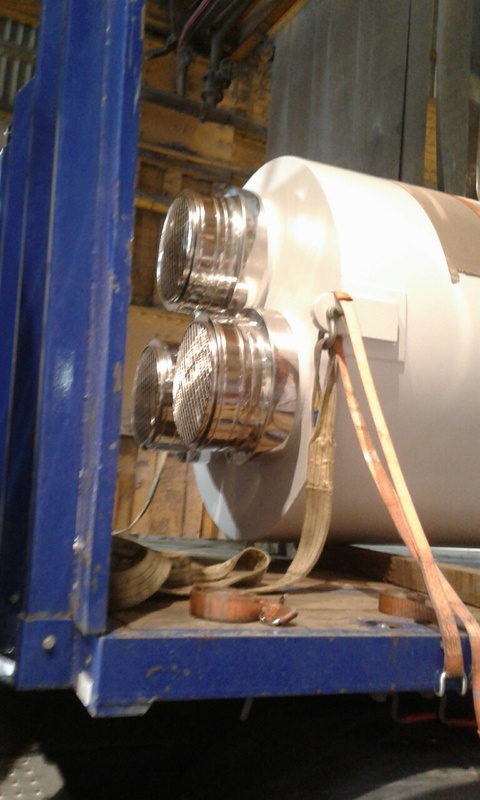 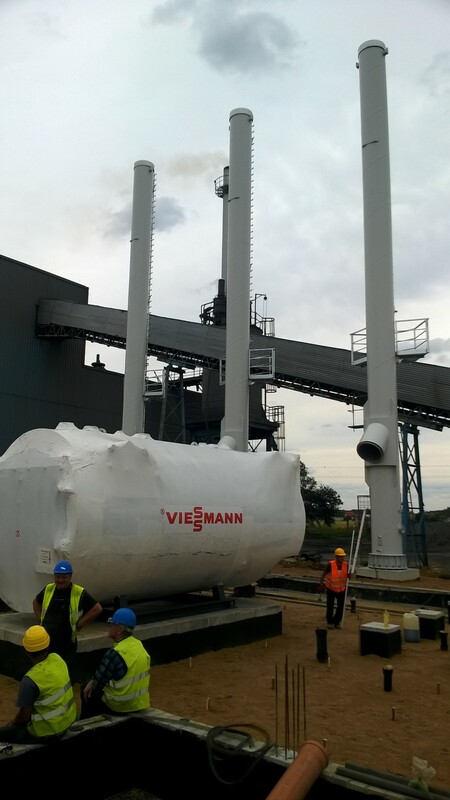 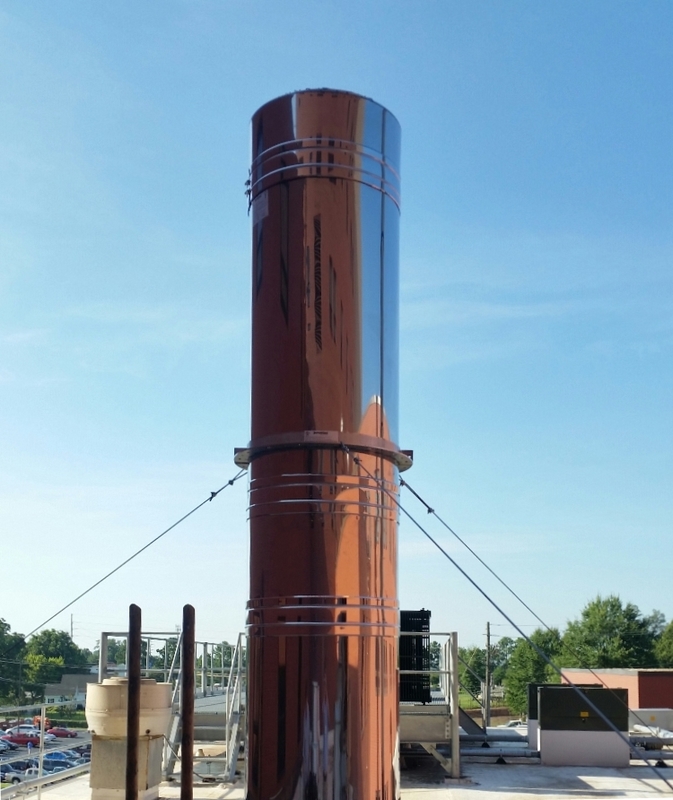 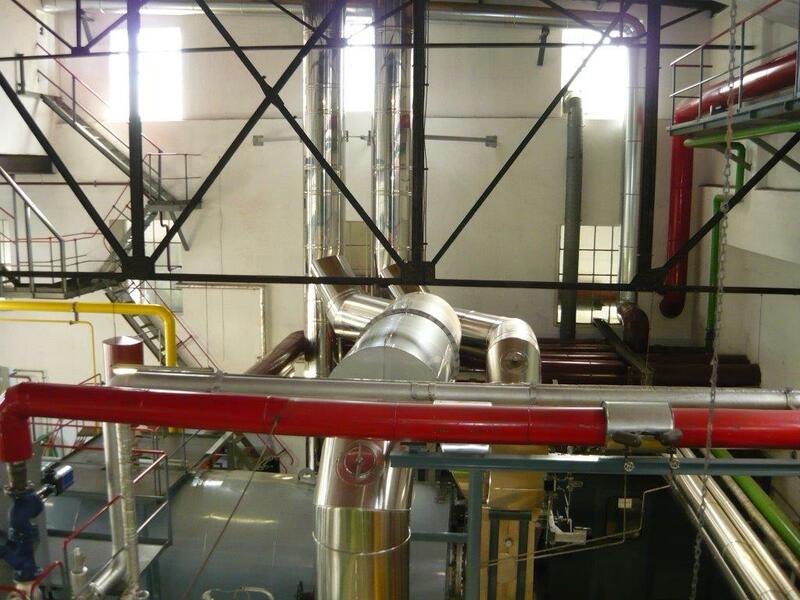 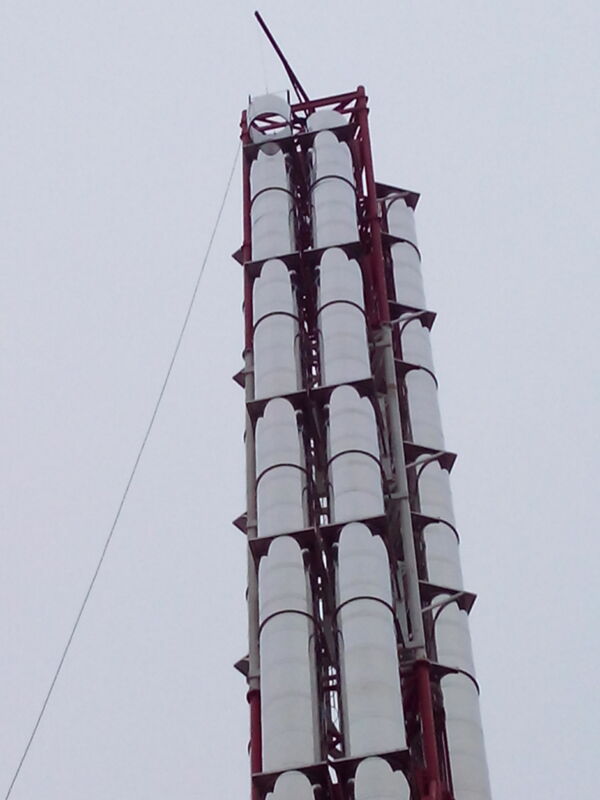 Chimneys for Taurus 60 with 5.5 MW electric power and downstream steam generators generates 24t steam / hr with 20bar. 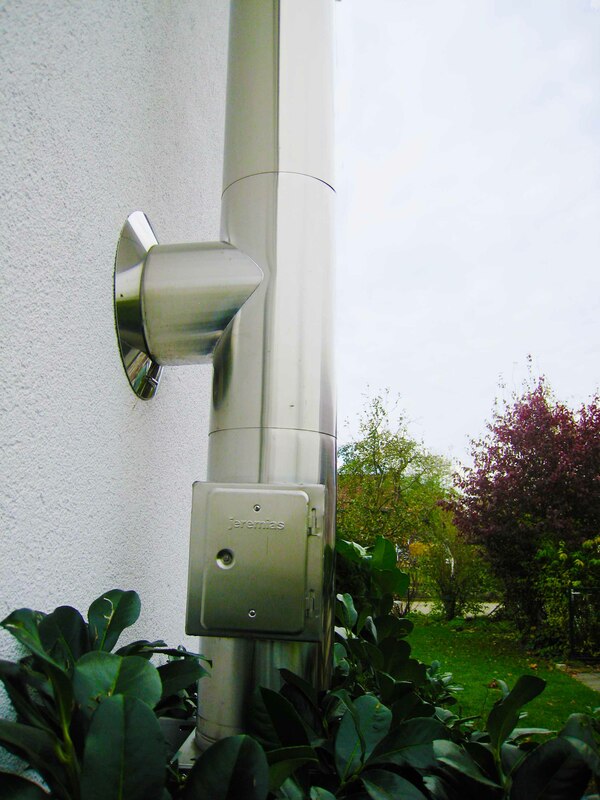 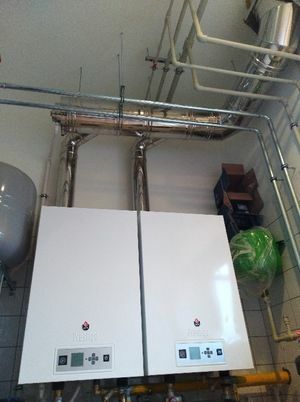 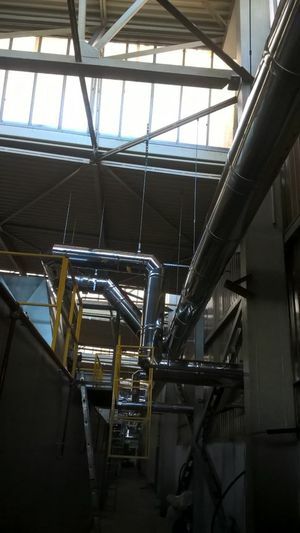 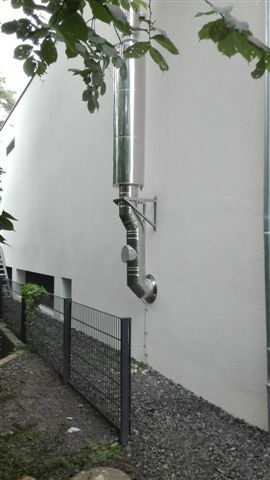 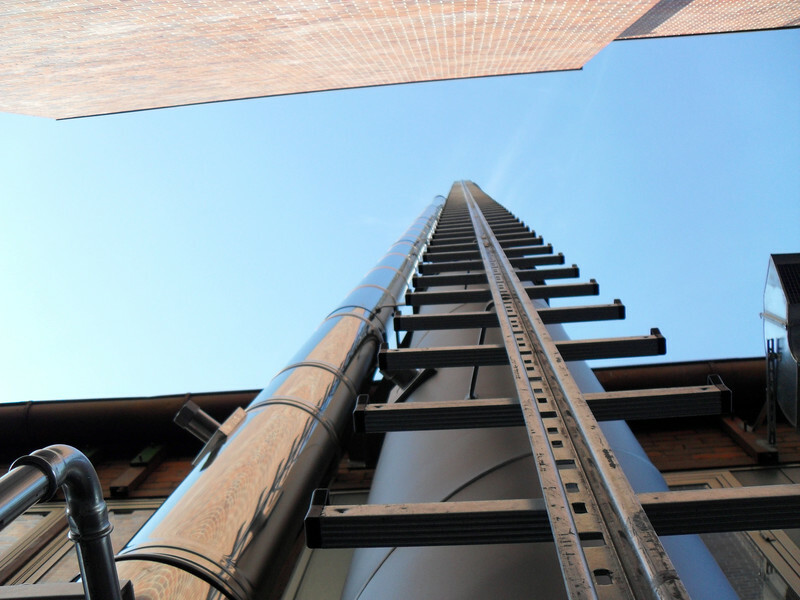 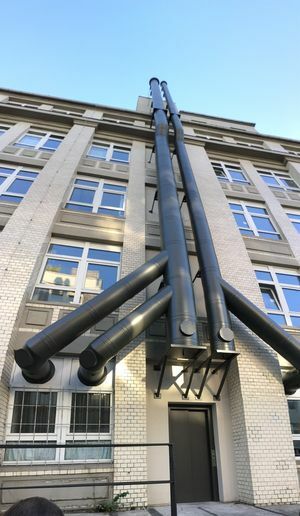 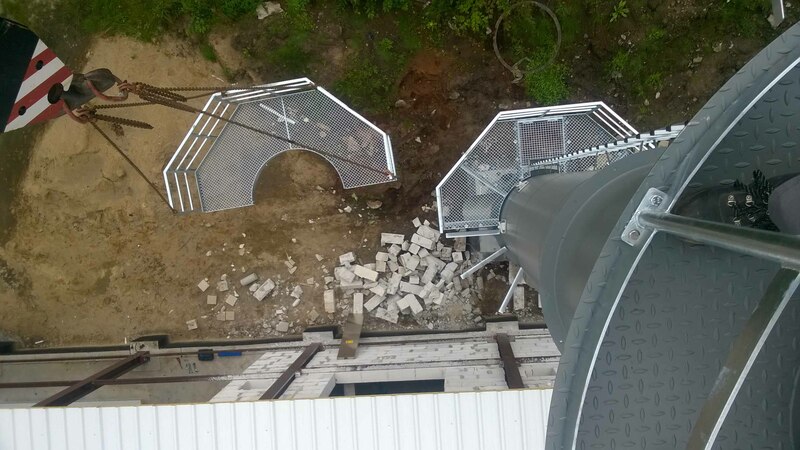 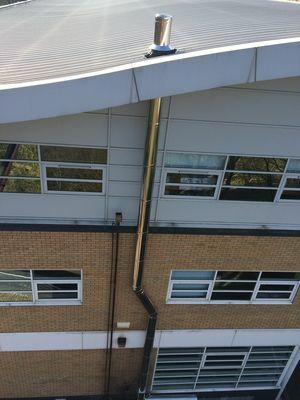 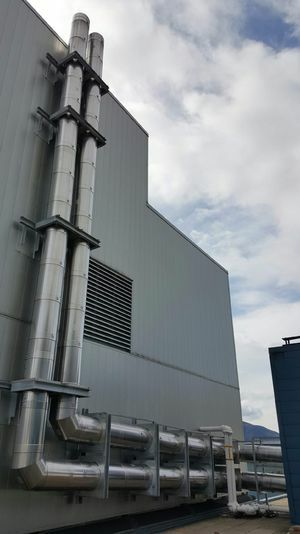 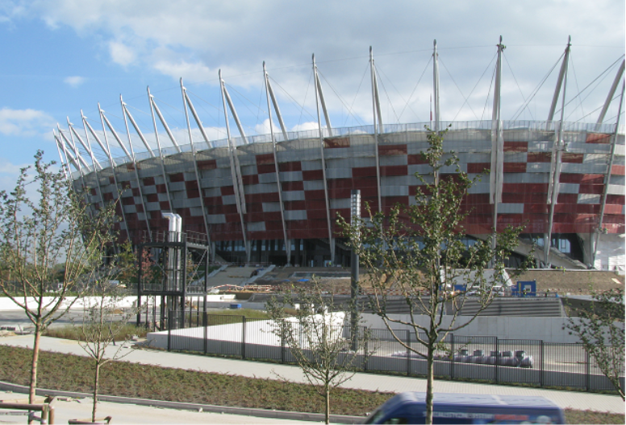 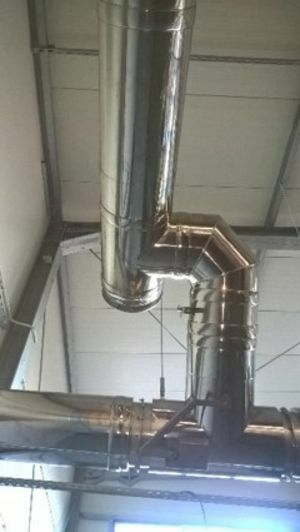 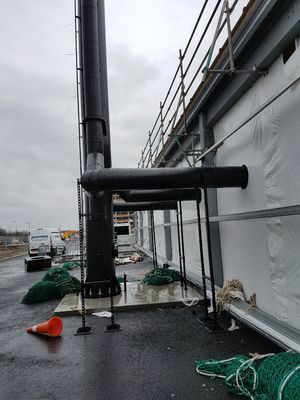 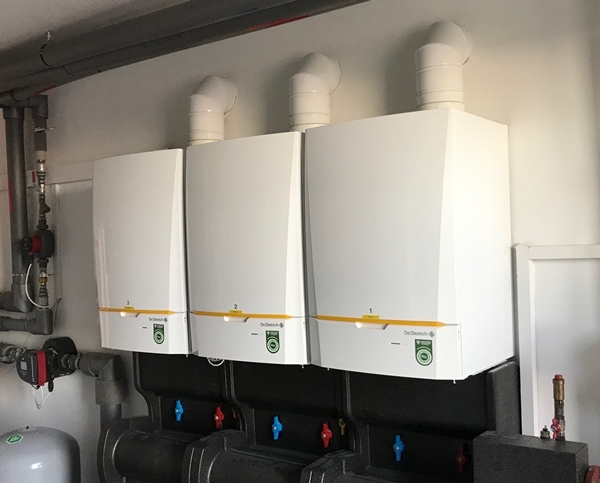 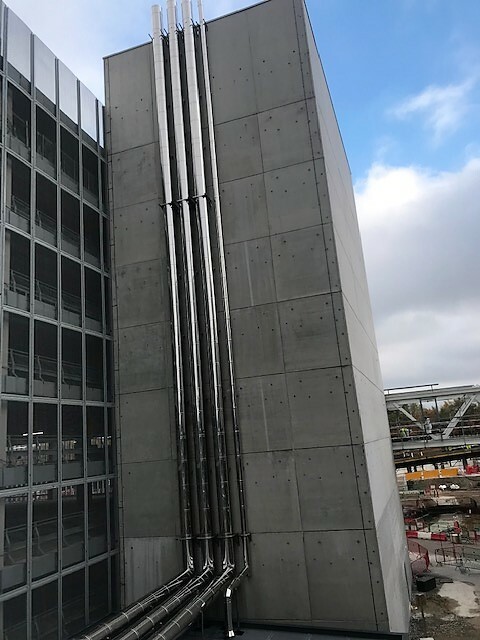 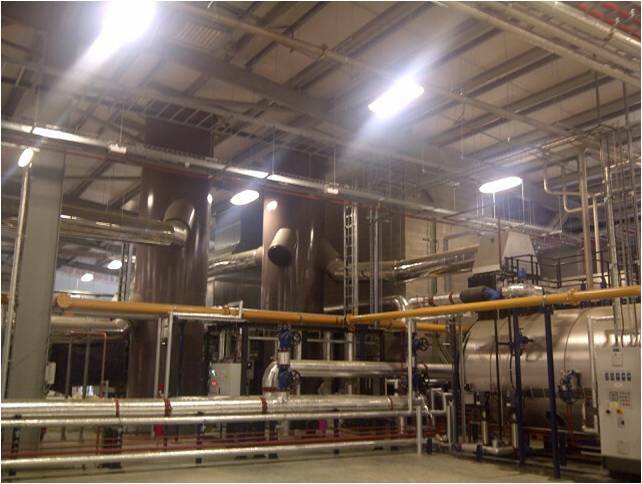 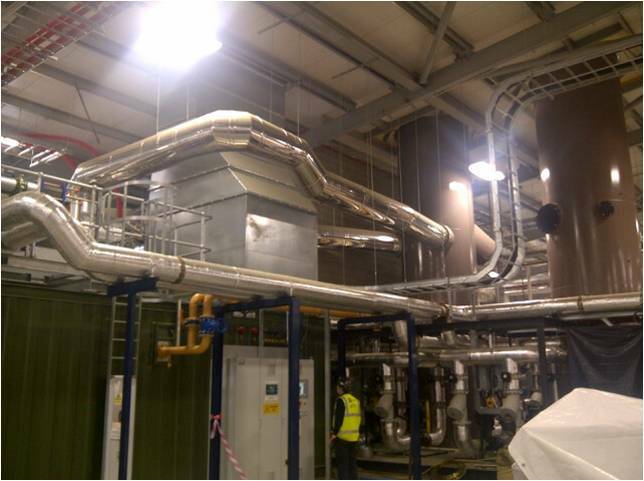 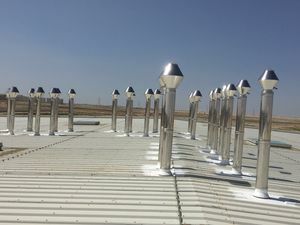 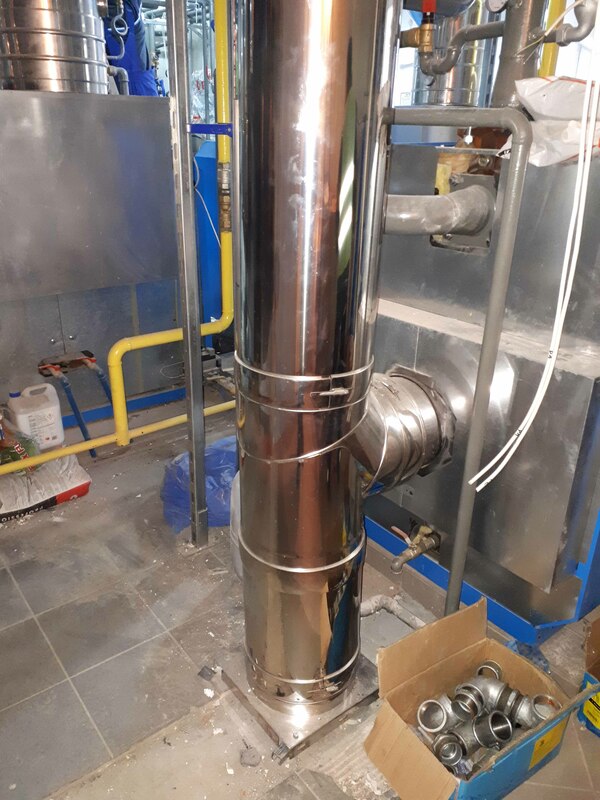 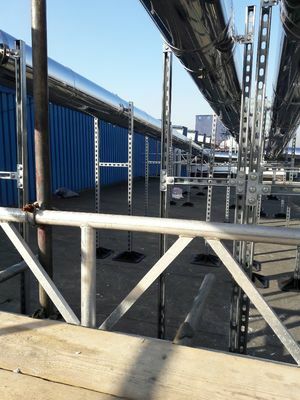 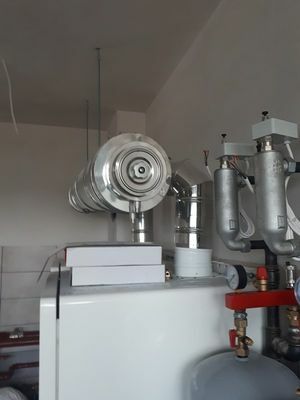 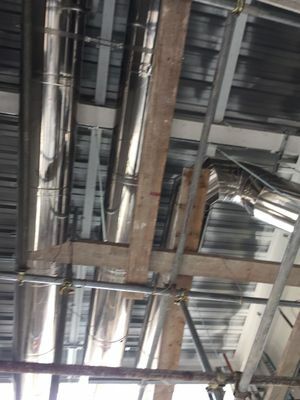 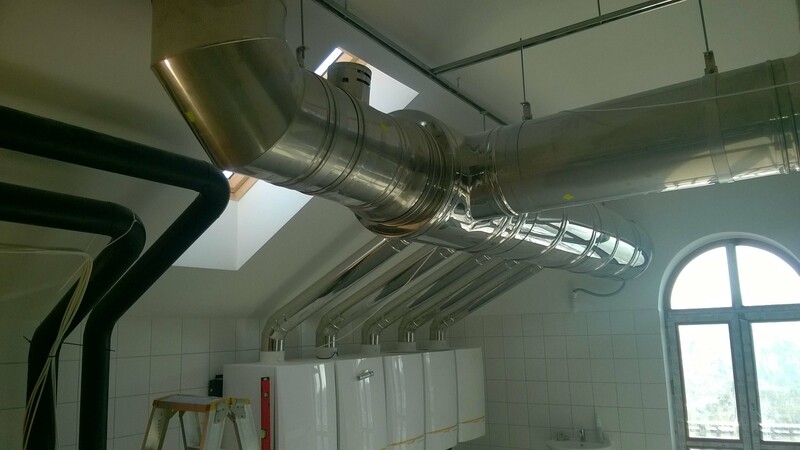 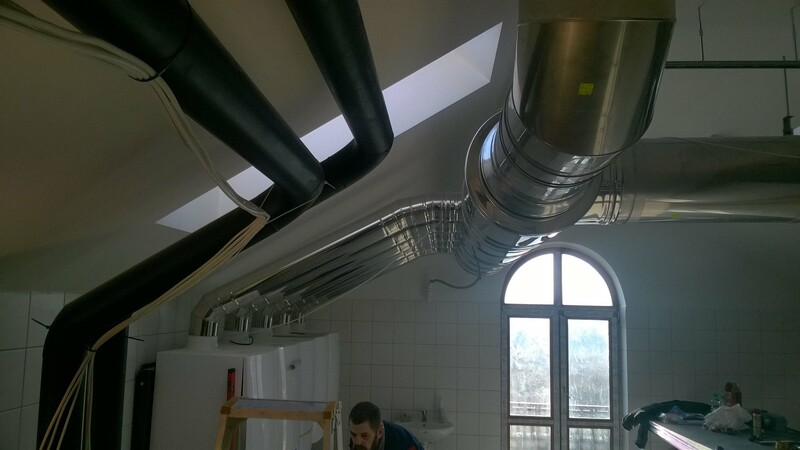 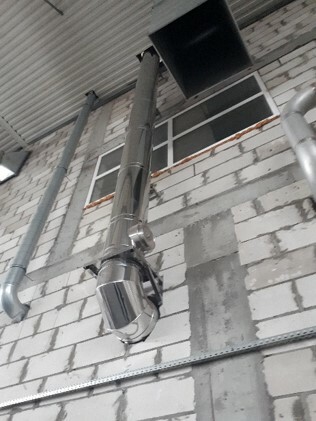 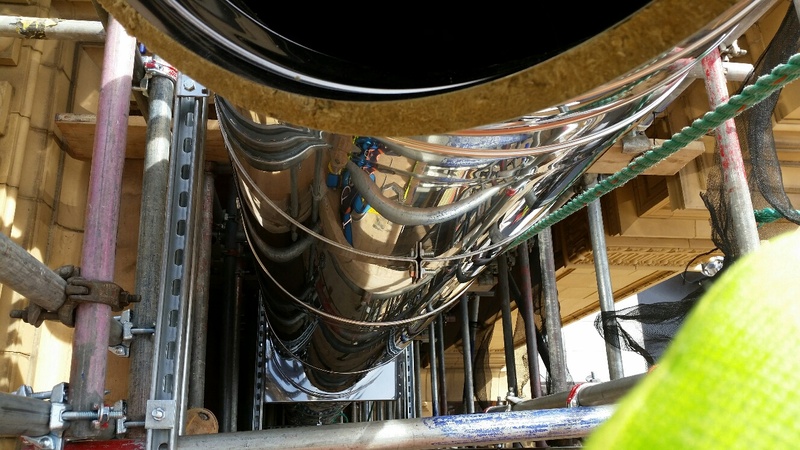 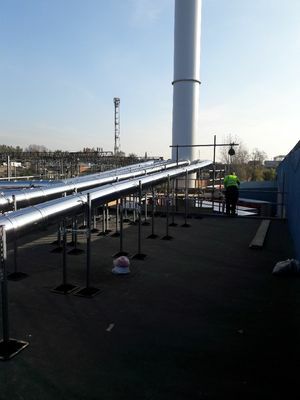 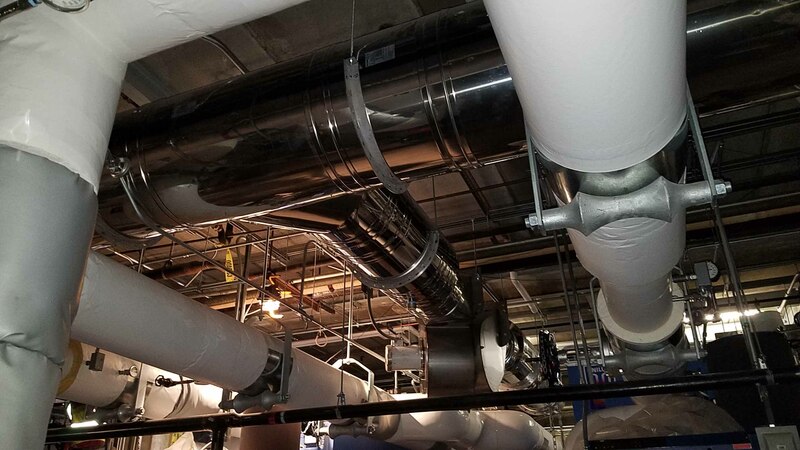 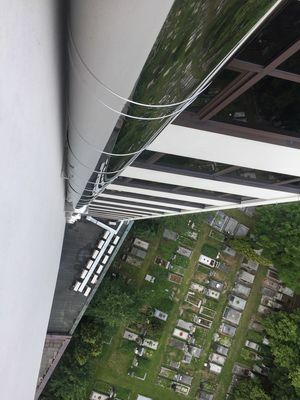 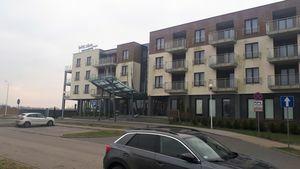 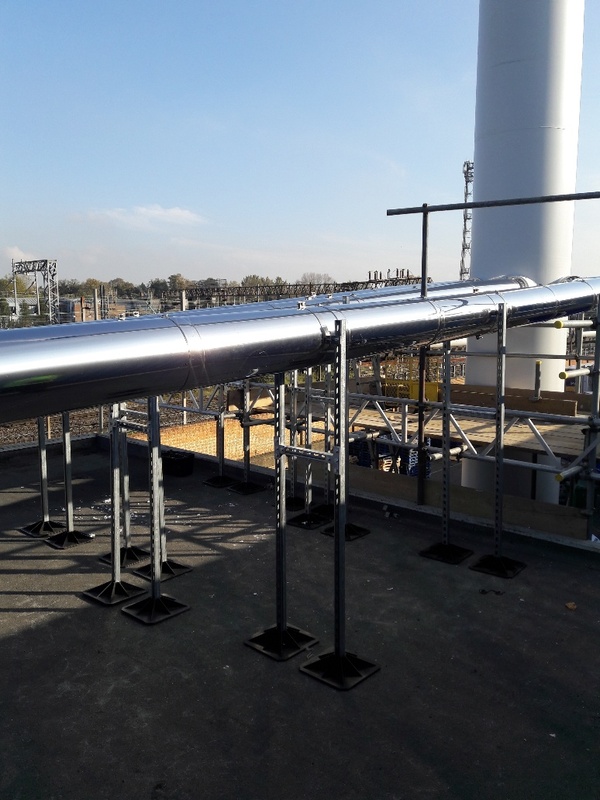 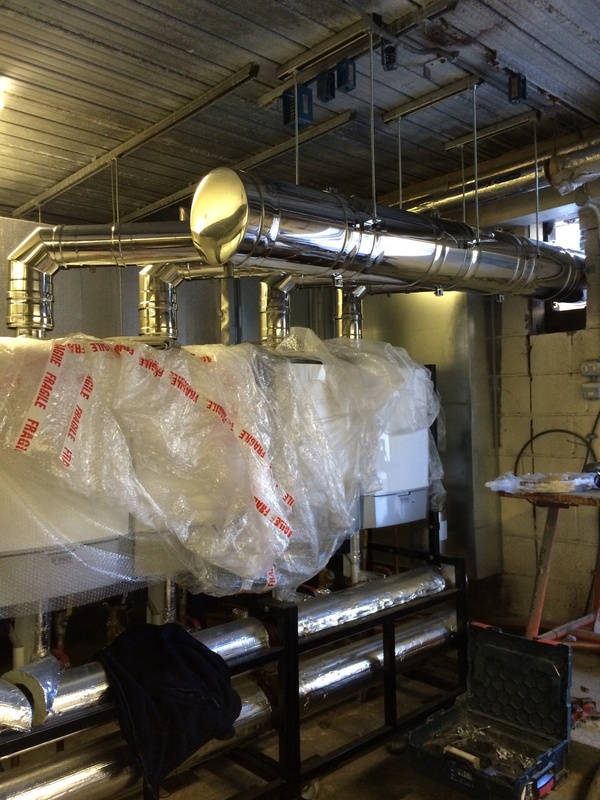 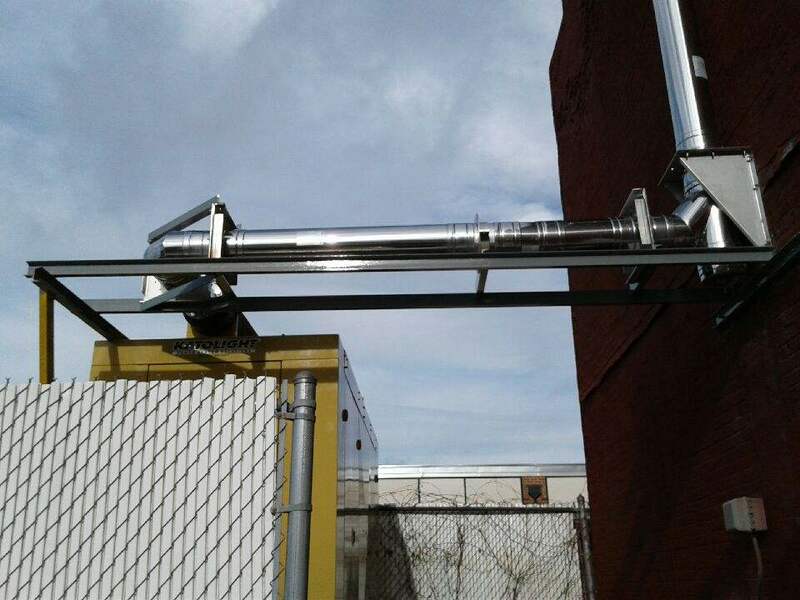 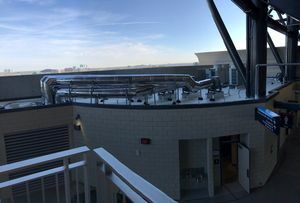 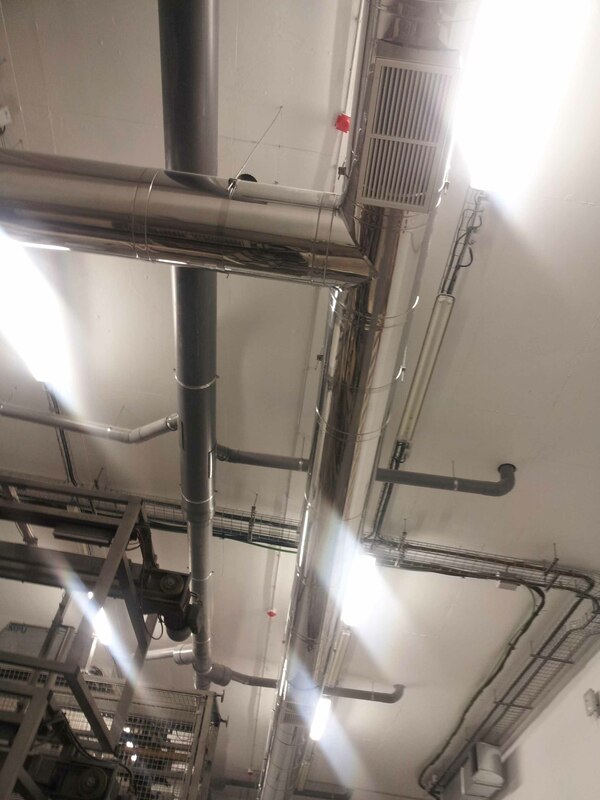 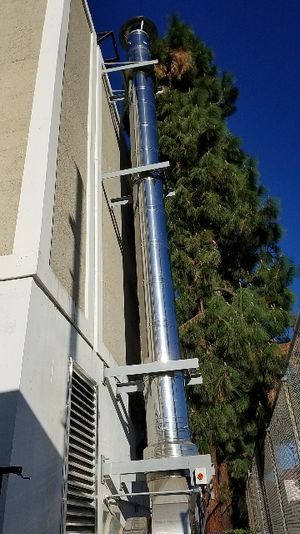 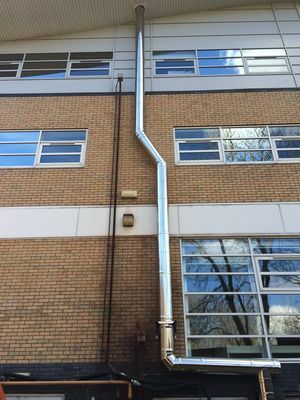 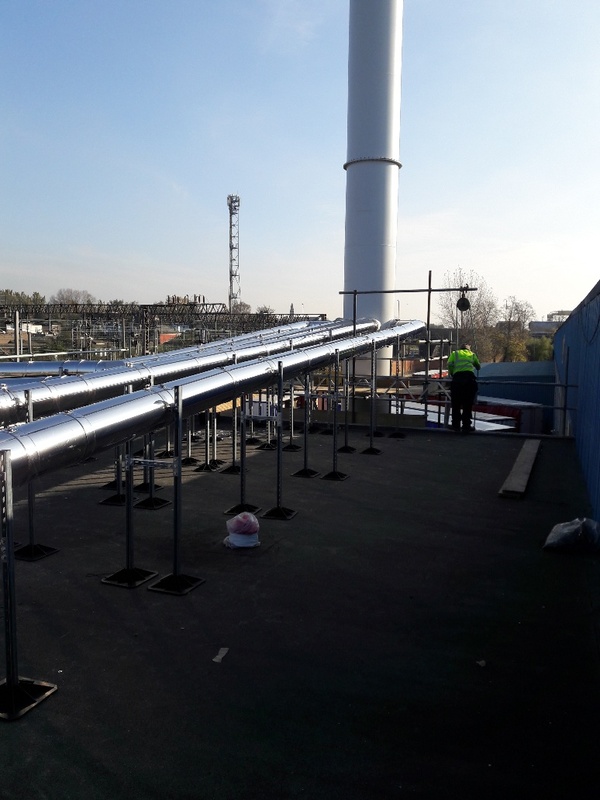 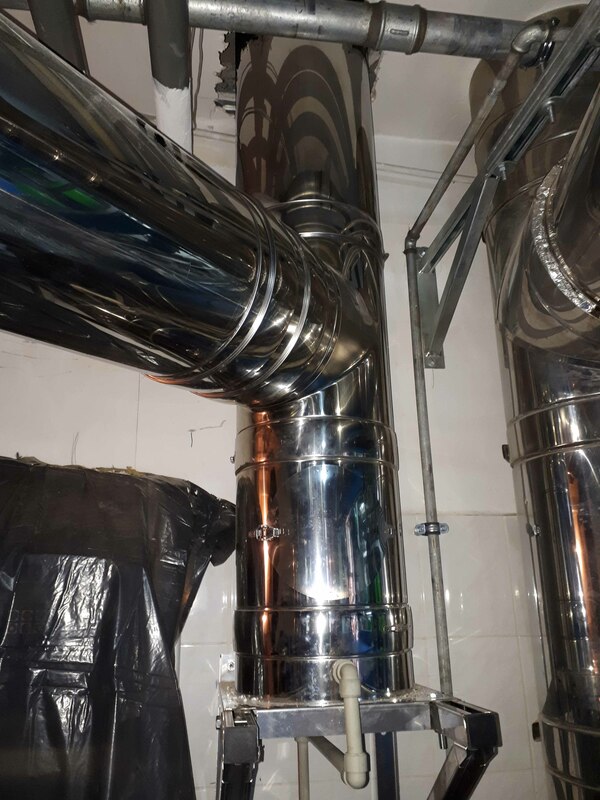 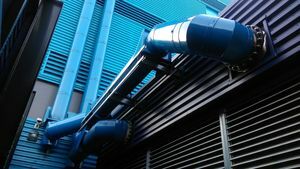 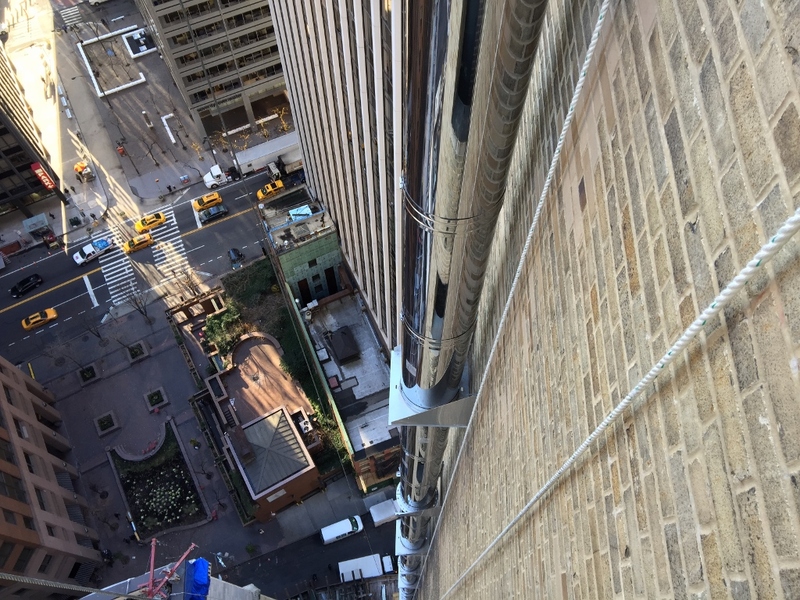 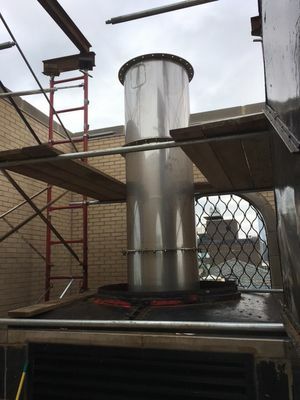 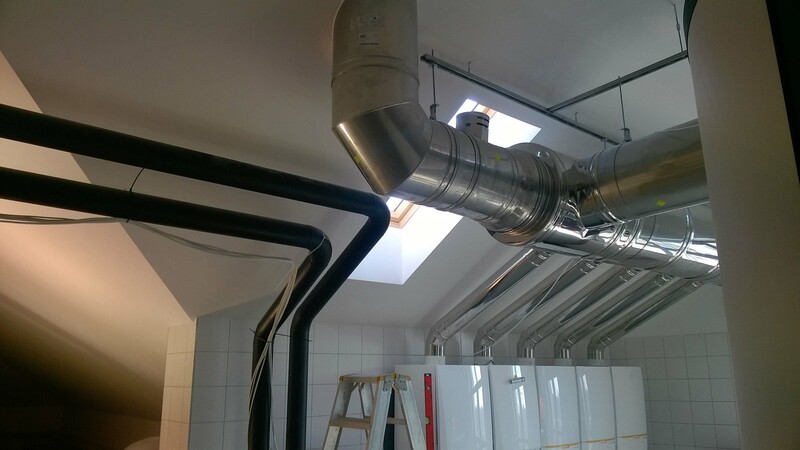 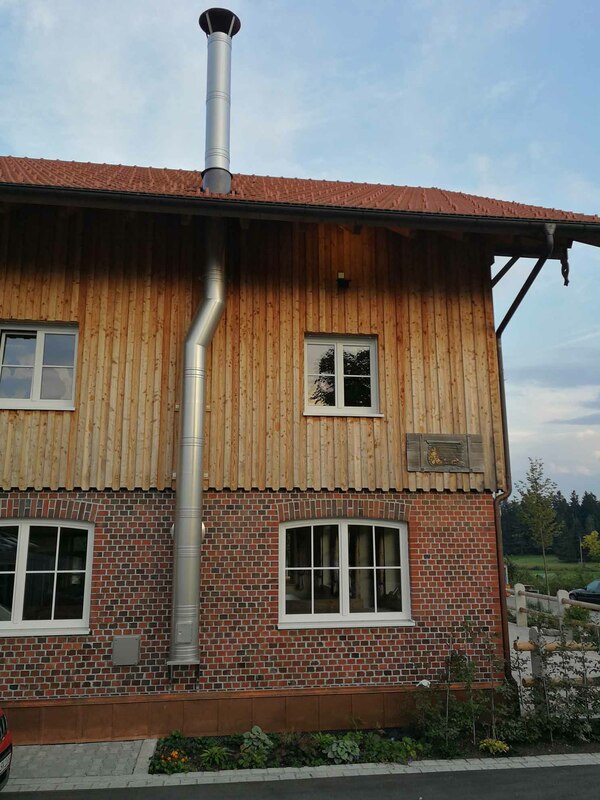 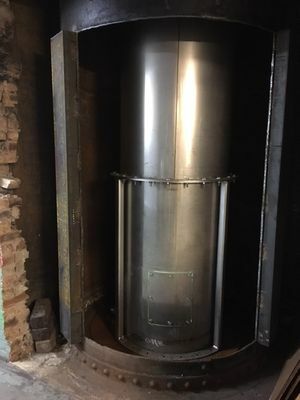 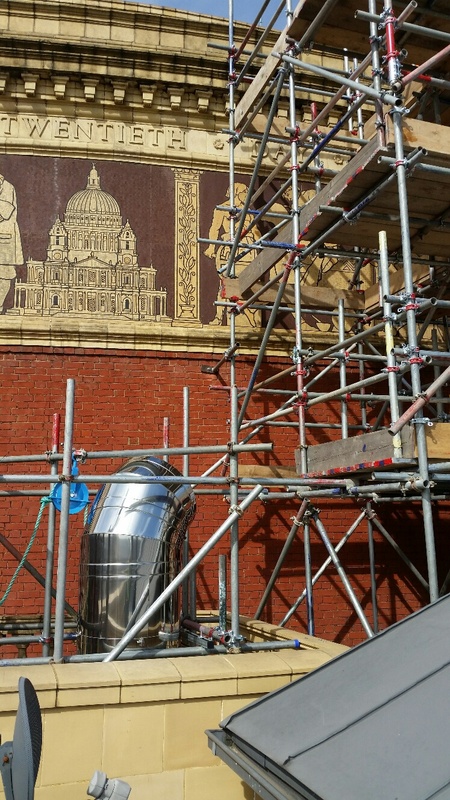 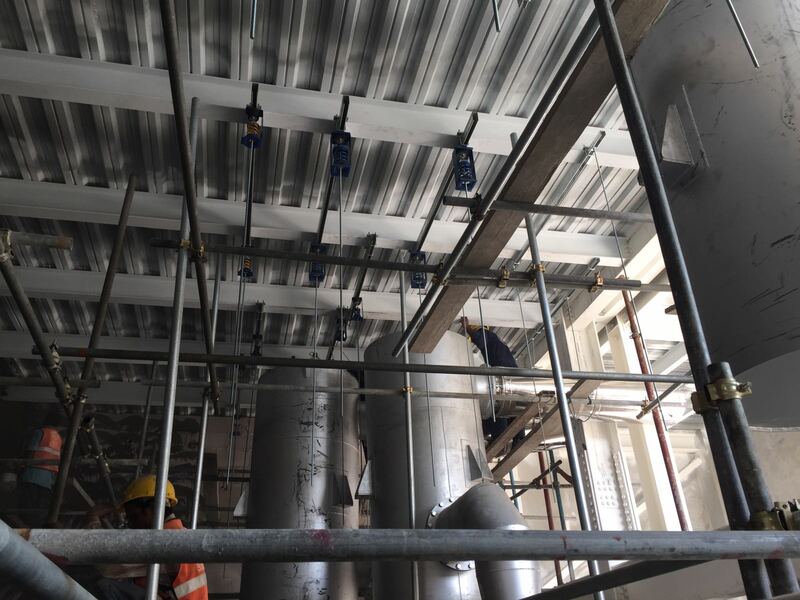 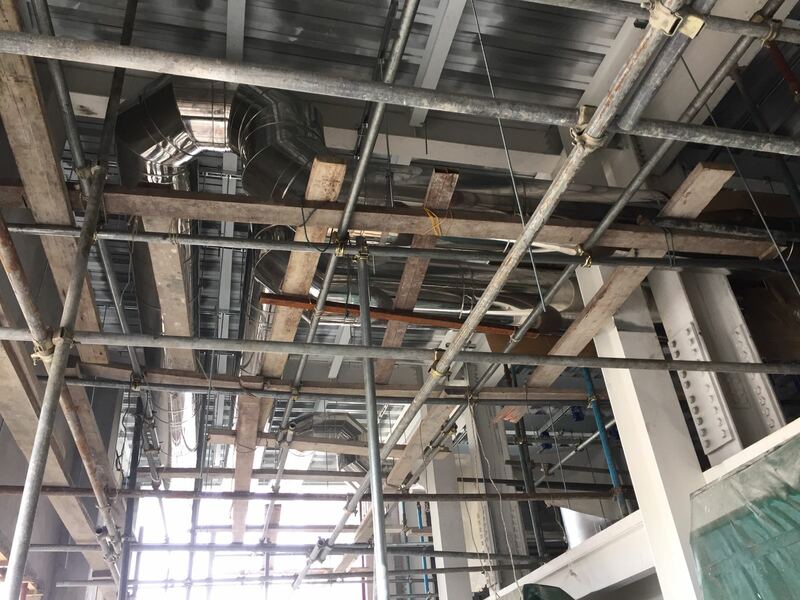 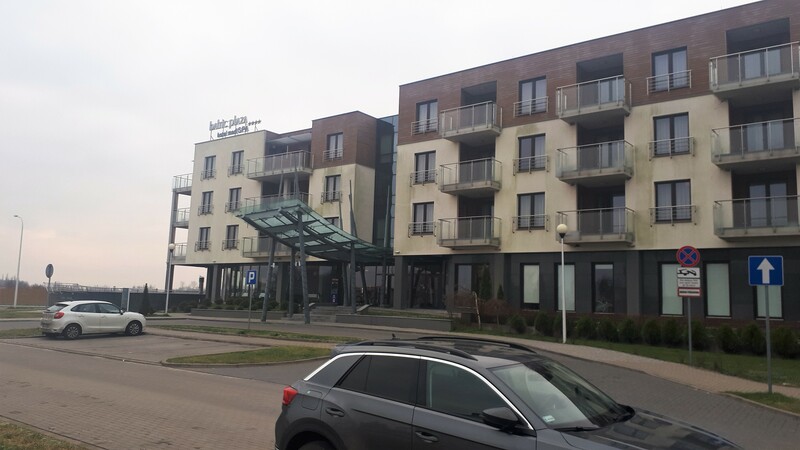 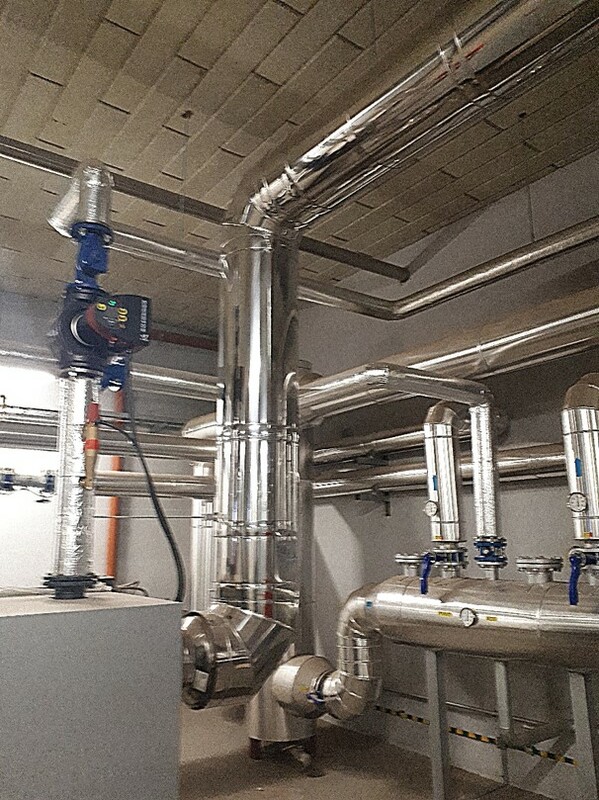 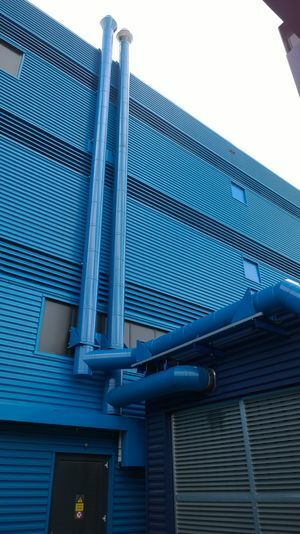 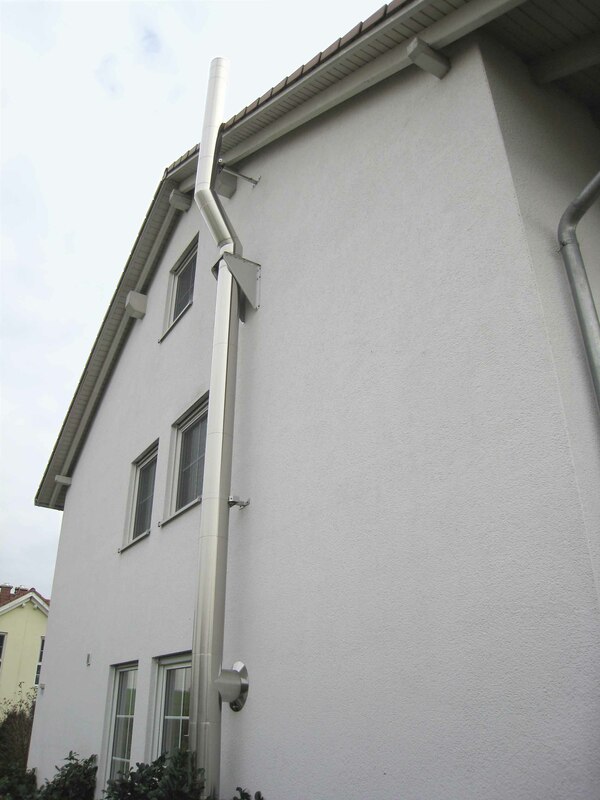 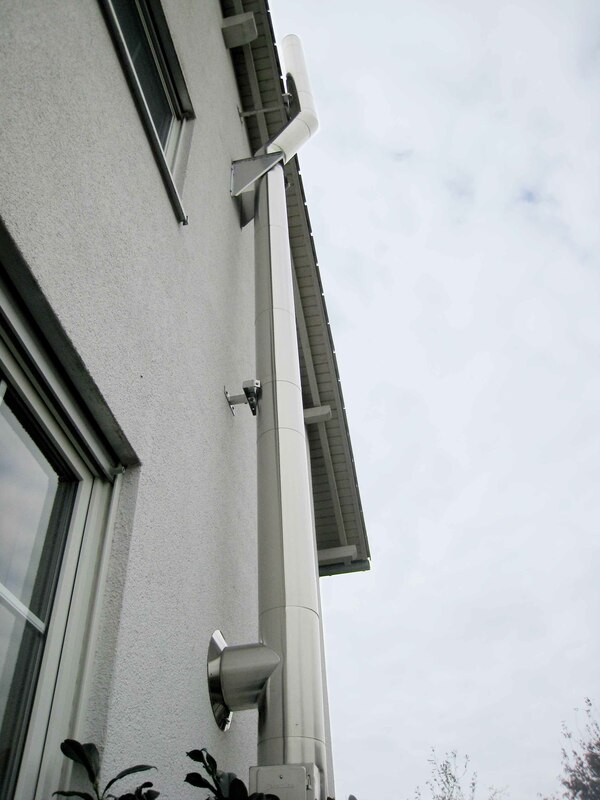 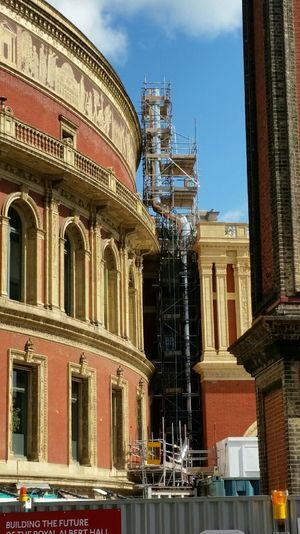 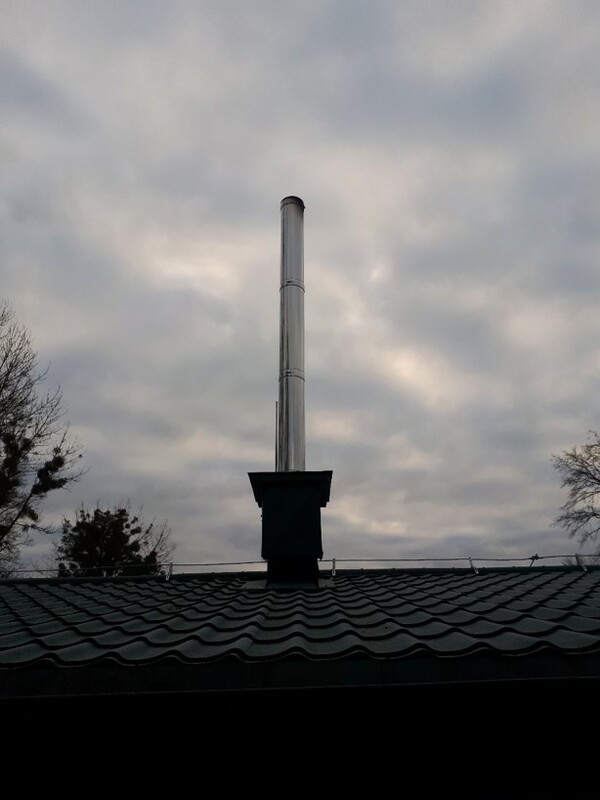 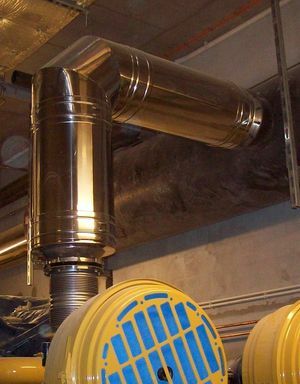 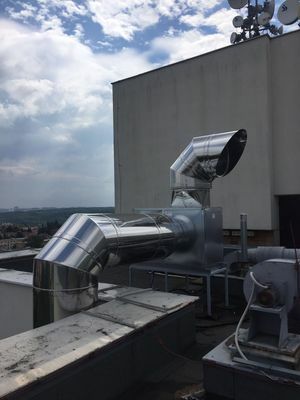 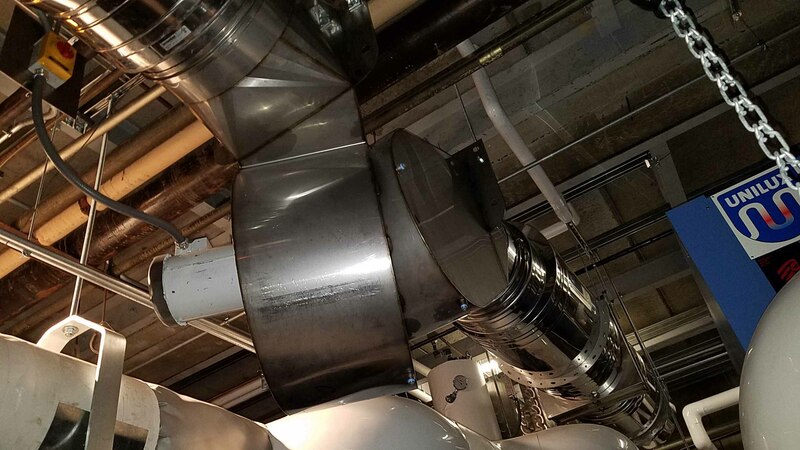 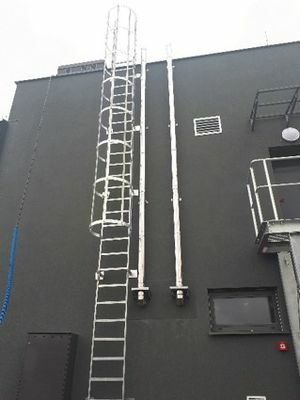 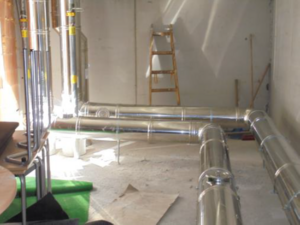 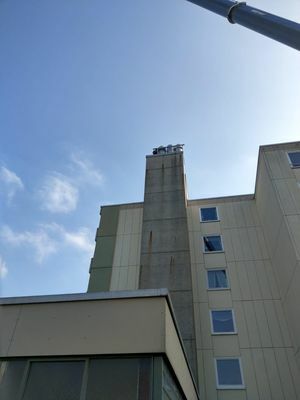 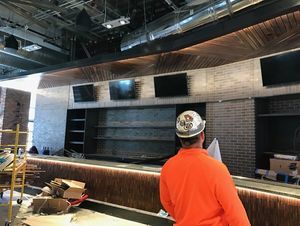 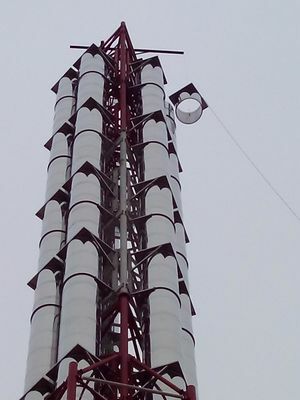 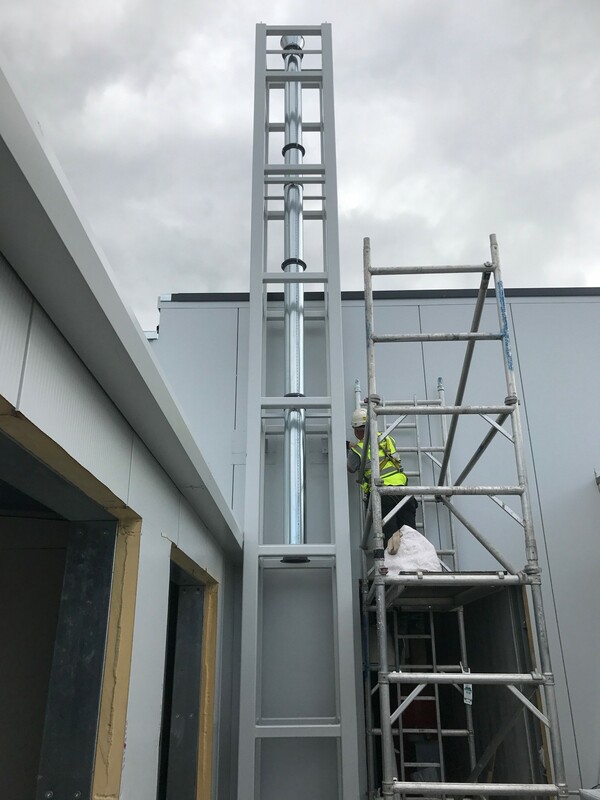 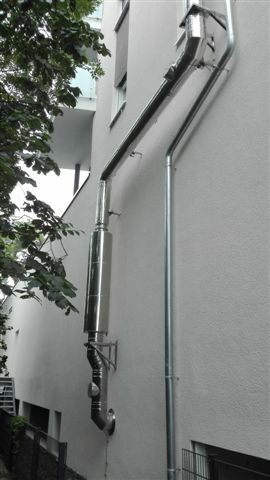 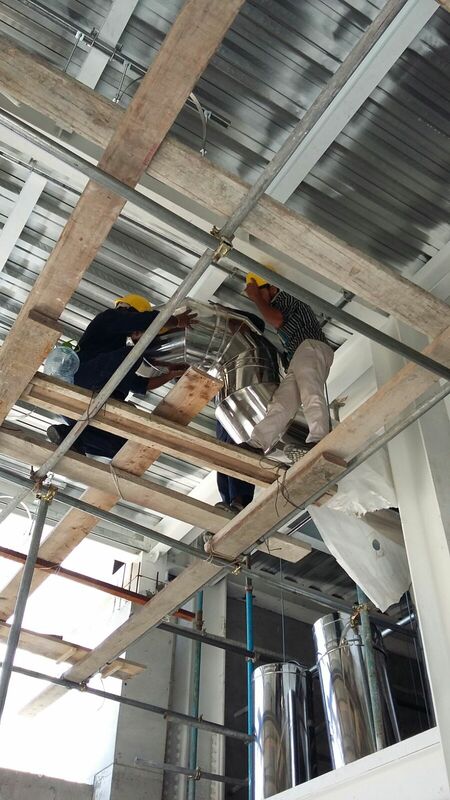 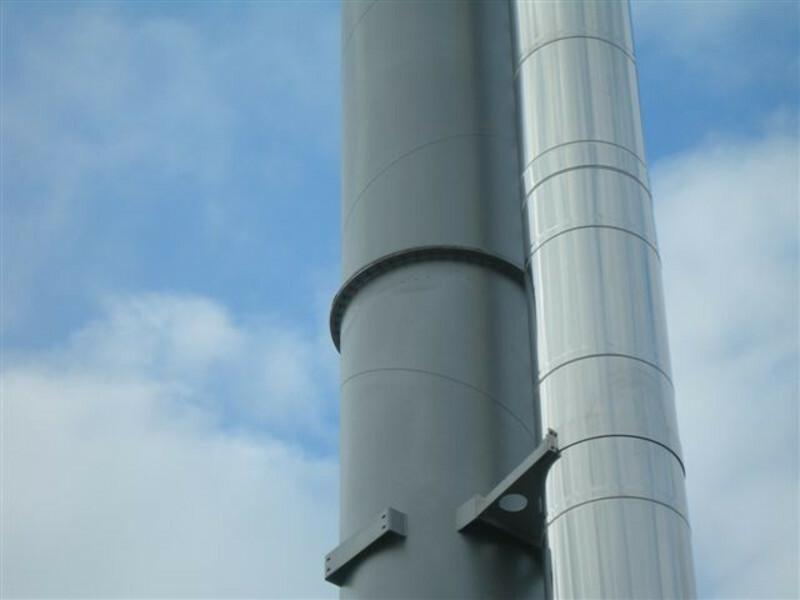 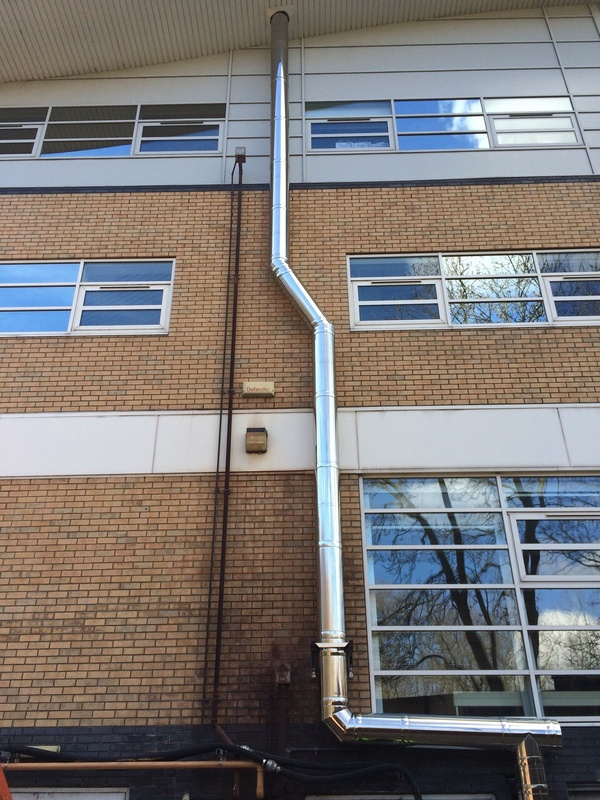 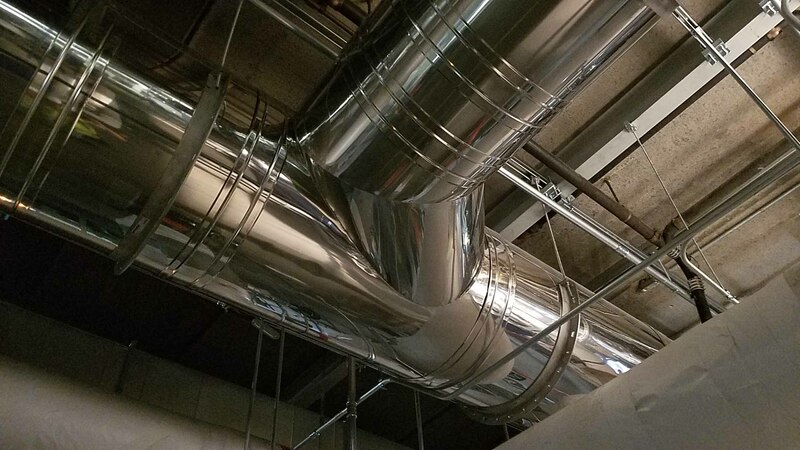 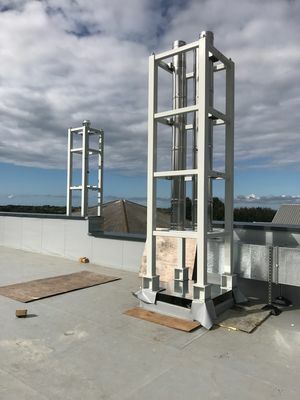 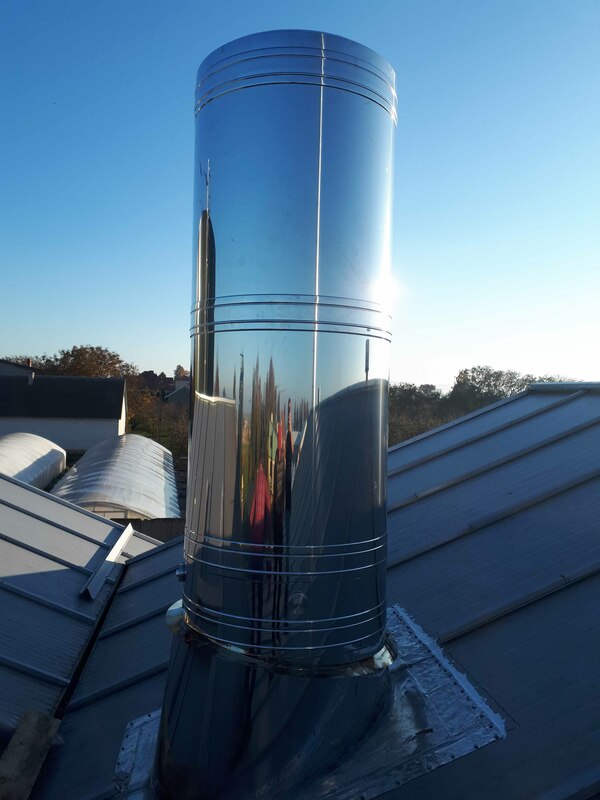 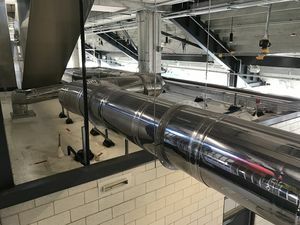 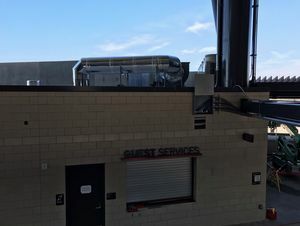 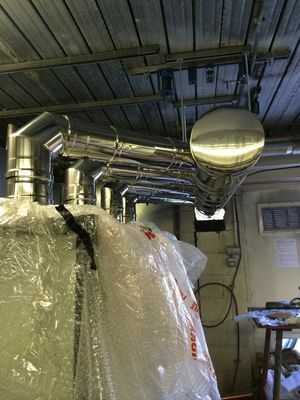 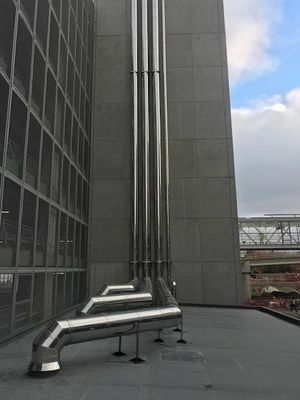 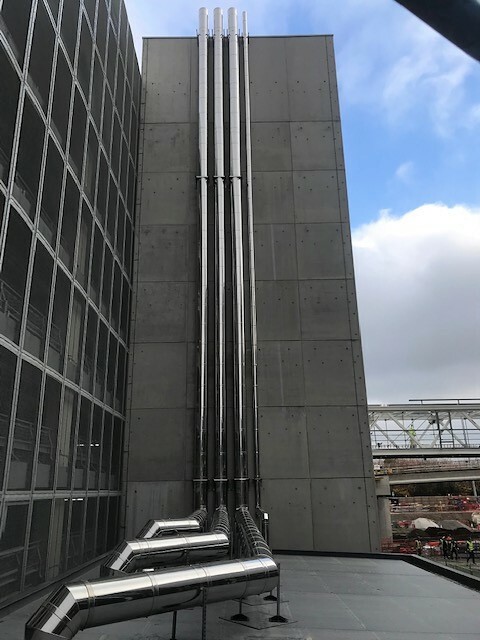 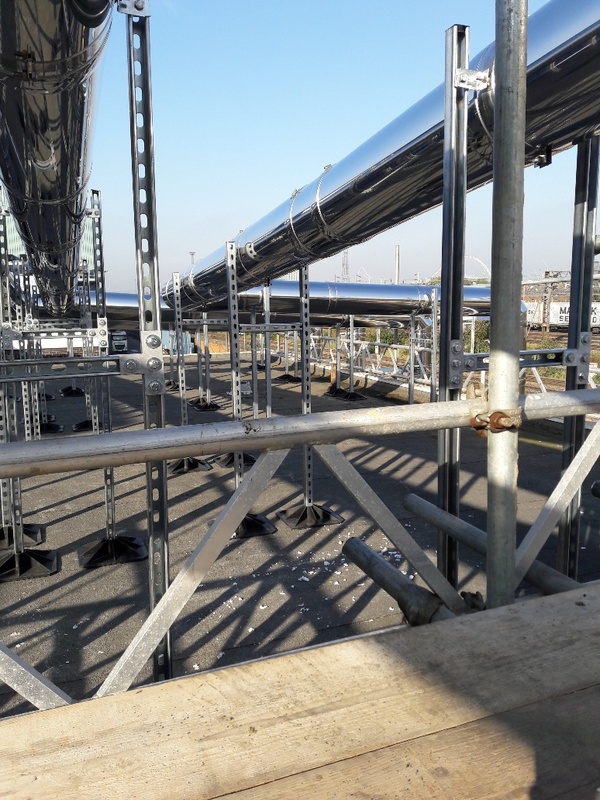 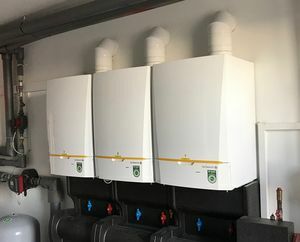 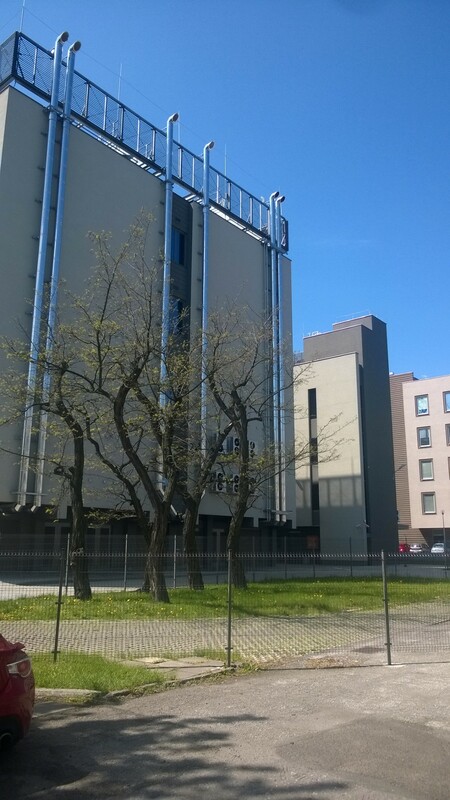 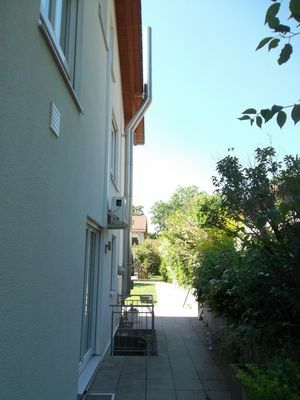 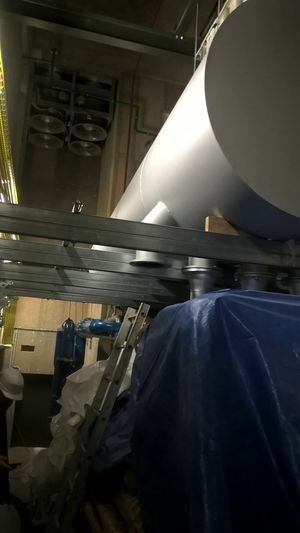 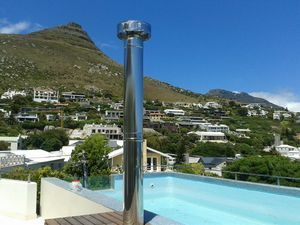 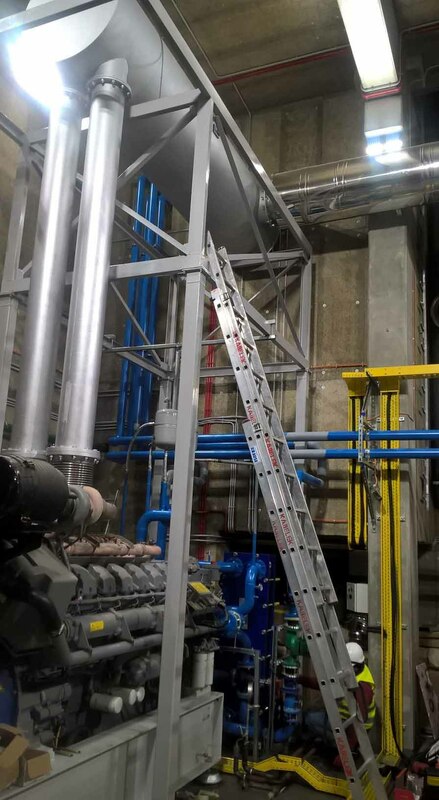 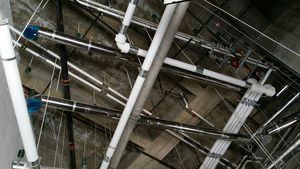 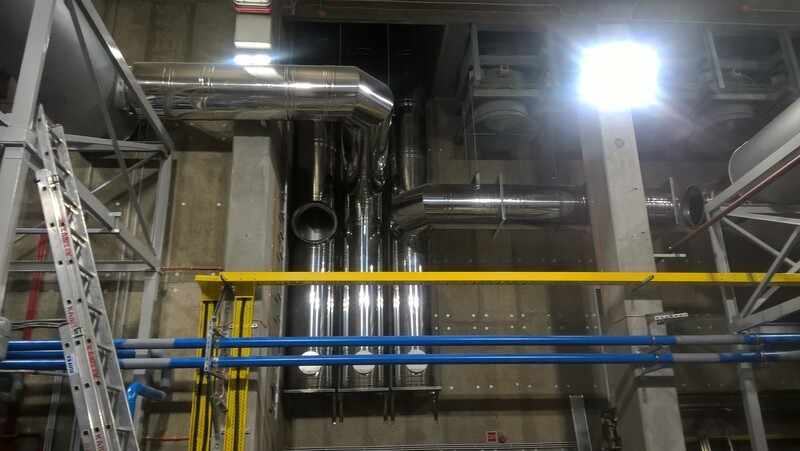 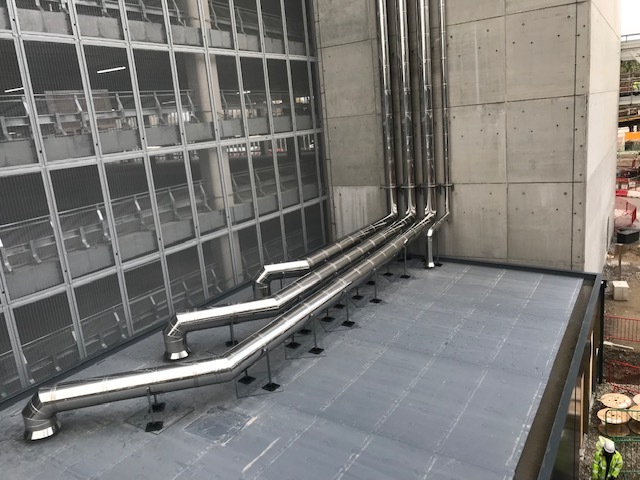 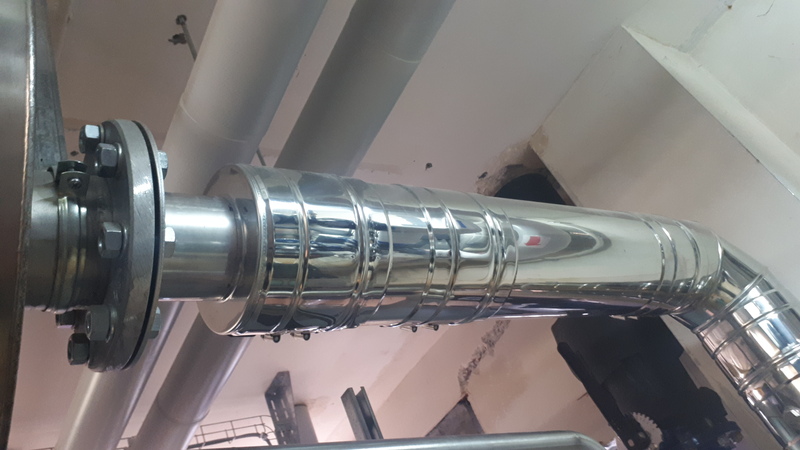 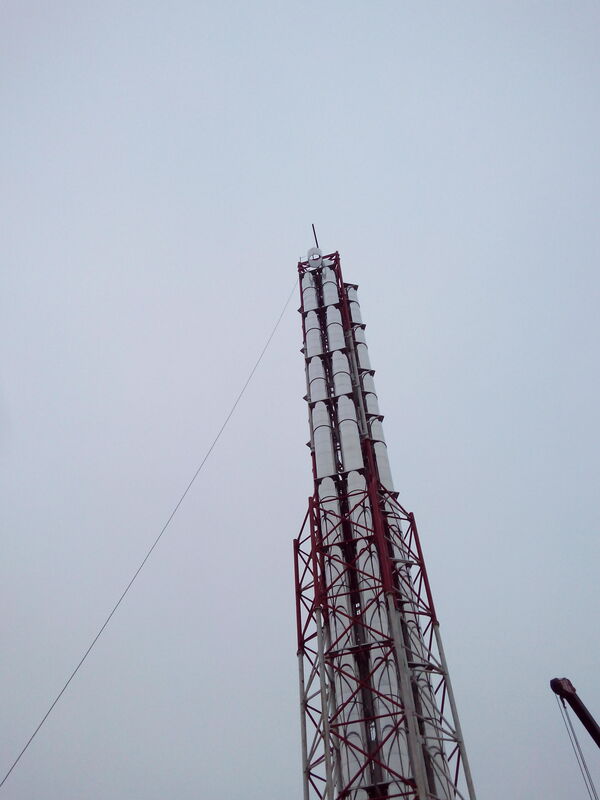 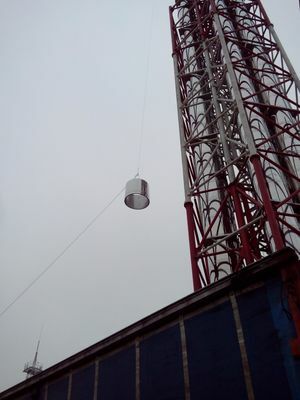 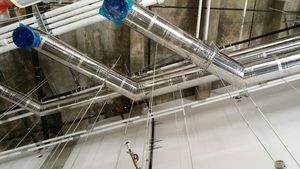 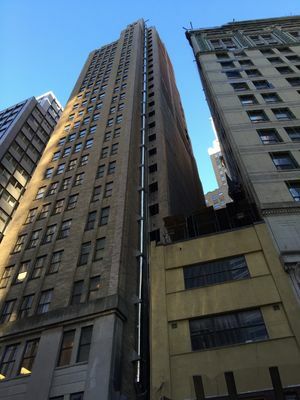 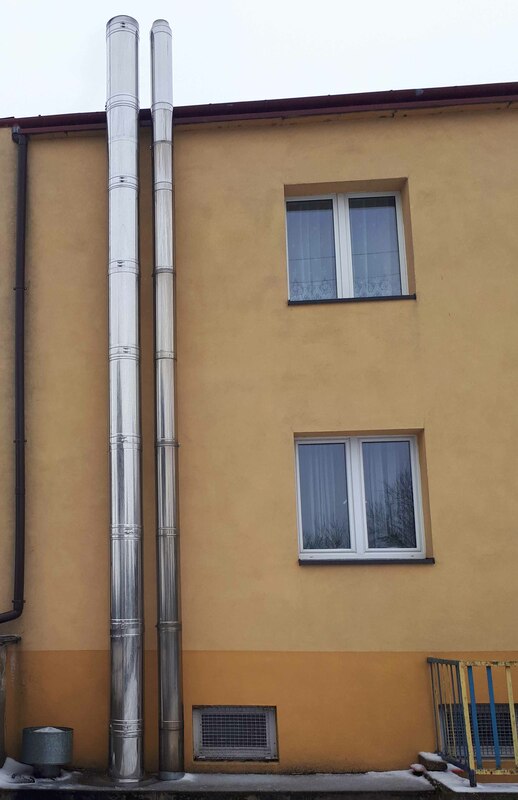 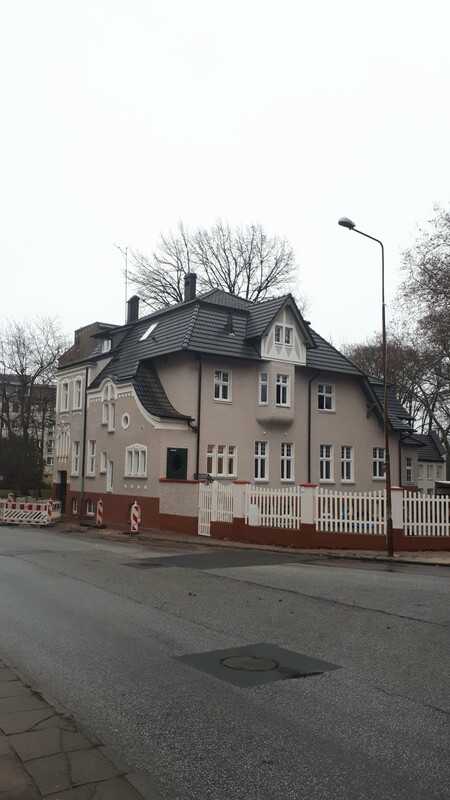 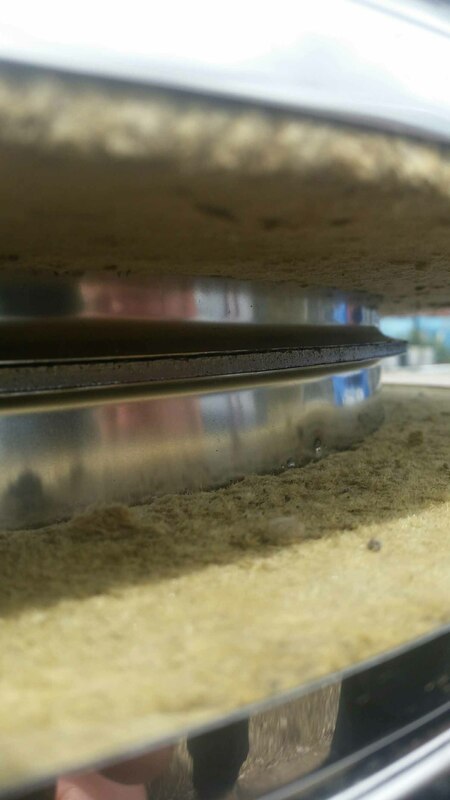 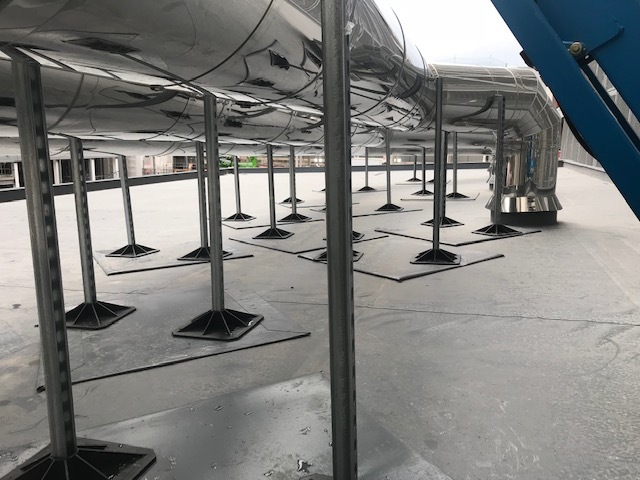 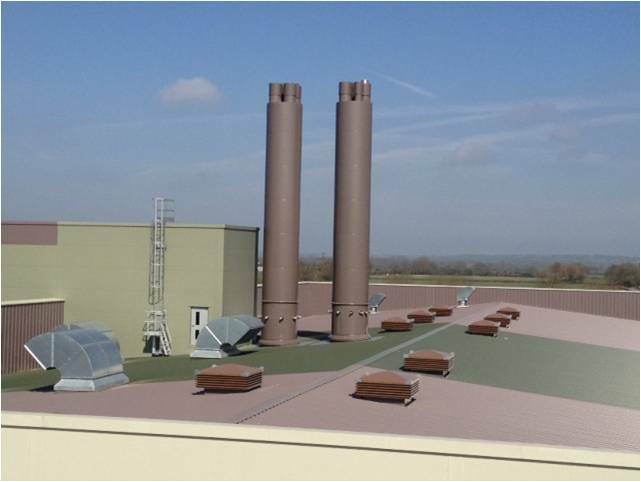 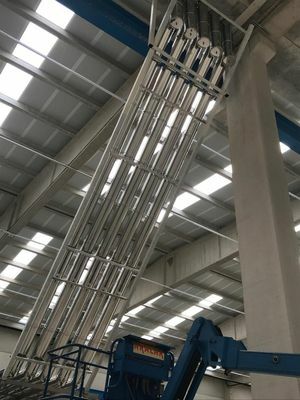 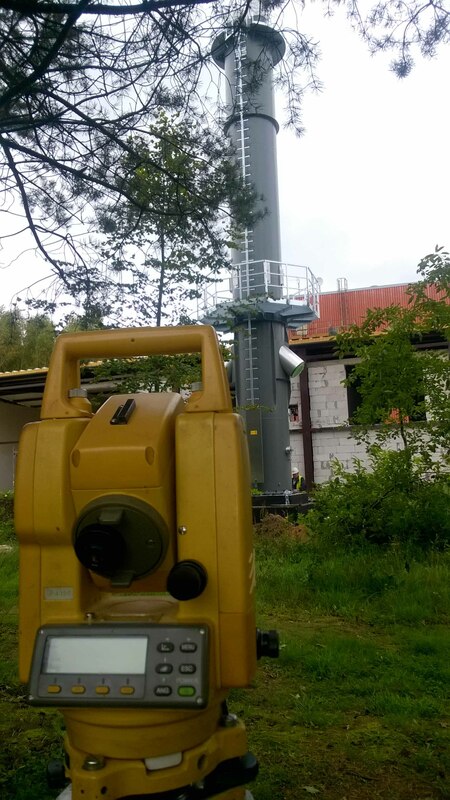 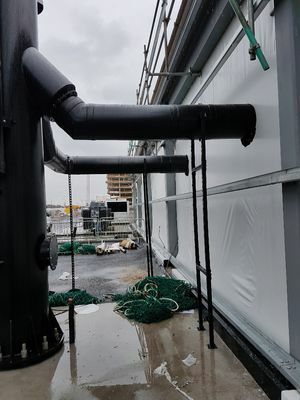 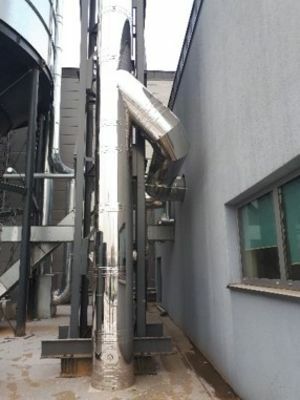 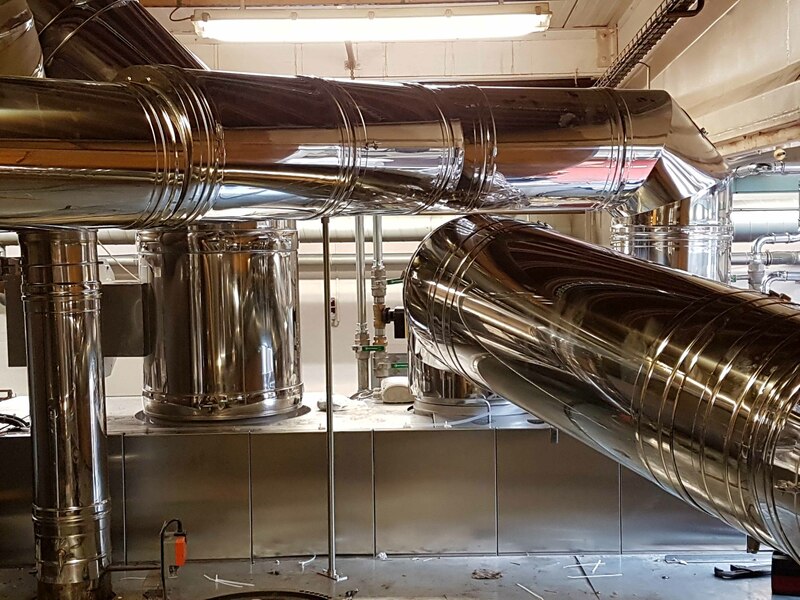 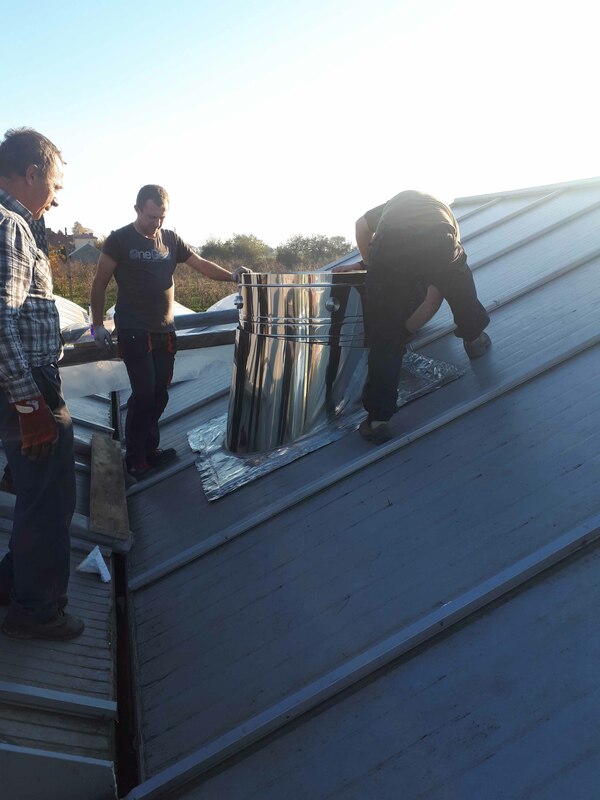 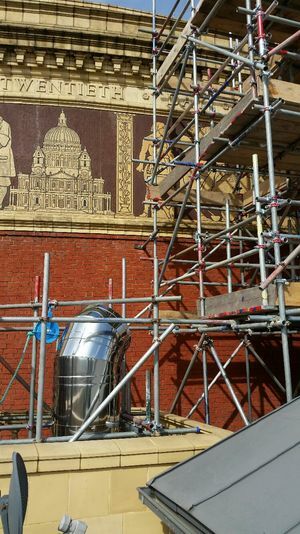 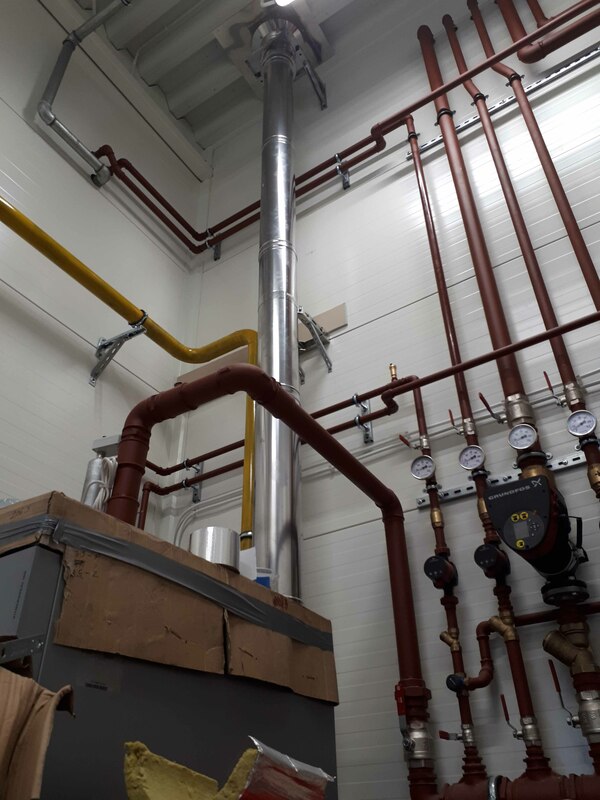 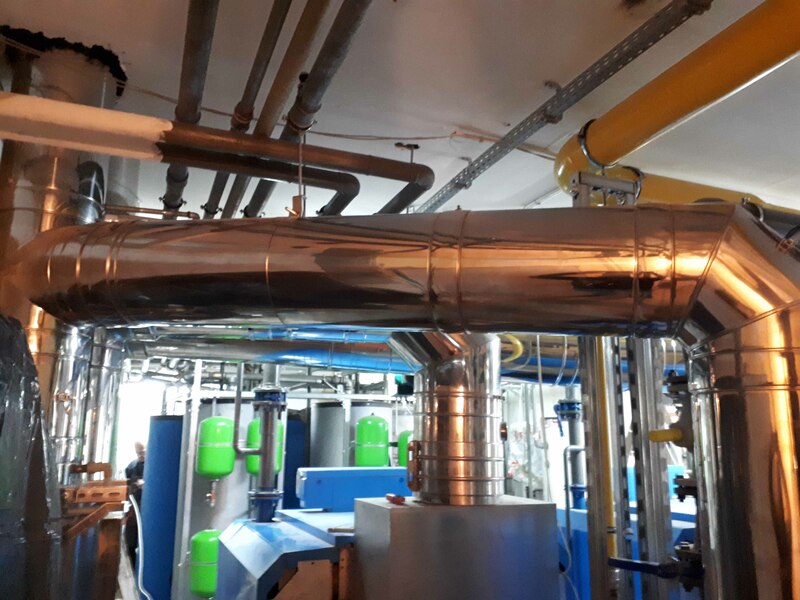 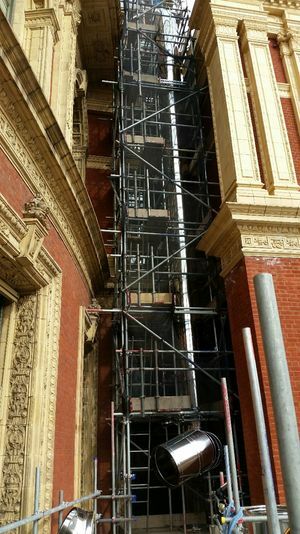 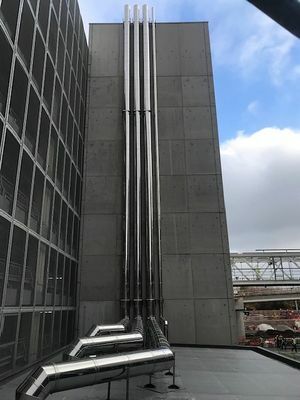 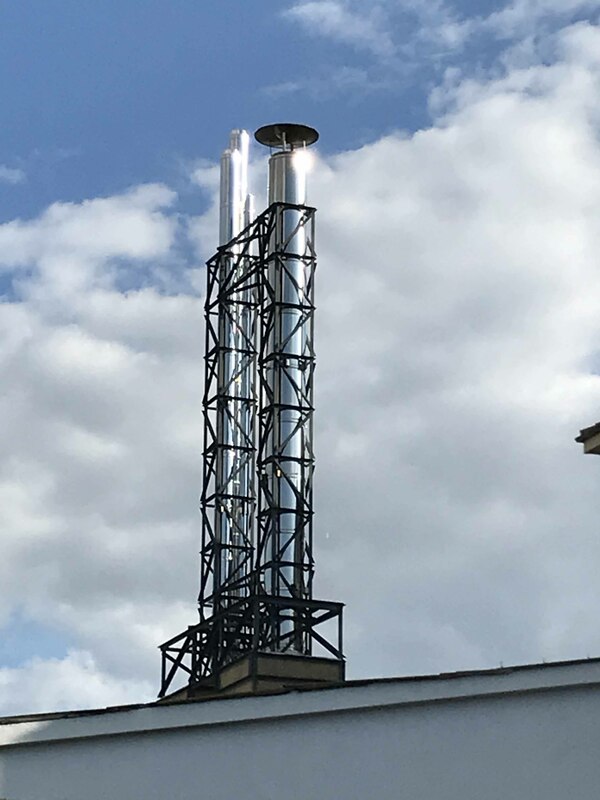 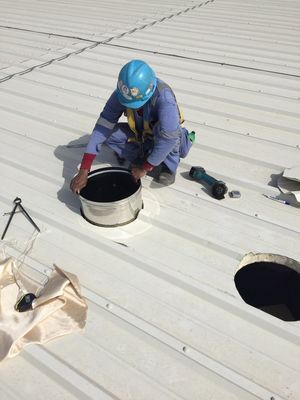 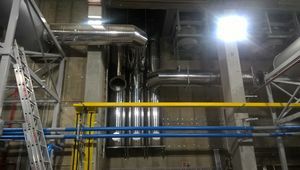 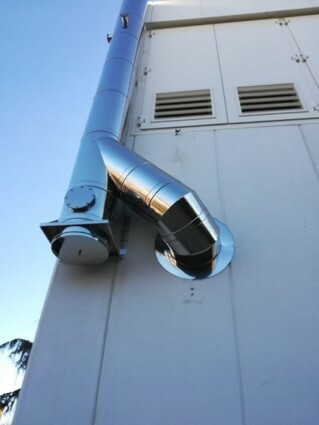 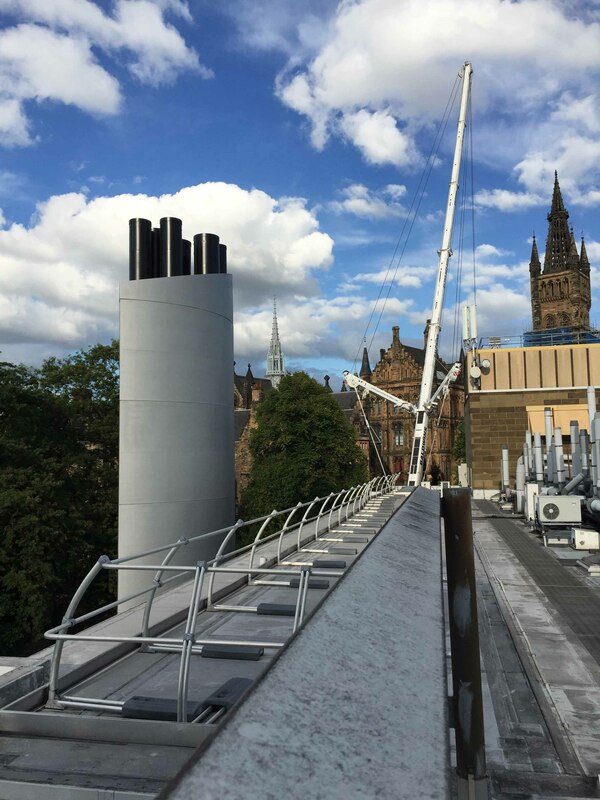 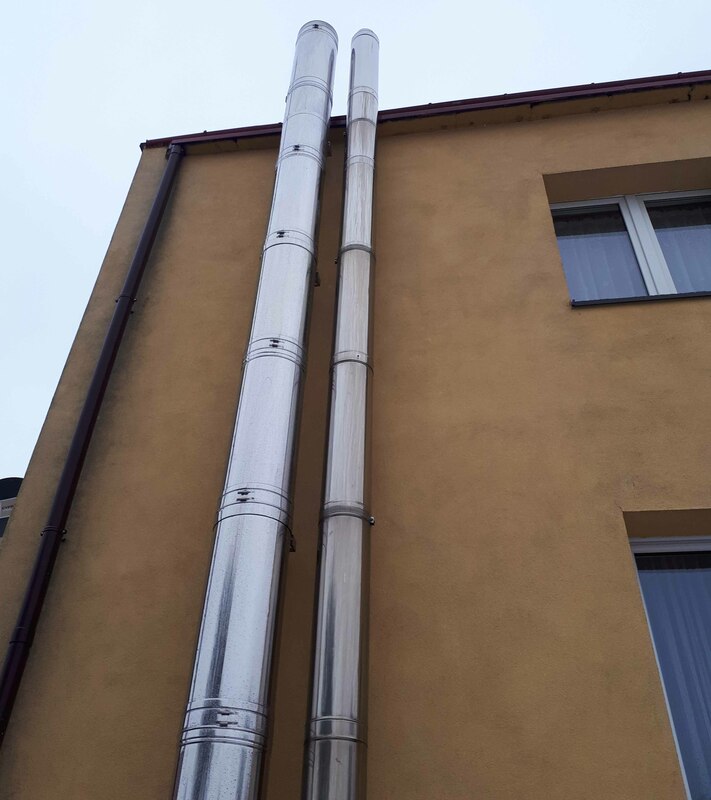 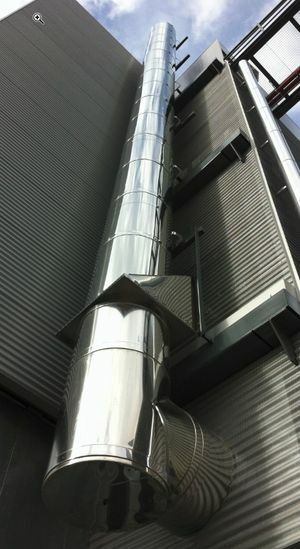 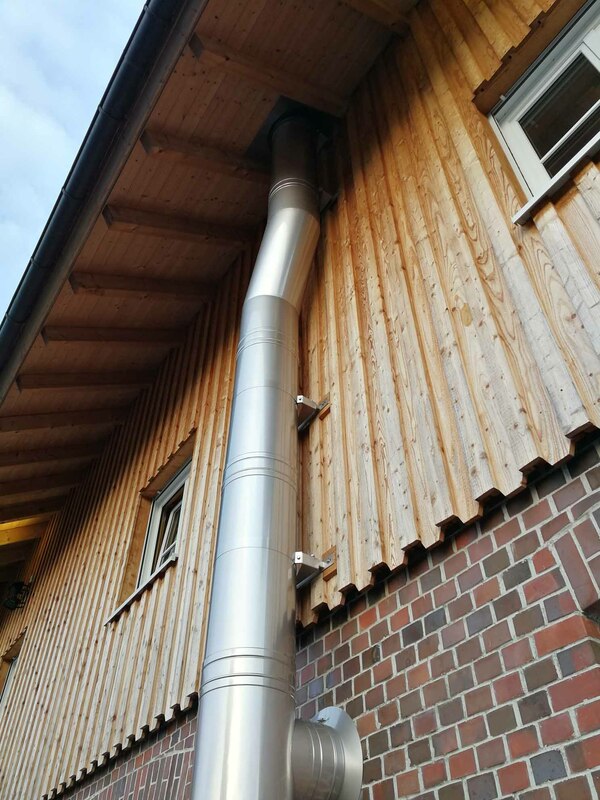 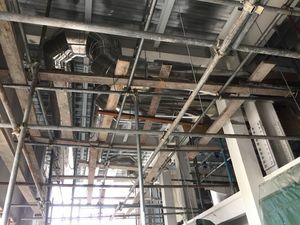 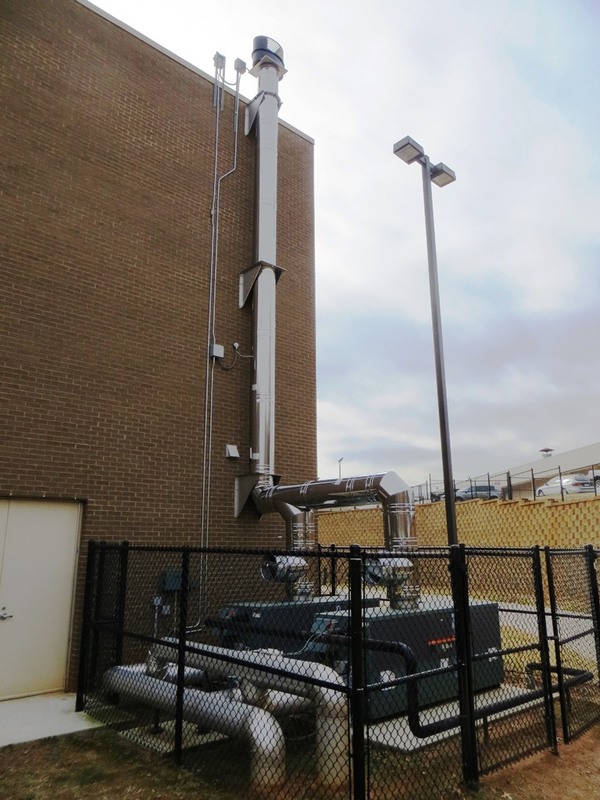 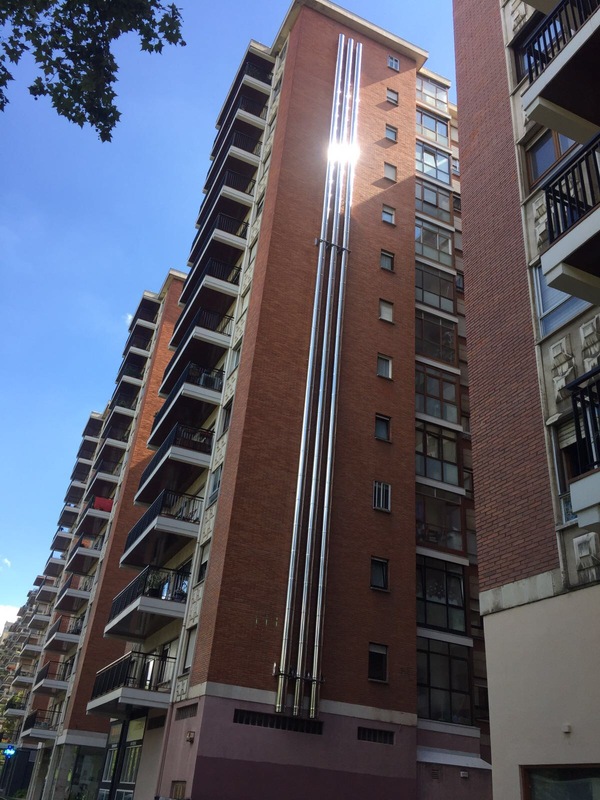 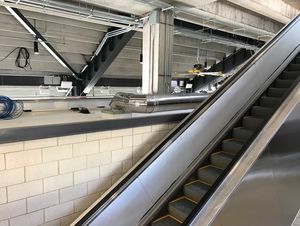 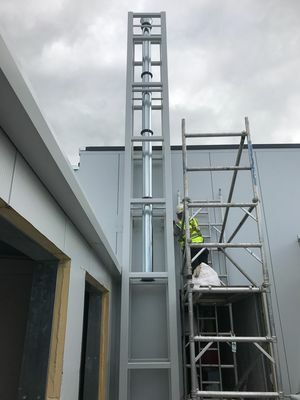 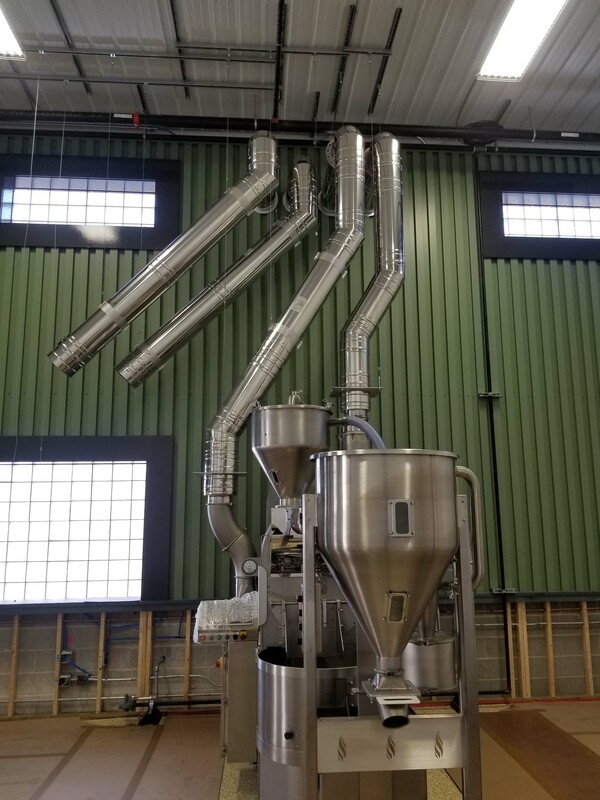 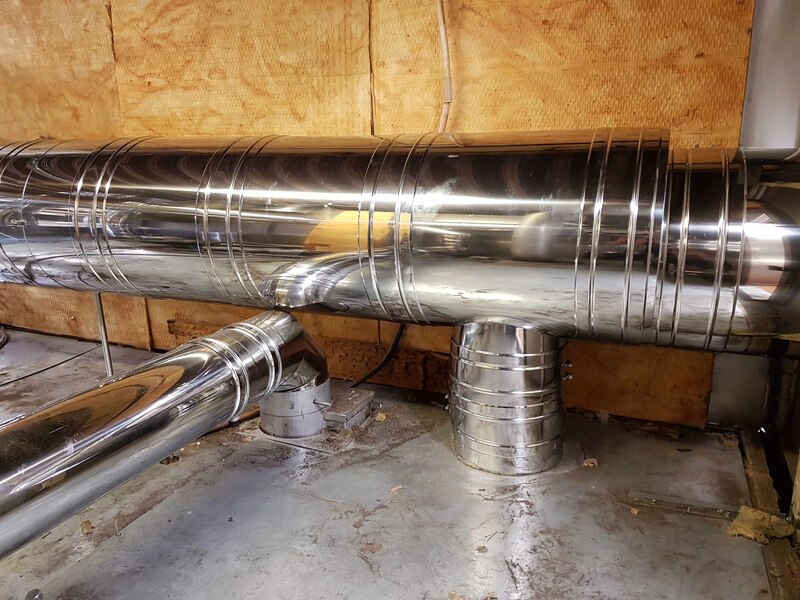 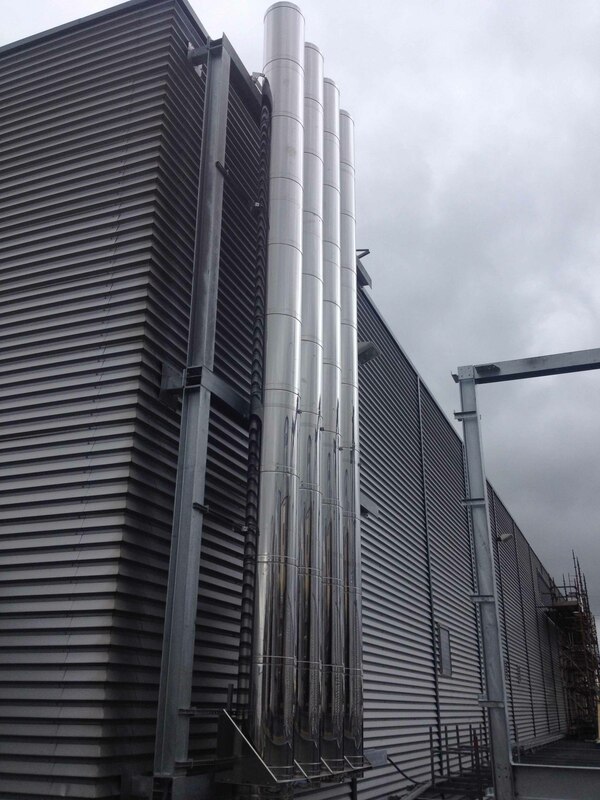 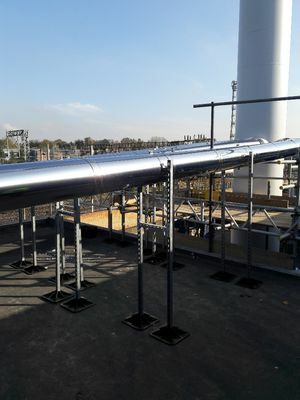 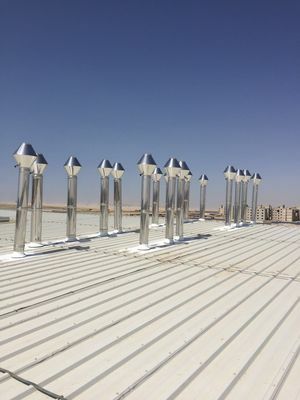 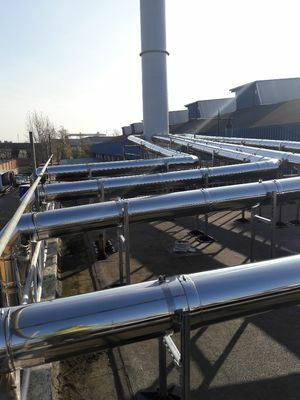 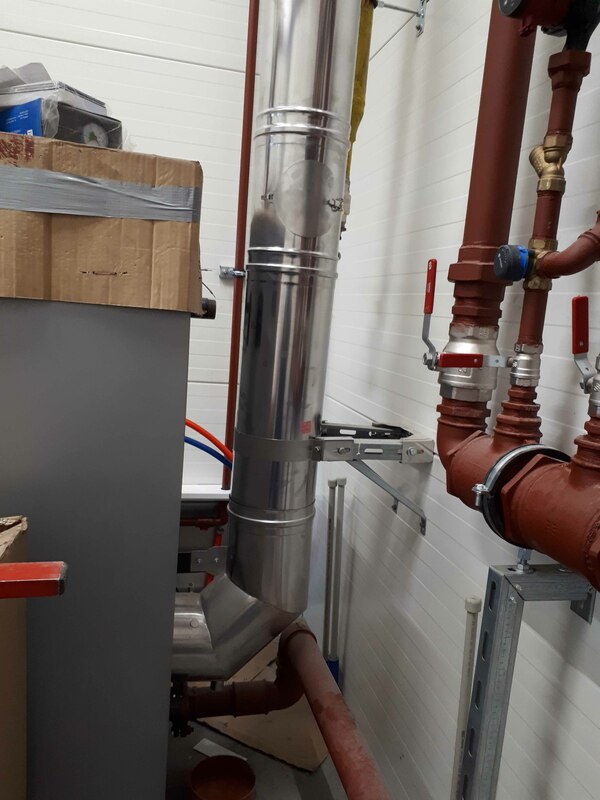 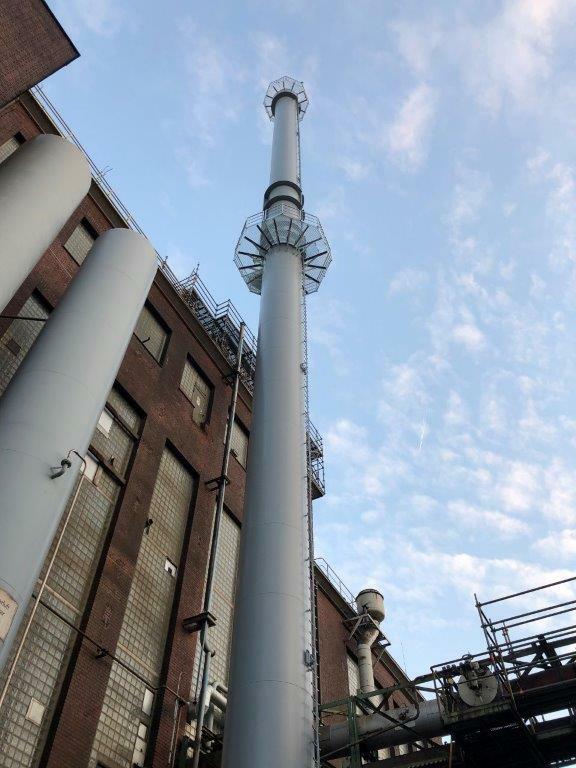 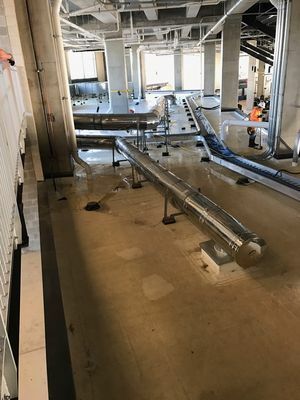 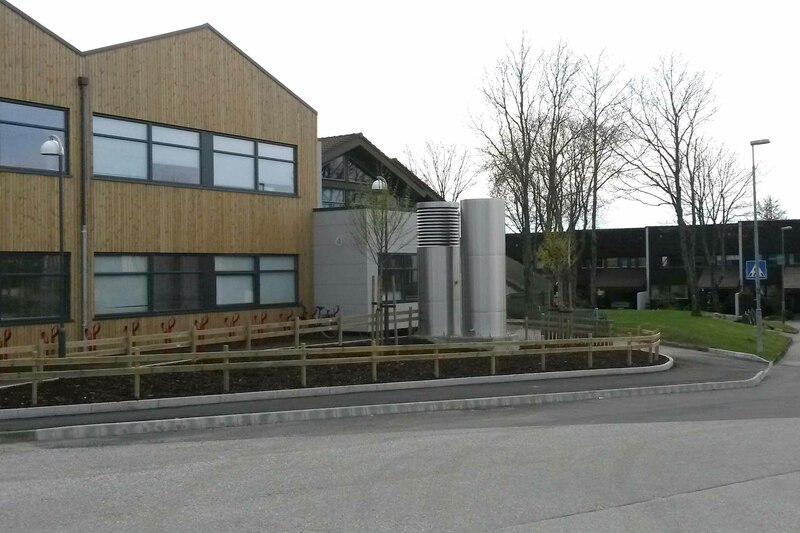 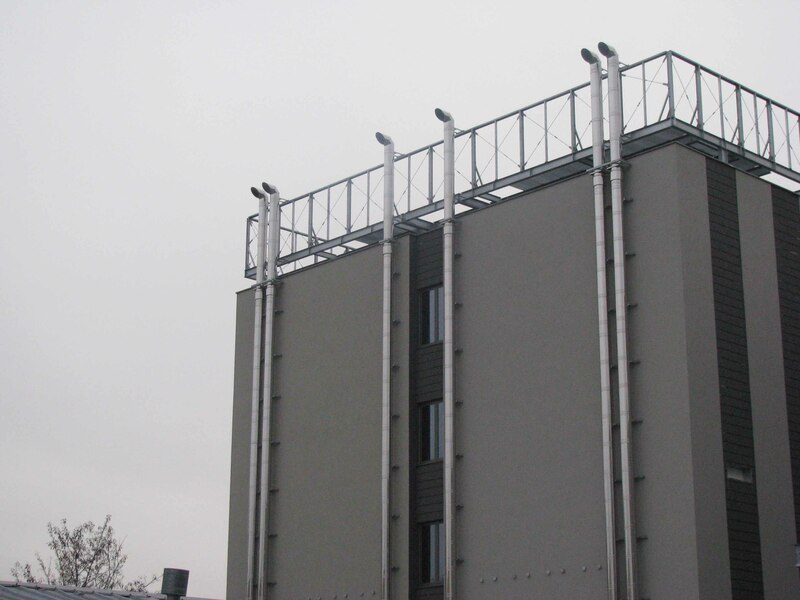 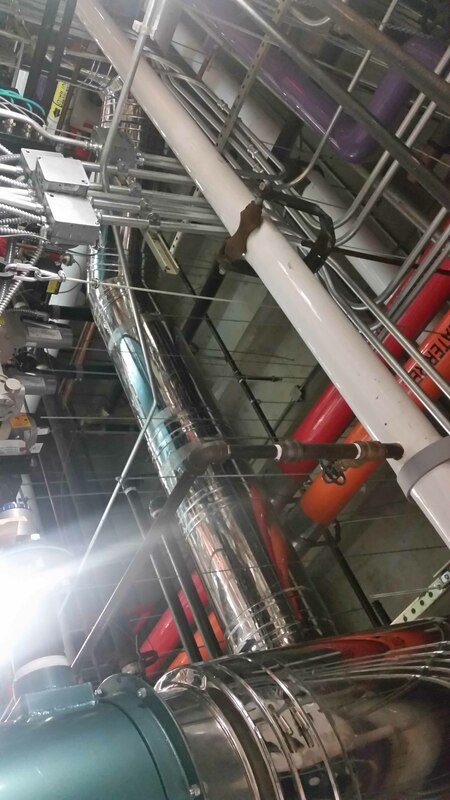 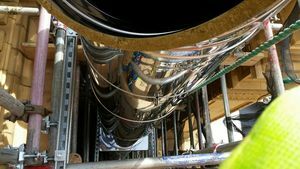 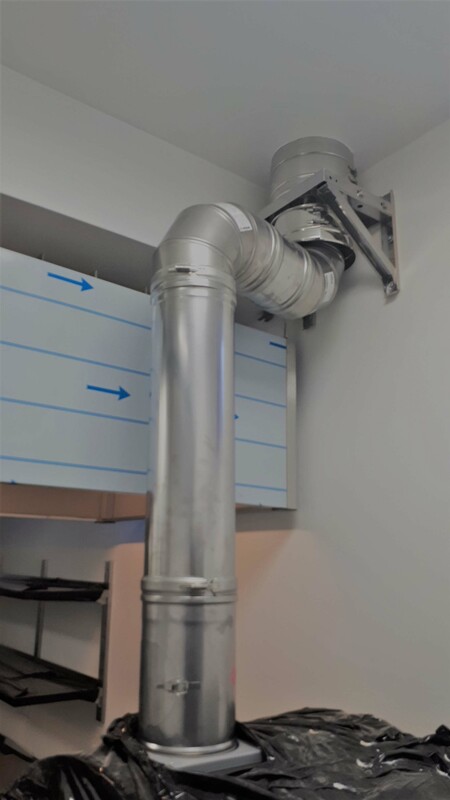 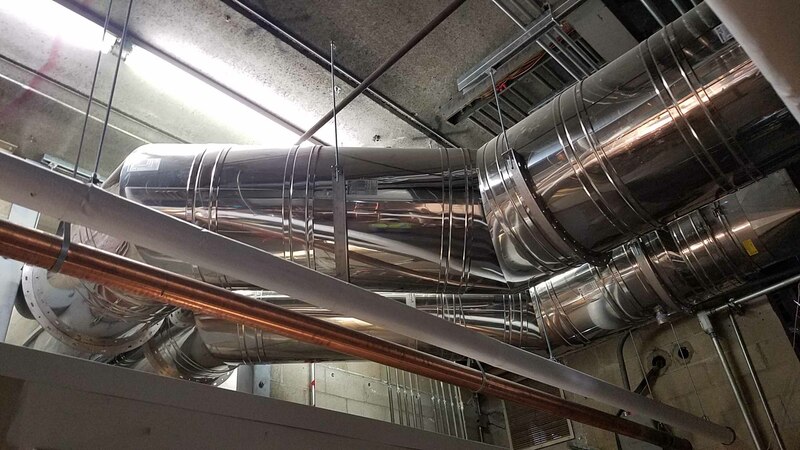 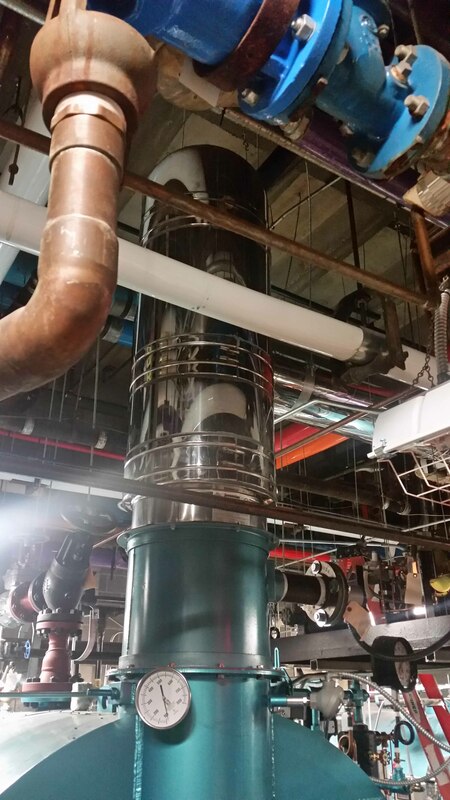 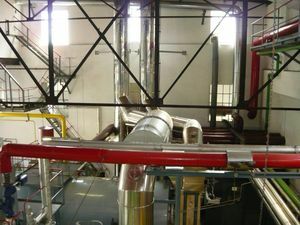 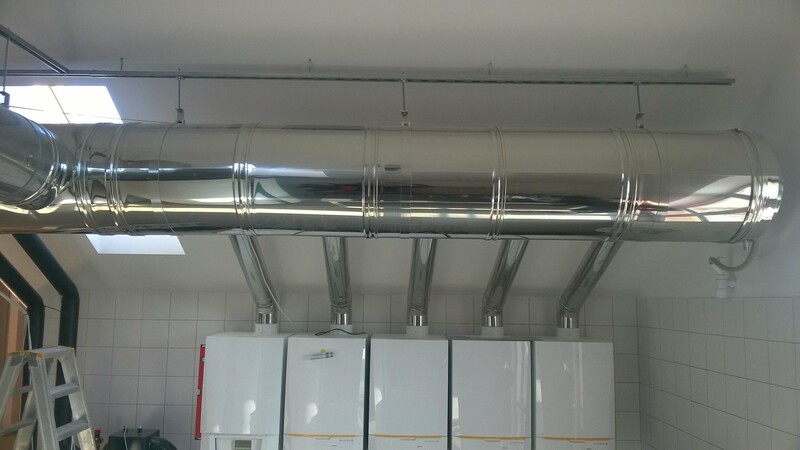 Due to lack of space, the bypass chimney was placed on a steel structure, introduced from below and provided with sound insulation.